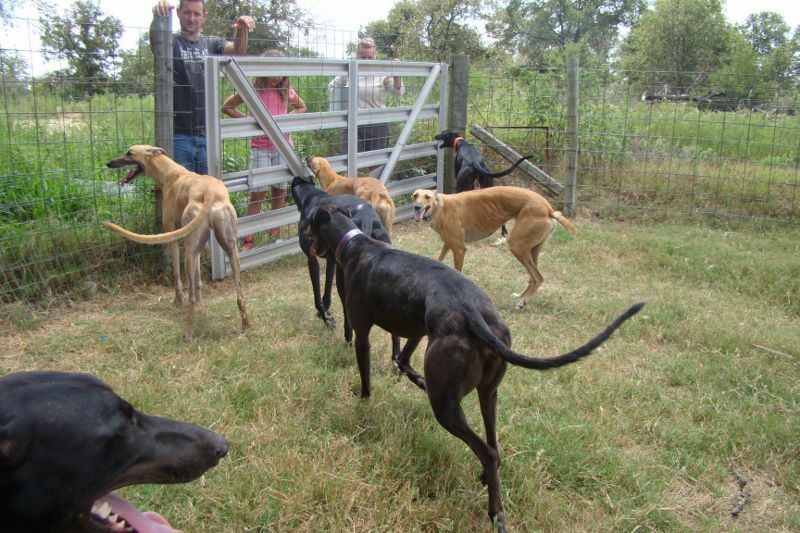 Due to the amount of Greyhounds that have been adopted from Bexata, we have had to move ADOPTED GREYHOUNDS to a third page. Click the link to see more. 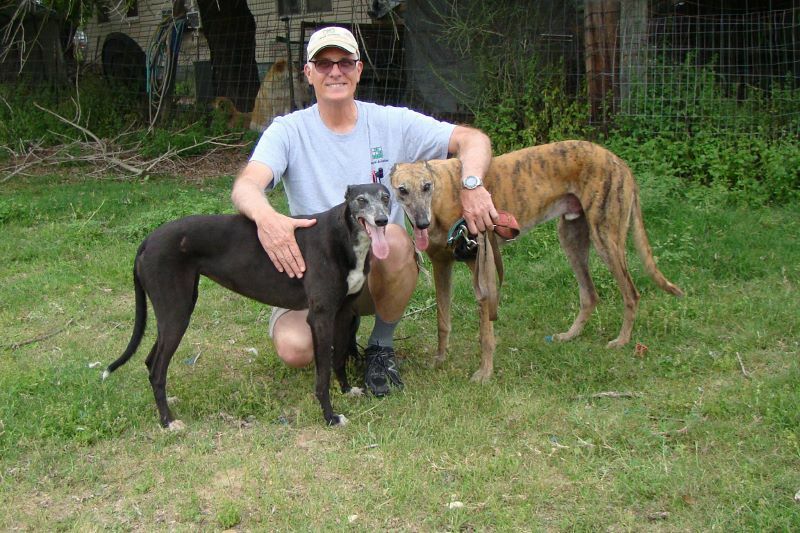 ADOPTED GREYHOUNDS CONT. If you email bexataanimalsanctuary@yahoo.com or sanctuaryemail@yahoo.com and do not receive a reply, please check your spam folder. 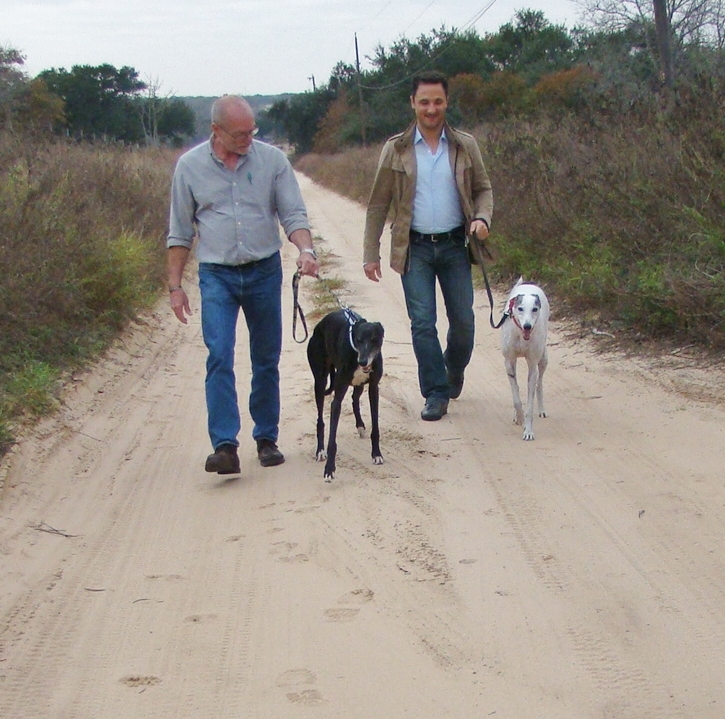 We always reply to inquiries about adopting our Greyhounds. 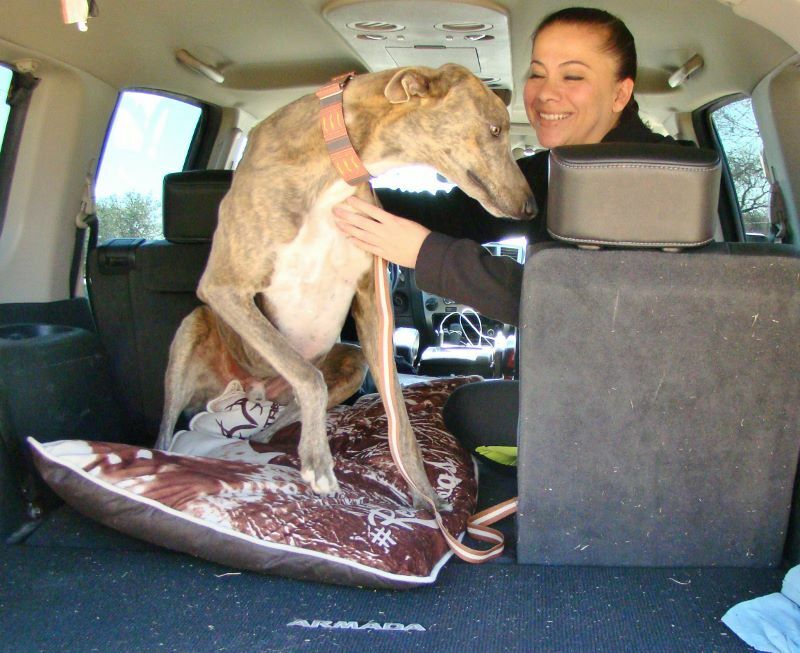 PLEASE DONATE TO OUR RESCUE TO HELP MORE GREYHOUNDS FIND WONDERFUL HOMES. CLICK THE DONATE BUTTON BELOW. ANY AMOUNT IS APPRECIATED. 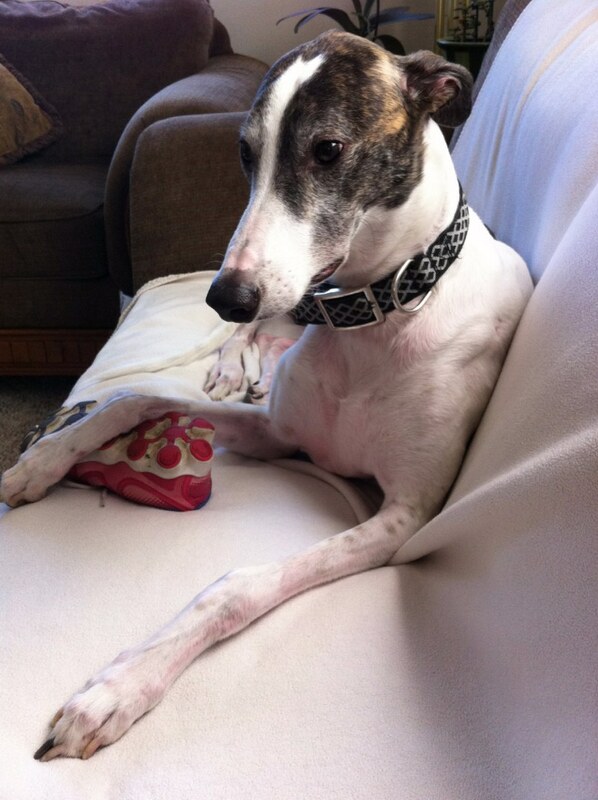 Pretty Phoebe Clark - Greyhounds love leather couches. 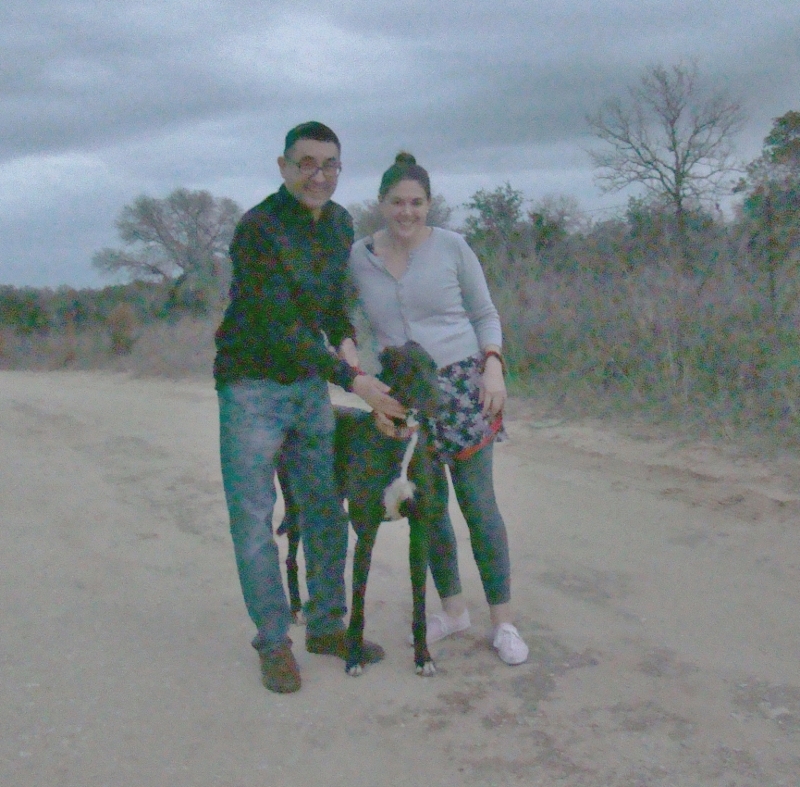 February 1, 2019 Amanda and her dad came to pick up Amanda's boy, Fury. 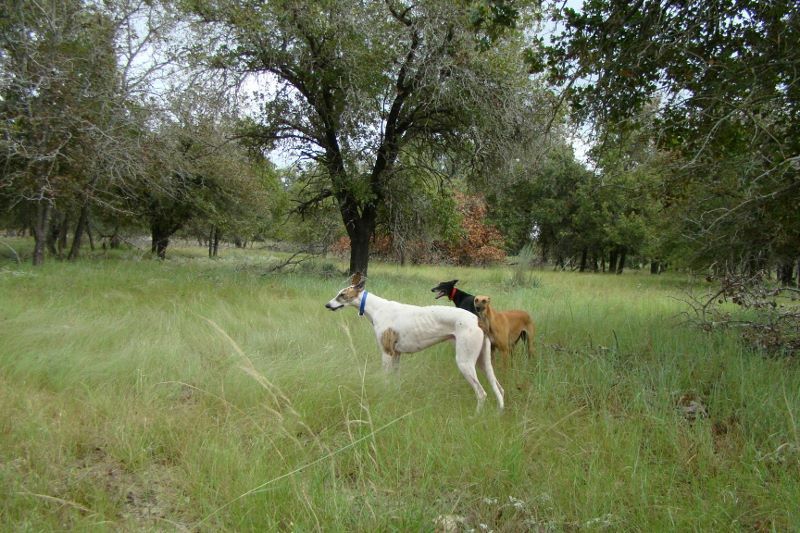 Fury spotted a rabbit across the pasture. 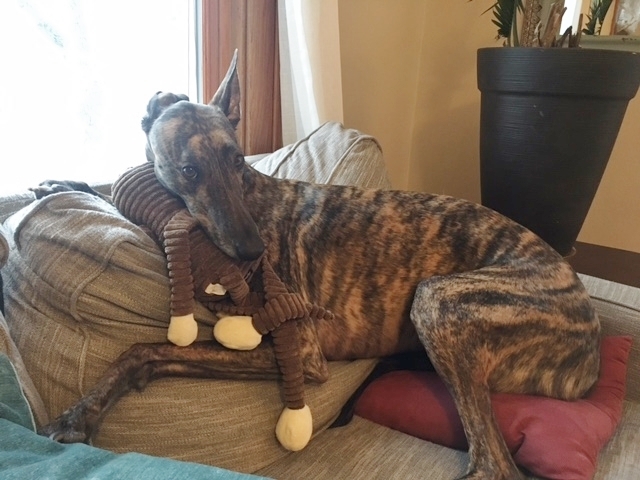 HAPPY BIRTHDAY LOGAN - laying on the couch that has become his toy and will now be replaced. 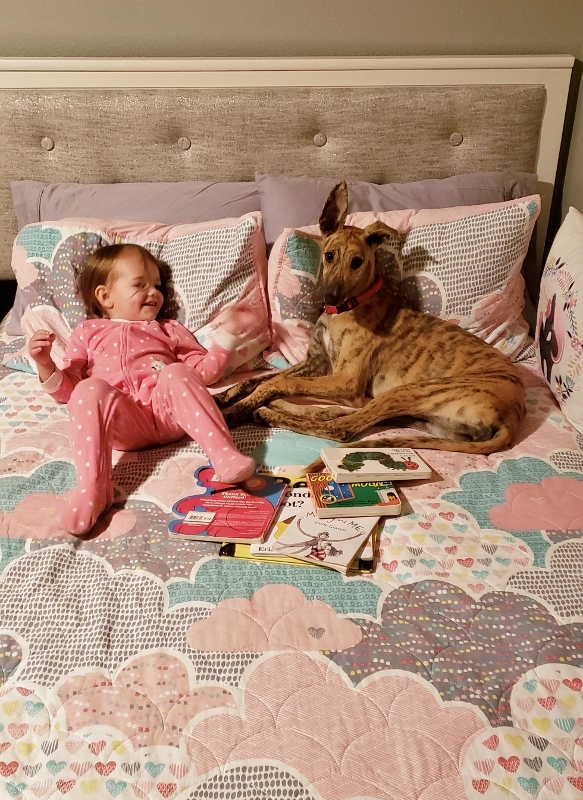 Beth and TBB - "to love and be loved in return"
January 29, 2019 Phoebe Clark at six months old. 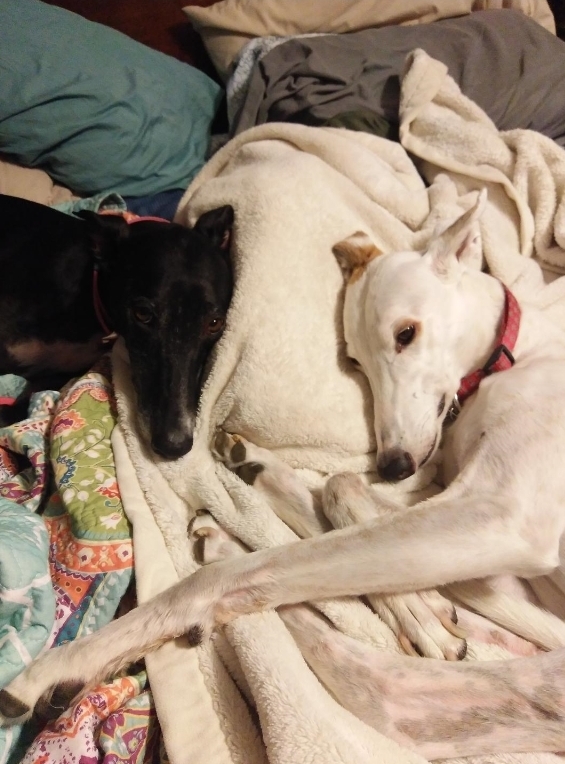 When Phoebe isn't out playing, she's in bed with her best gir, Emerson. 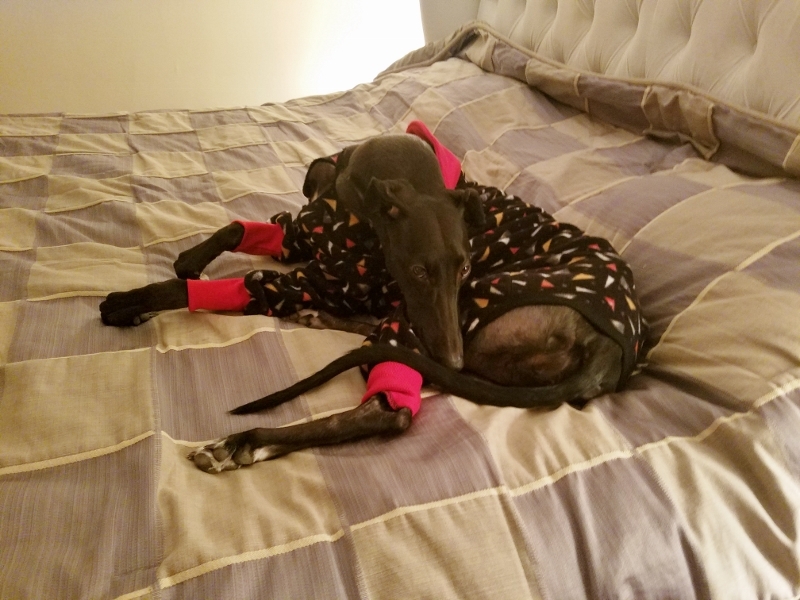 Zelda in her full body pajamas and Daddy's bed. 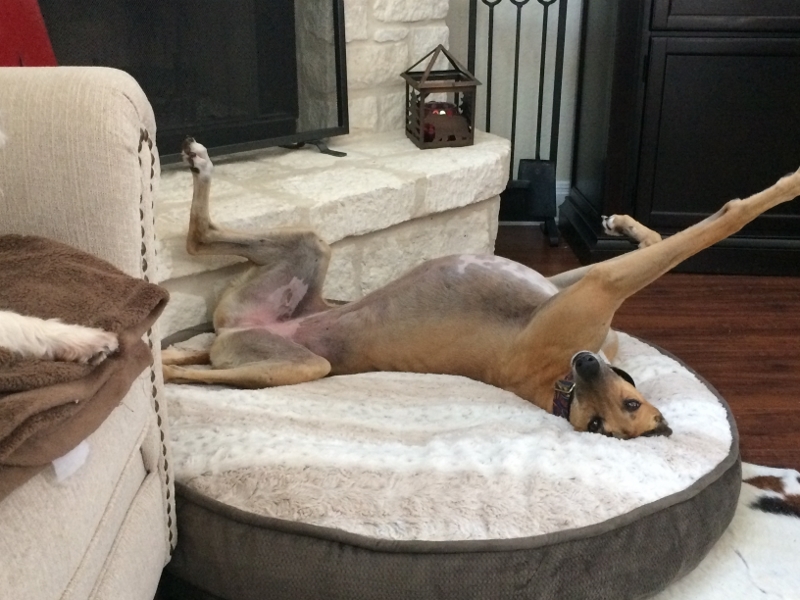 Not too spoiled, is she! 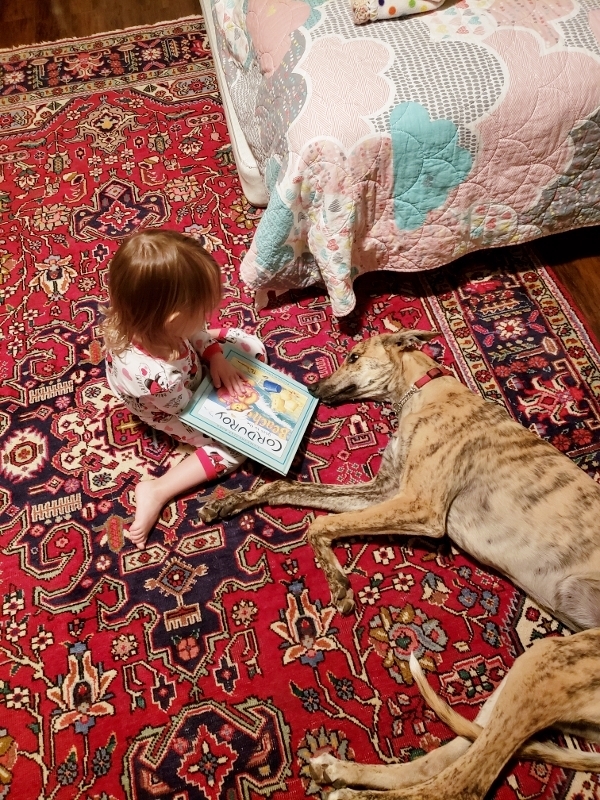 Emerson still loves to read to Phoebe at bed time. 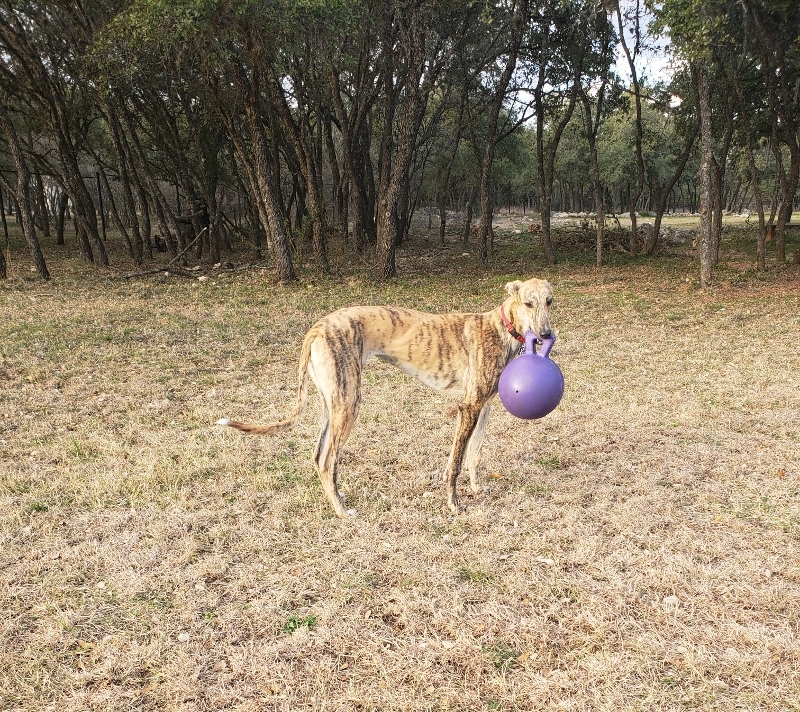 January 19, 2019 Beth and Ty came from San Angelo to take Blue Biscuits home. 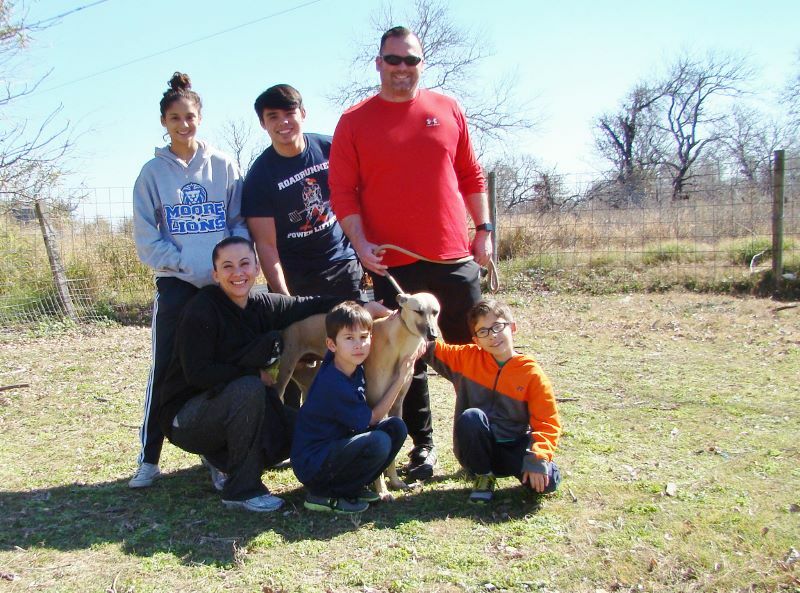 January 13, 2019 Steven came with his family. 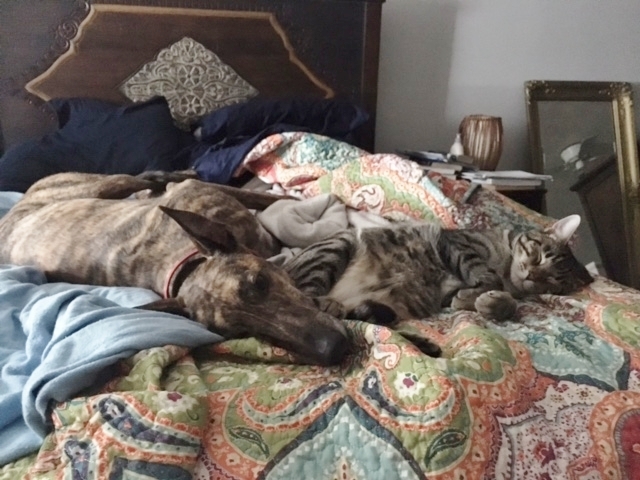 He took Stripes home and she's taken over the bed! 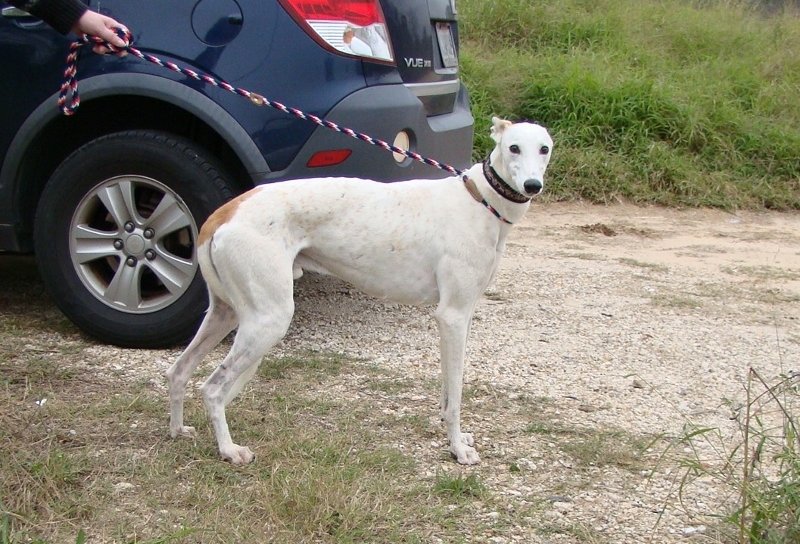 Stripes is Steven't first dog, although he was caretaker of the family dogs when he lived at home. 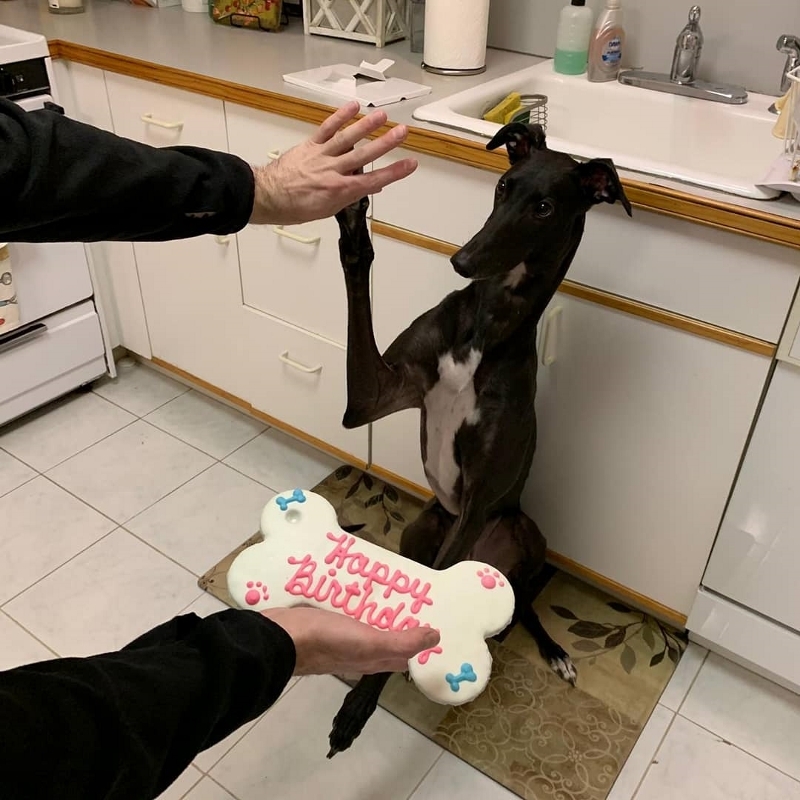 January 13, 2019, Amanda came out with her Greyhound and they chose Fury. 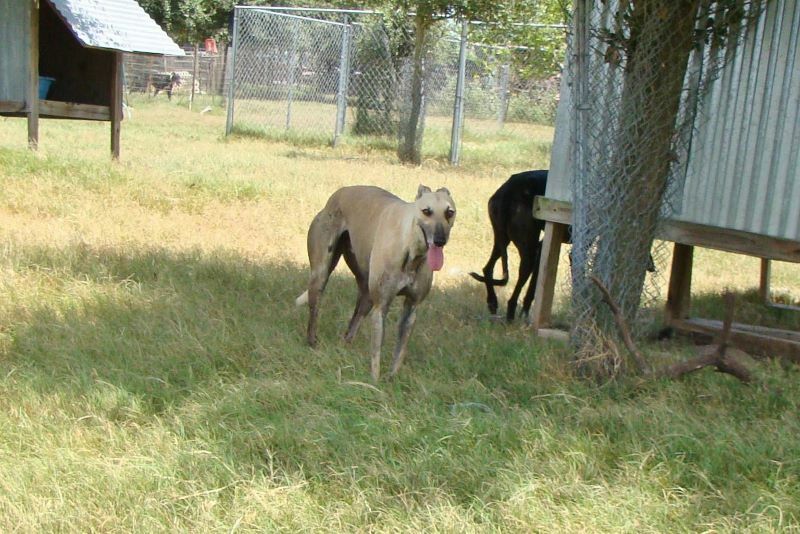 Fury's on the left. 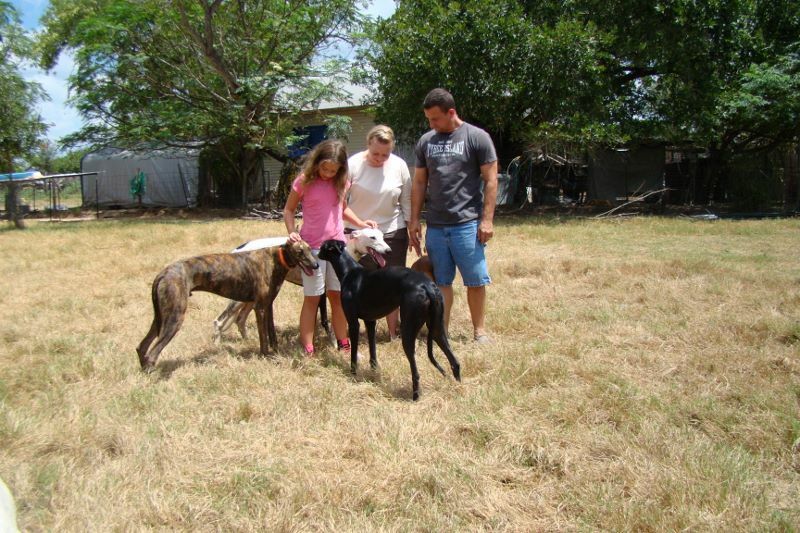 The Saenz family and Fury. 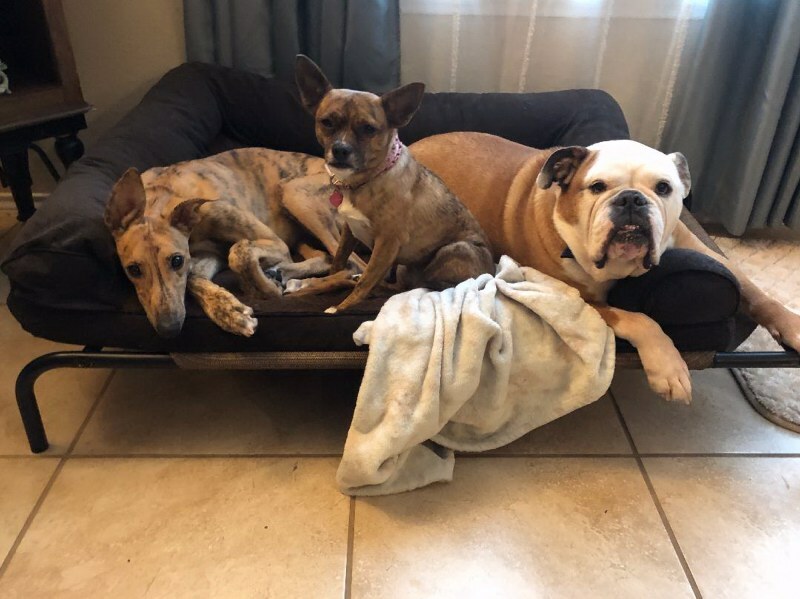 November 26, 2018 Presley, Shenzi and Tank share the same bed, although they each have their own. 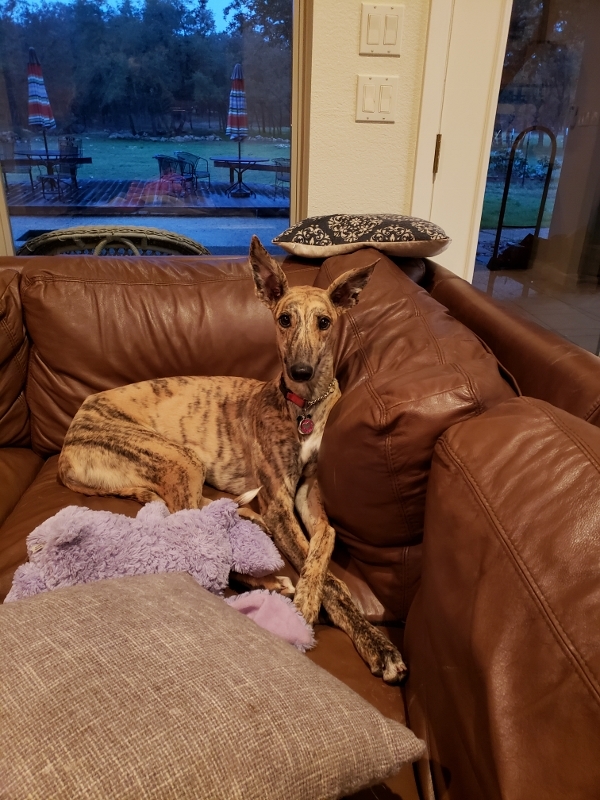 November 20, 2018 Phoebe loves "her" leather couch! Logan in Puerto Rico learning to countersurf. 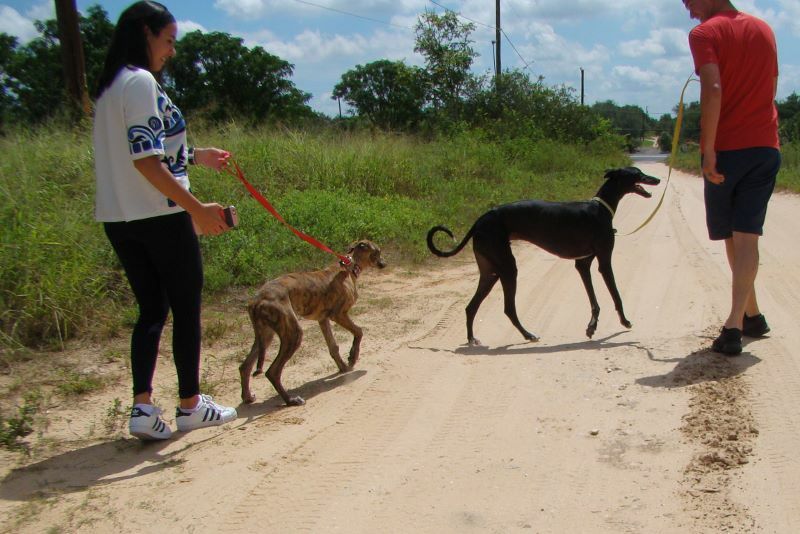 Bille Joe was found with his litter and Socorro adopted him. 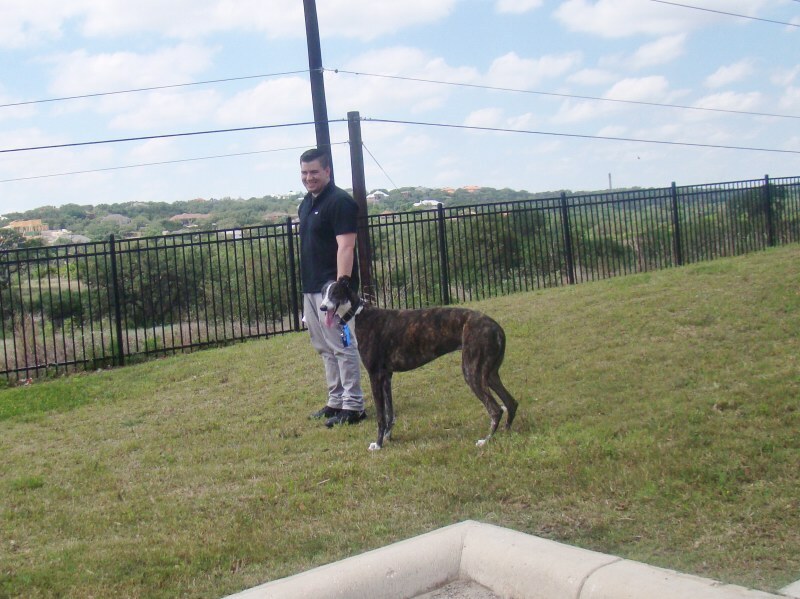 He's the little brindle boy. Talk about a happy ending! 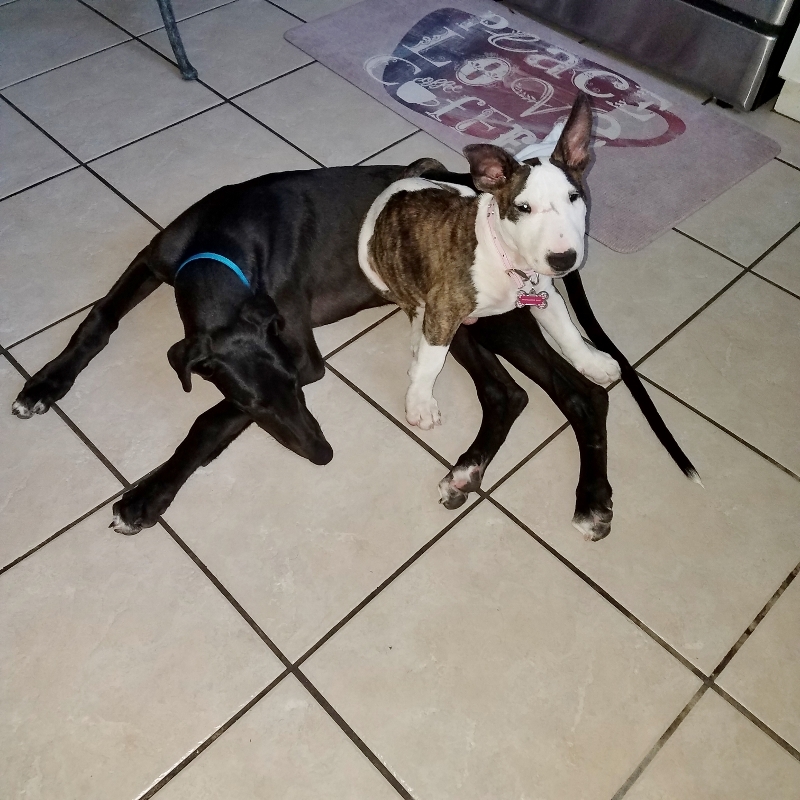 November 9, 2018 all the puppies are adopted with the last two, Pepper and Vanilla, leaving for their new homes Monday. 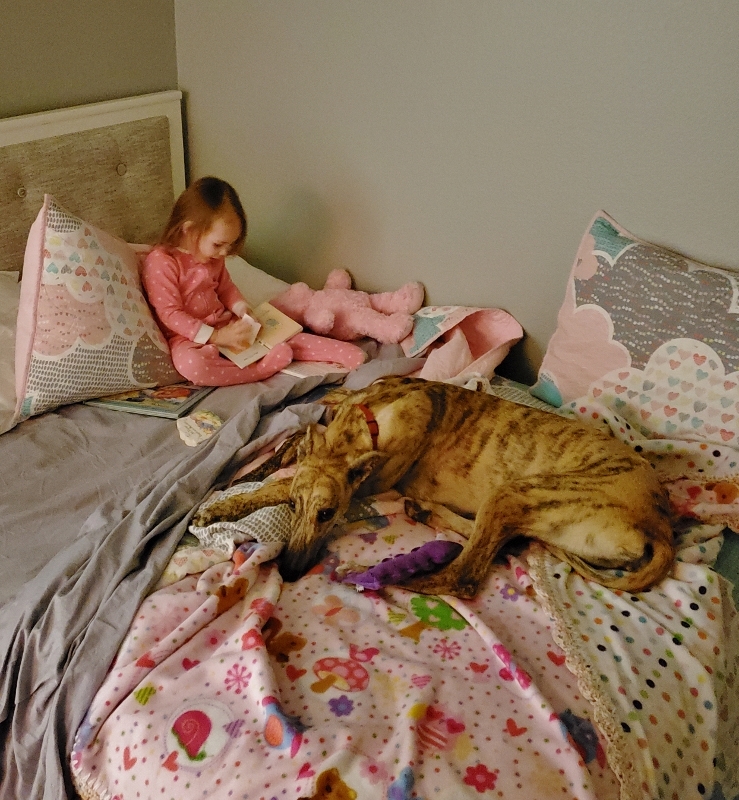 November 4, 2018 Emerson and Phoebe share bed time stories (read by mom) before bed time. Phoebe's a wonderful addition to the household. 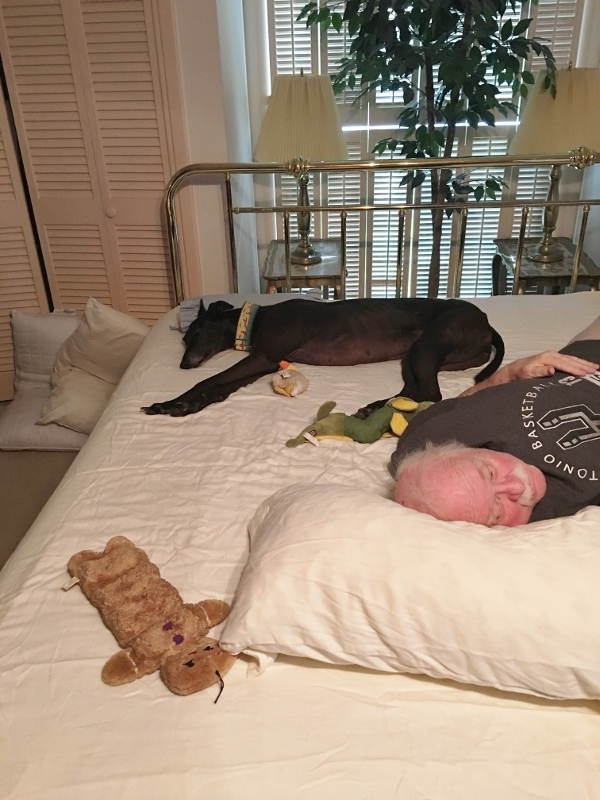 October 31, 2018 after an hour walk with her Dad, Paul, Zelda crashed out on the bed. Happy Halloween from Superman Alfredo Grizzard! 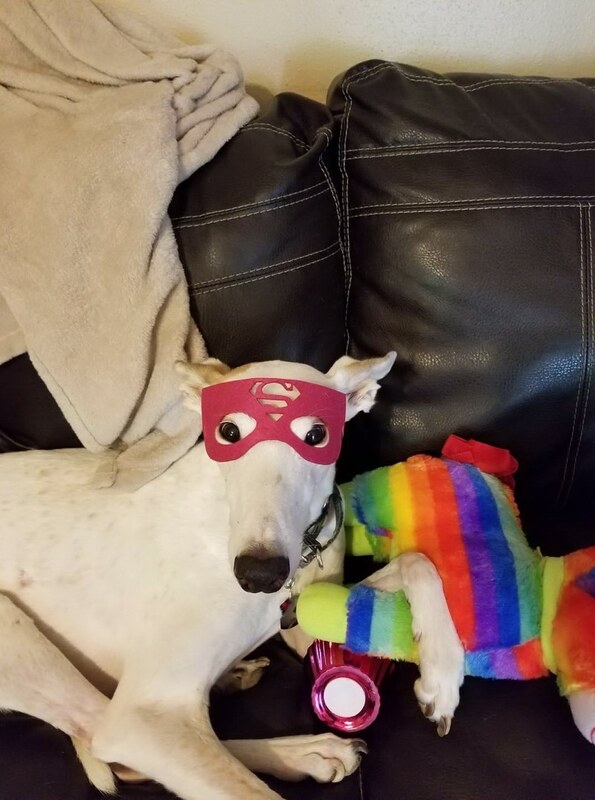 After a night of trick or treating, Alfredo and his best girl, Midnight, rest. 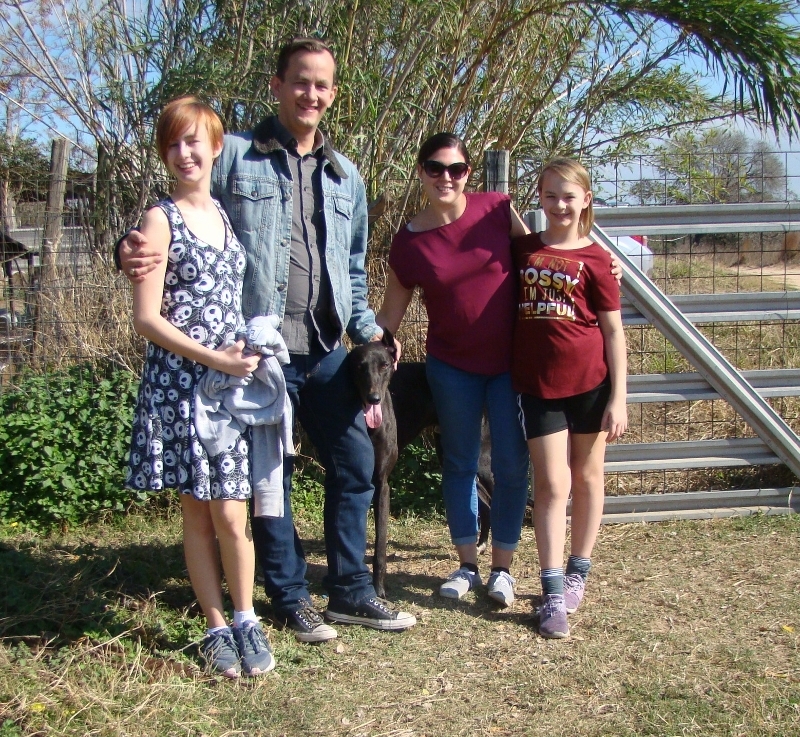 October 25, 2018 Phoebe went home with the Clark family. 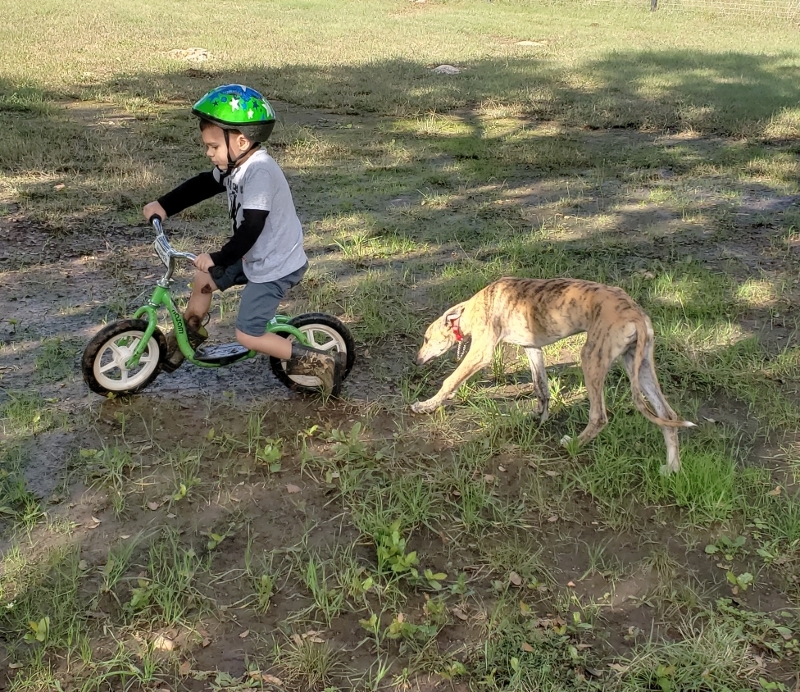 Here she is following her best boy Andy. 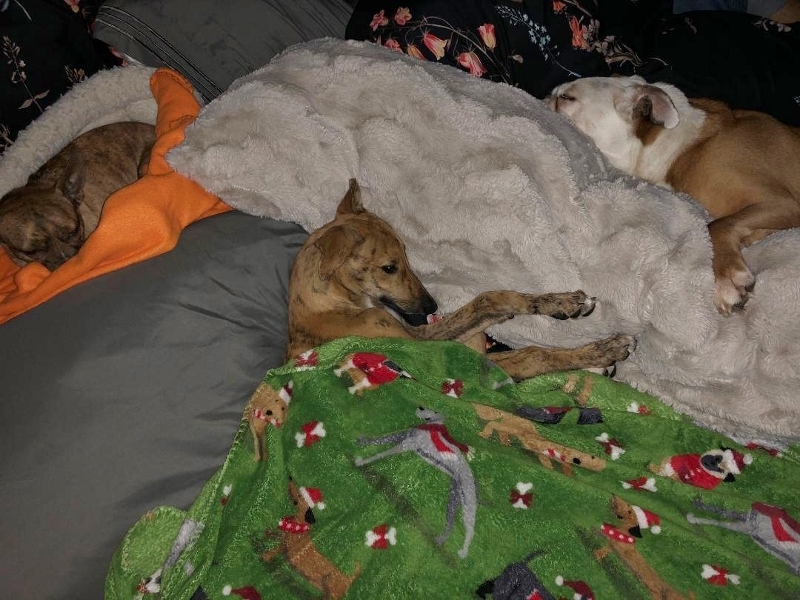 ...this was everyone snuggling in bed this morning...ALL refusing to get up to potty and pretending they couldn’t hear me haha! 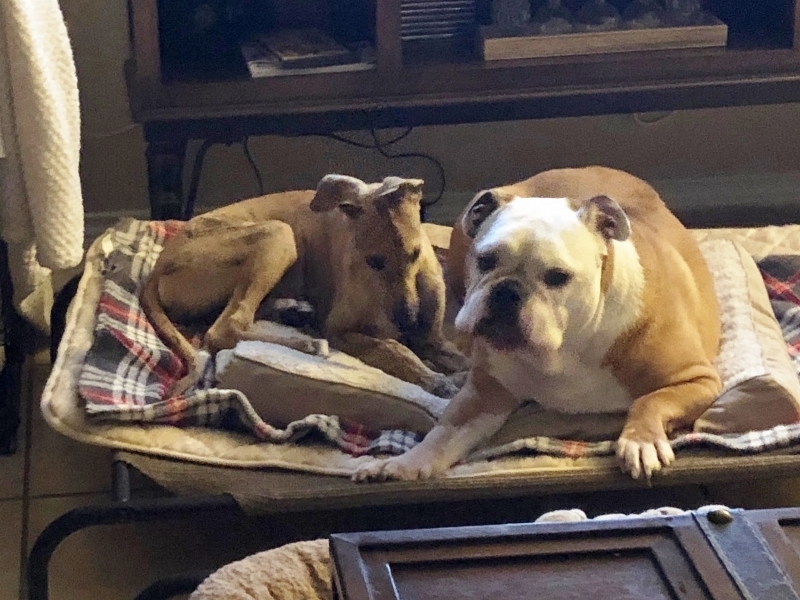 October 12, 2018 Presley and Tank share a bed by choice. 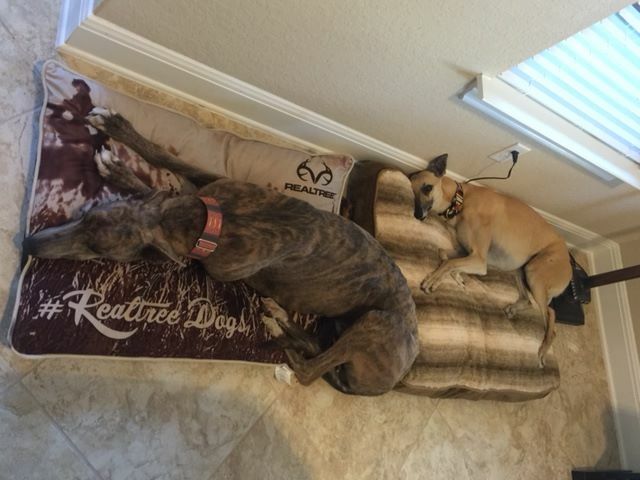 Amanda and Justin's kids Cookie and Avalanche doing what Greyhounds do best! and Handsome is as handsome as ever. 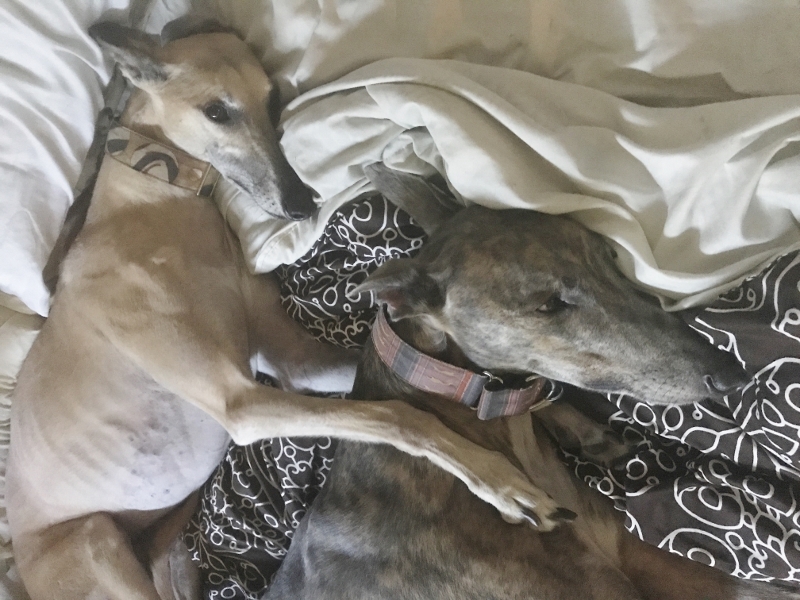 Olive and Walter together on the bed. Doing great! 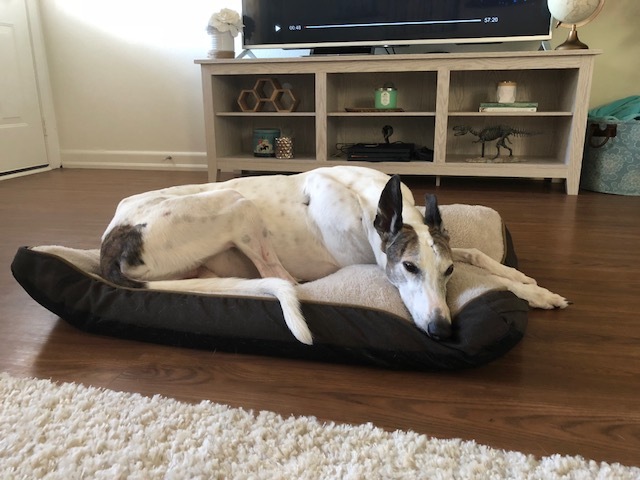 August 26, 2018 Olive, formerly Blackish, is enjoying her new bed in her new house. 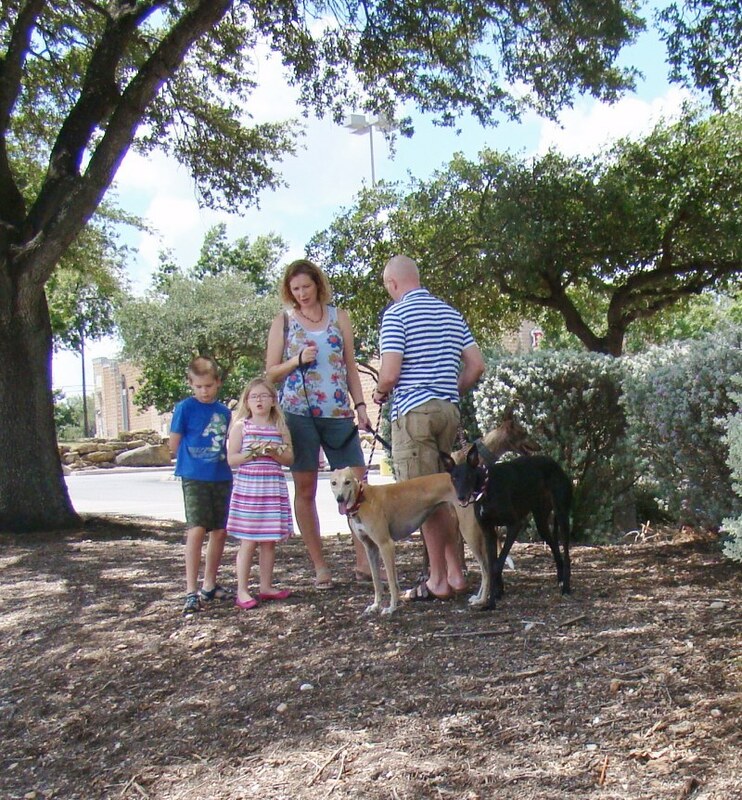 Olive with her new family. 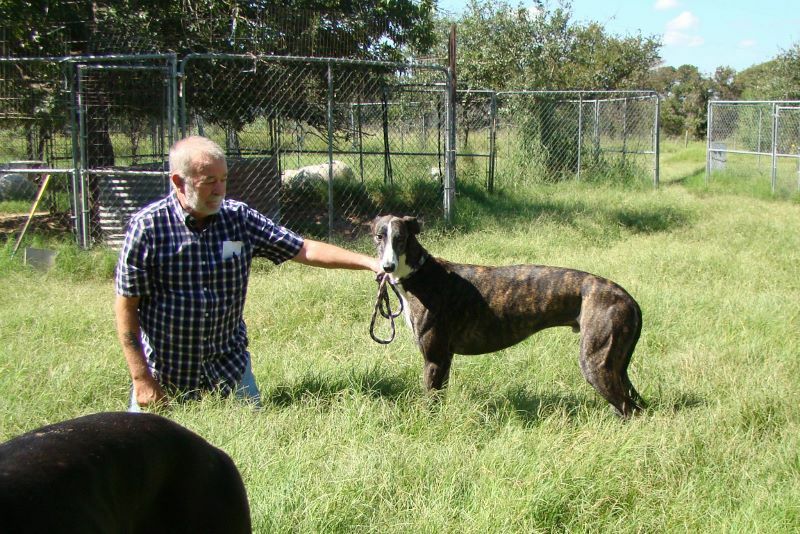 The big brindle, Walter is the Marsh family GH. 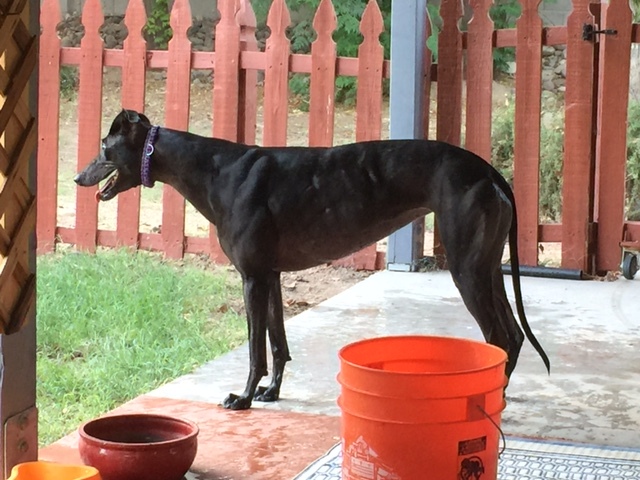 The chose Olive (formerly Blackish) to become a new family member. 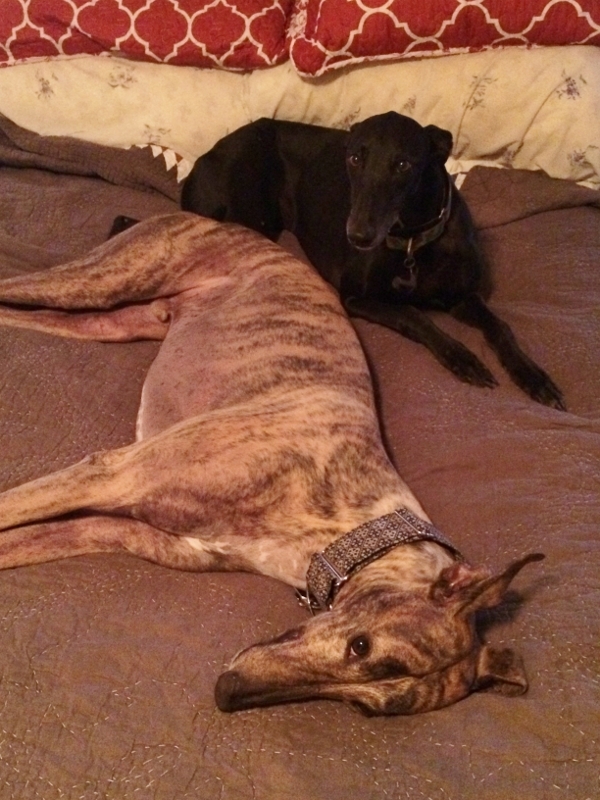 Misty at home with her buddy, Zeppo. 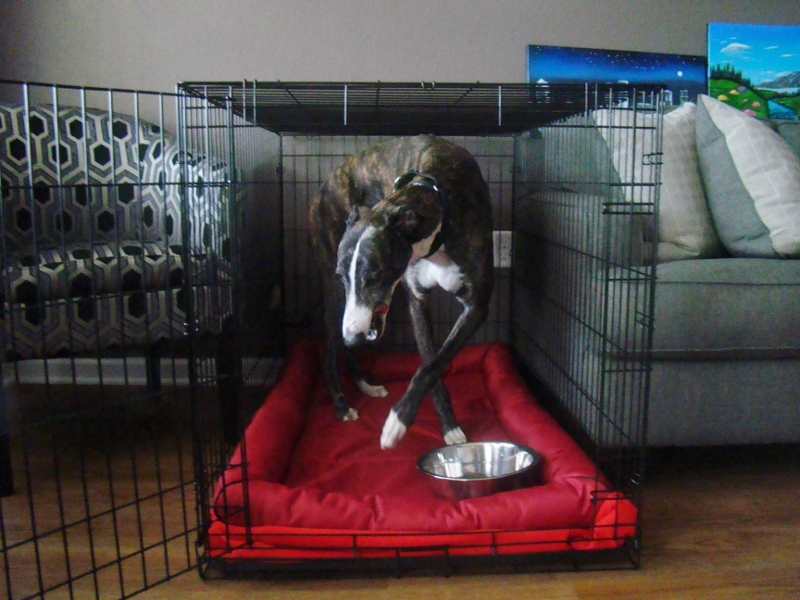 August 7, 2018 he's crashing in her kennel althoug he has one of his own. 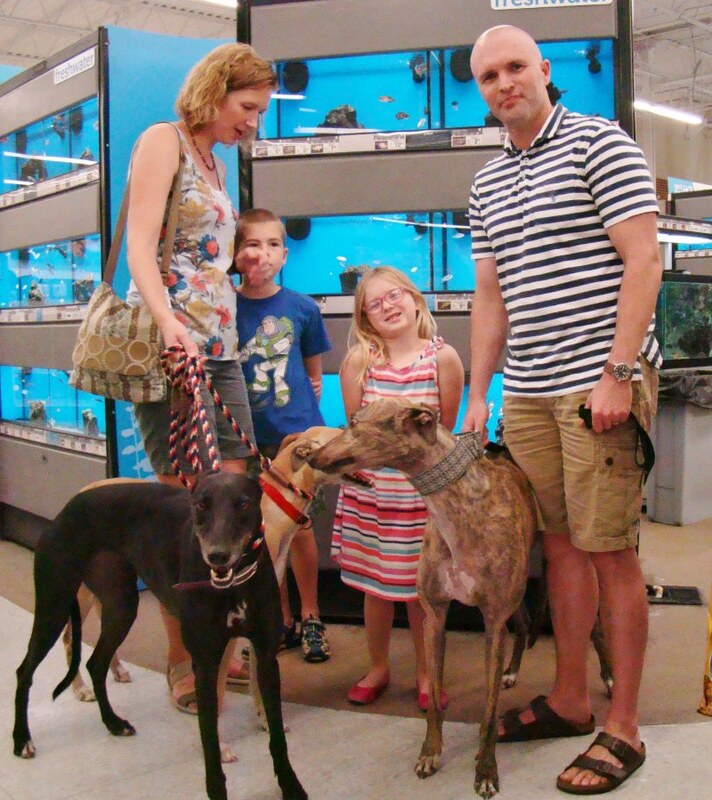 The lovely (black girl) Misty was adopted by the Koger family and their IG, Zeppo. At home enjoying the couch when she's not on the bed or in the baby pool. 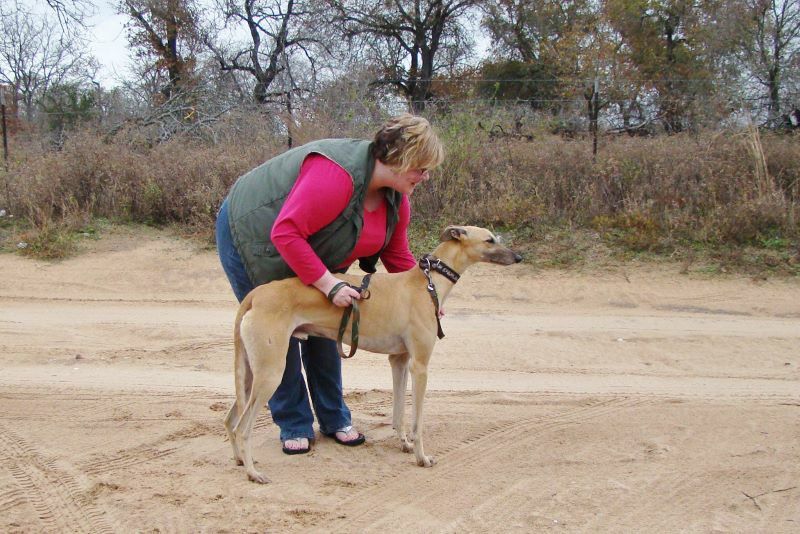 Miss Daisy has it made and is adored by Becky and vice versa. 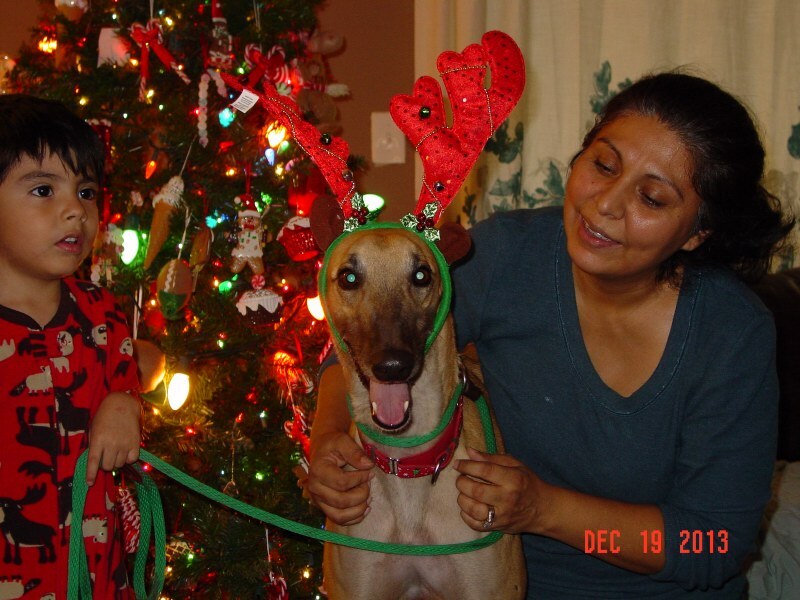 April 29, 2018 Daisy Woloshen and her mom, Becky. 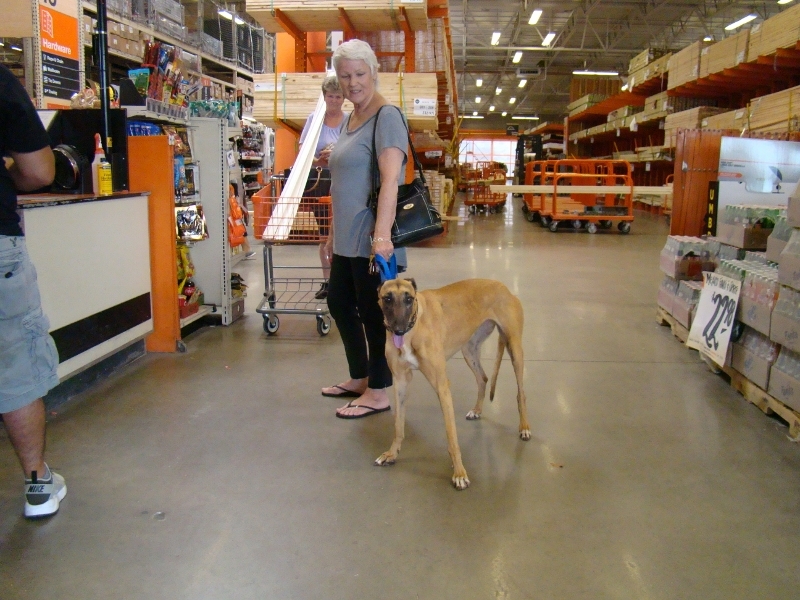 with Rebecca at Home Depot. 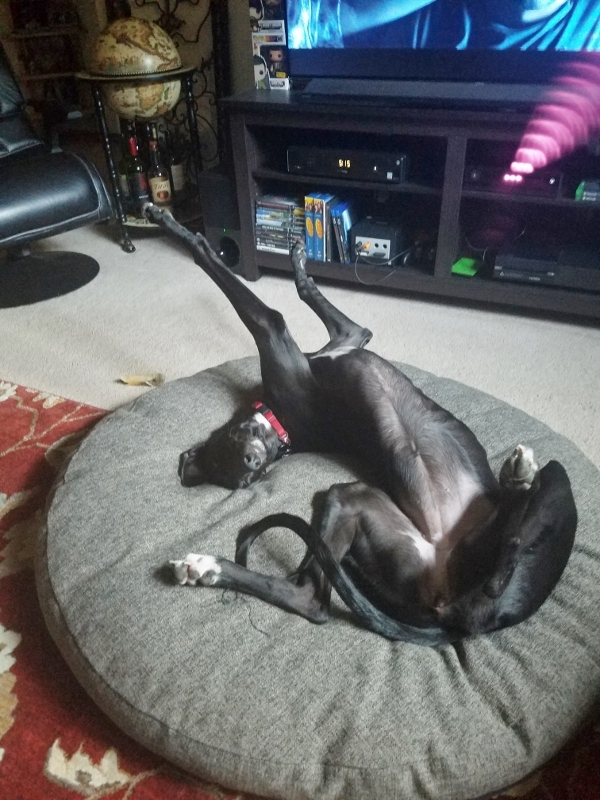 She takes everything in stride. 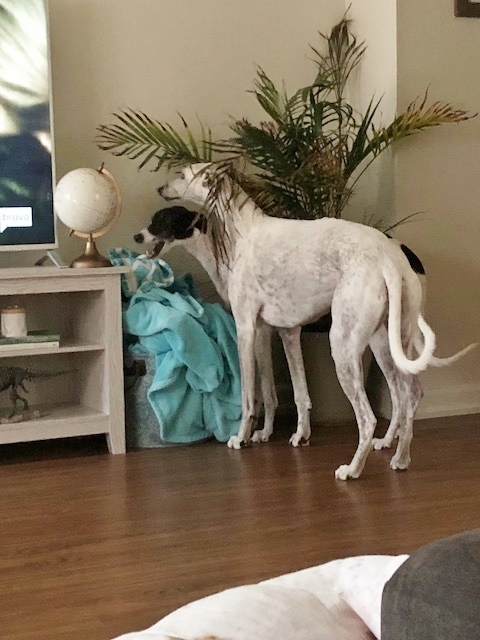 She has her own Furbo so daddy can talk to her and throw treats to her while she's home and he's at work. 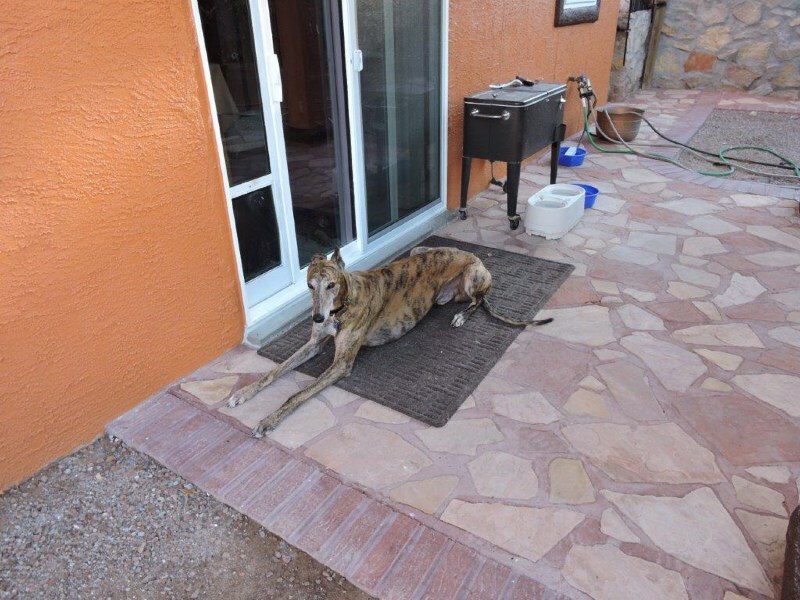 Logan is waiting for his breakfast! 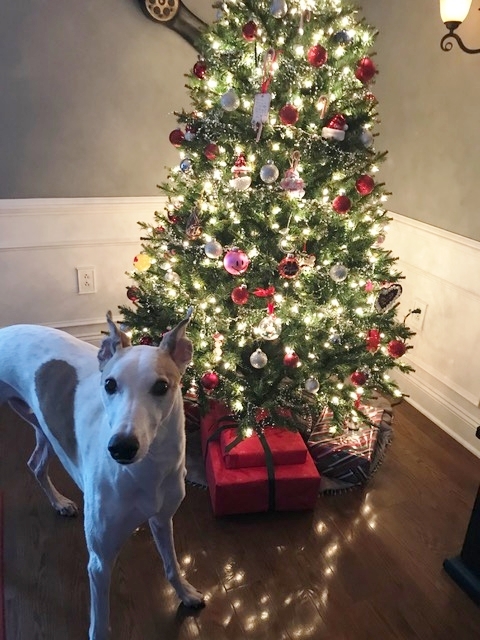 December 11, 2017, the handsome Greyson Stimmel and his Christmas Tree. 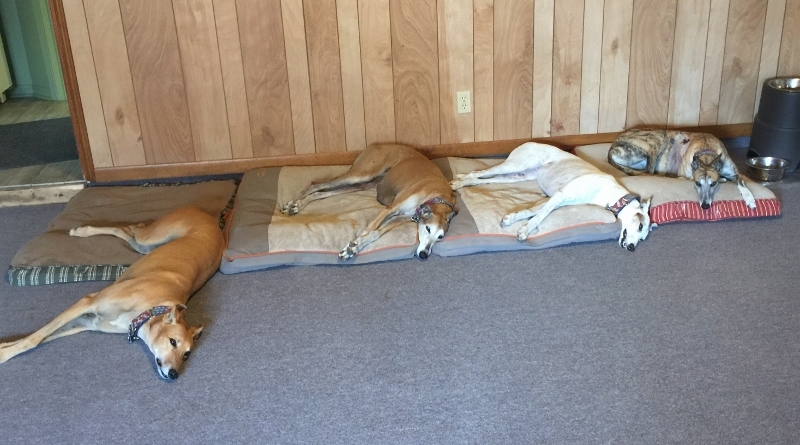 September 20, 2017 thhis is ow Laurie's adopted Bexata Greyhound girls spend their day. 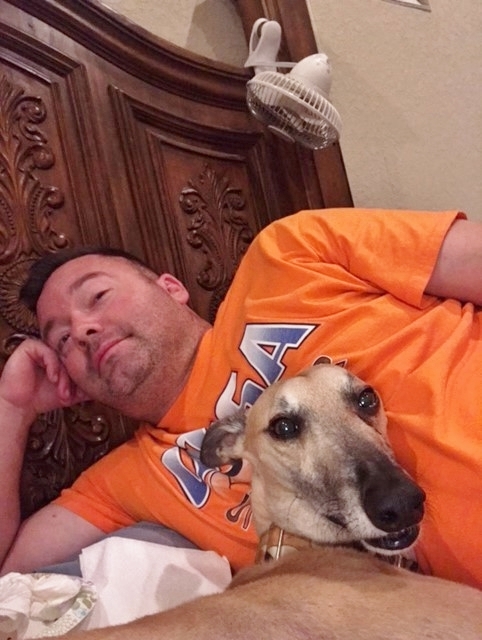 September 18, 2017 Zelda is Paul's very content and secure Greyhound girl. 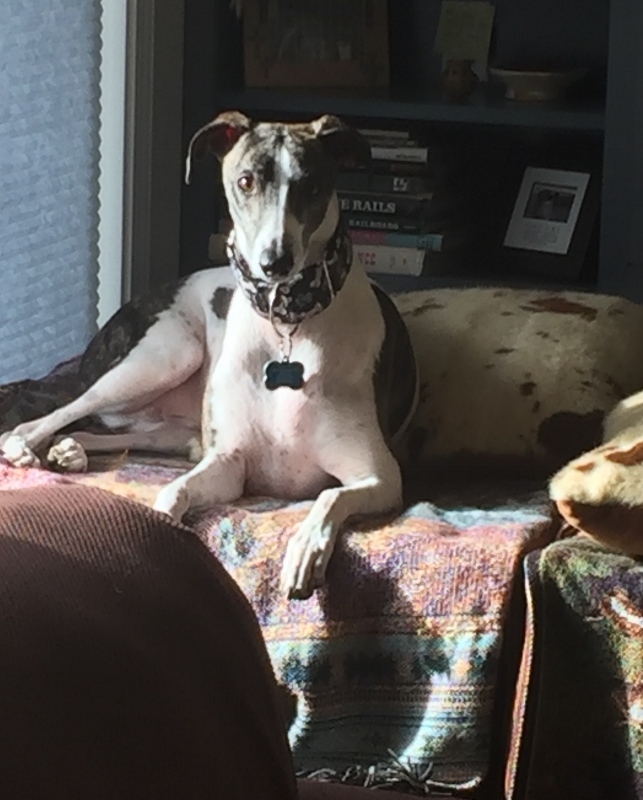 Zelda, when she's not sleeping - just absolutely ADORABLE! 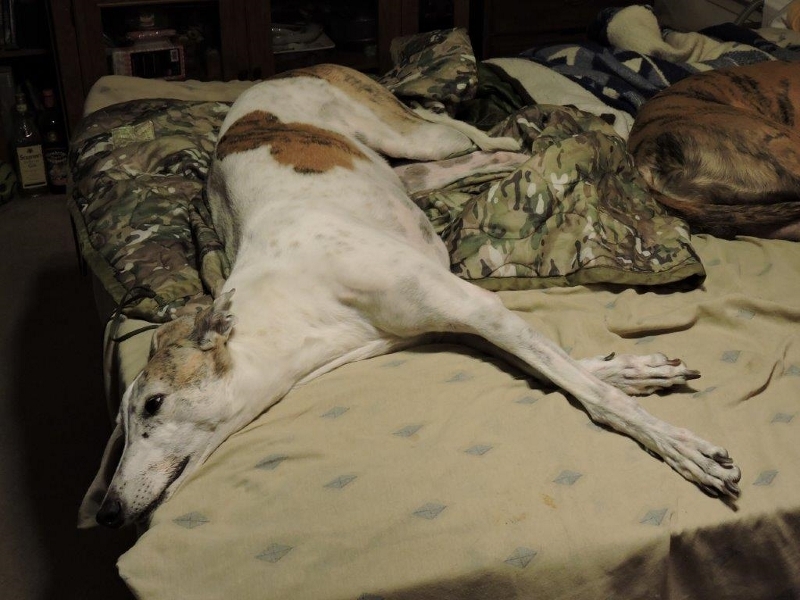 Bexata Greyhound Ally sharing the bed with dad. 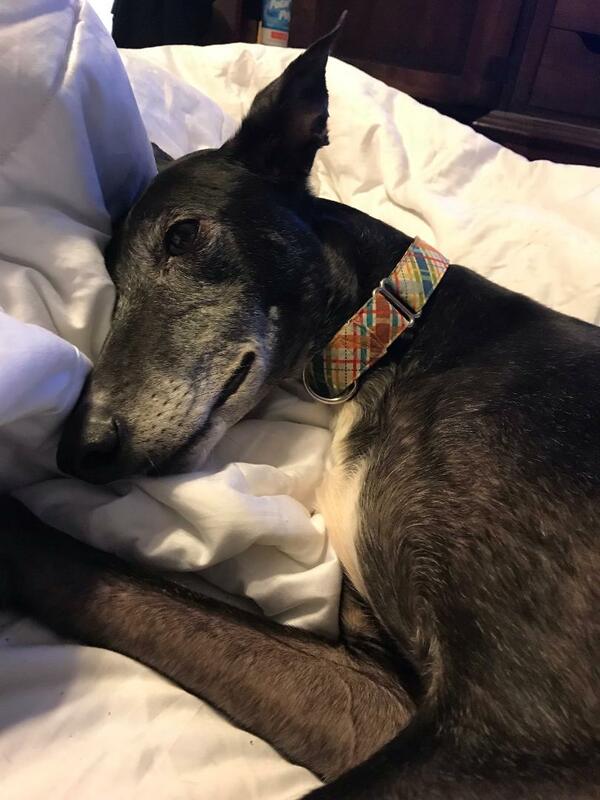 September 1, 2017 the lovely Ally was adopted - Cindy took her home from Bexata and (above), she moved right in and shares a bed with hubby. 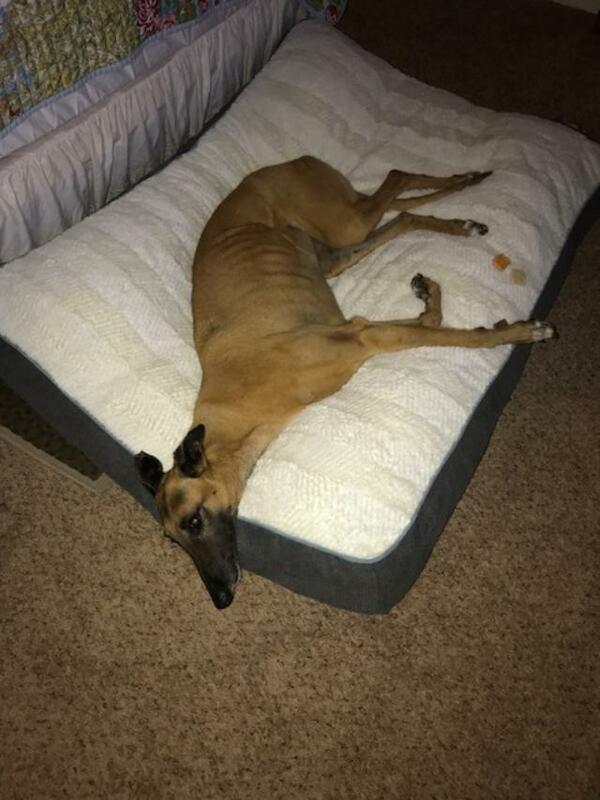 From farm dog to bed potato! 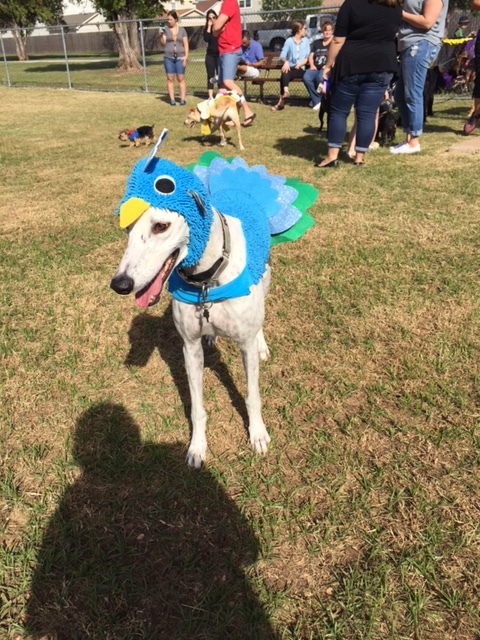 Gotta love the Greyhounds. 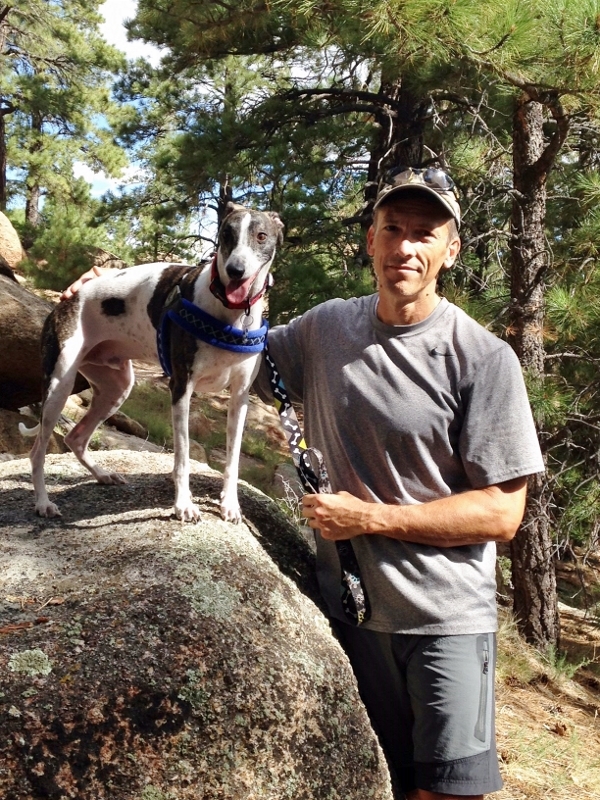 Pele (formerly Petey the Rescue Whippet) and his dad Scott on hking trails in AZ. 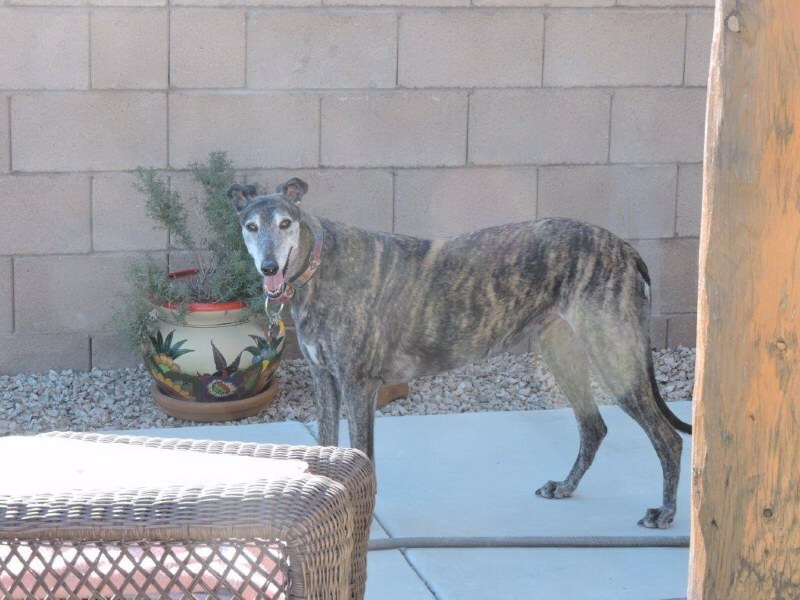 Sable was adopted a few years ago and has a wonderful life. 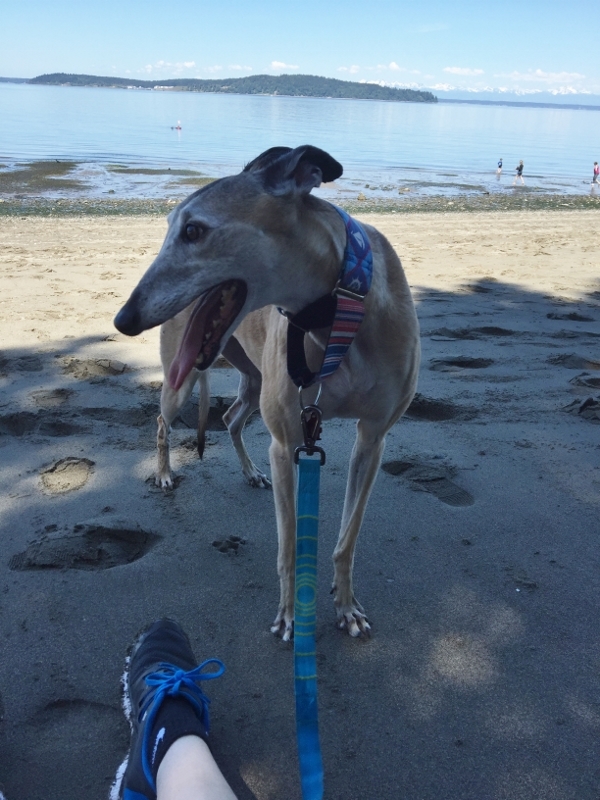 Here she is at the beach. 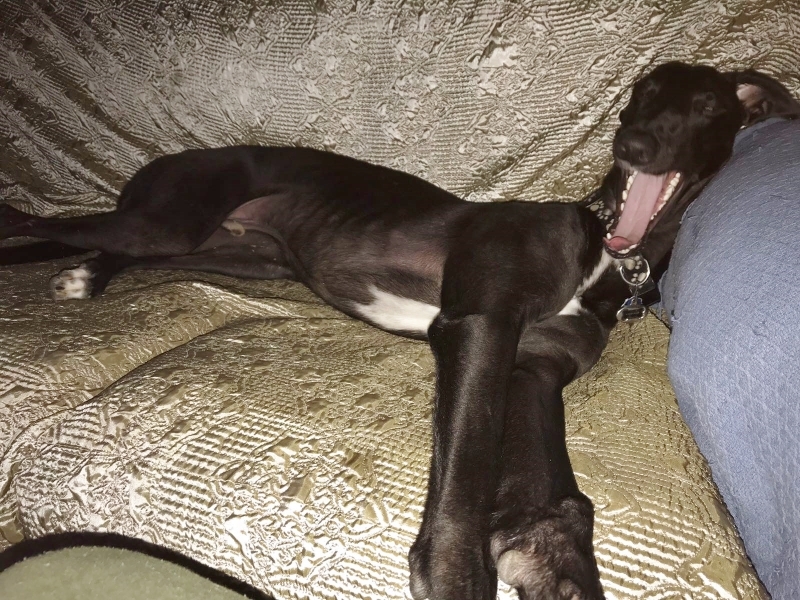 Winnie Kendra - His mom, Michele, says he sleeps 26 hours of a 24 hour day! 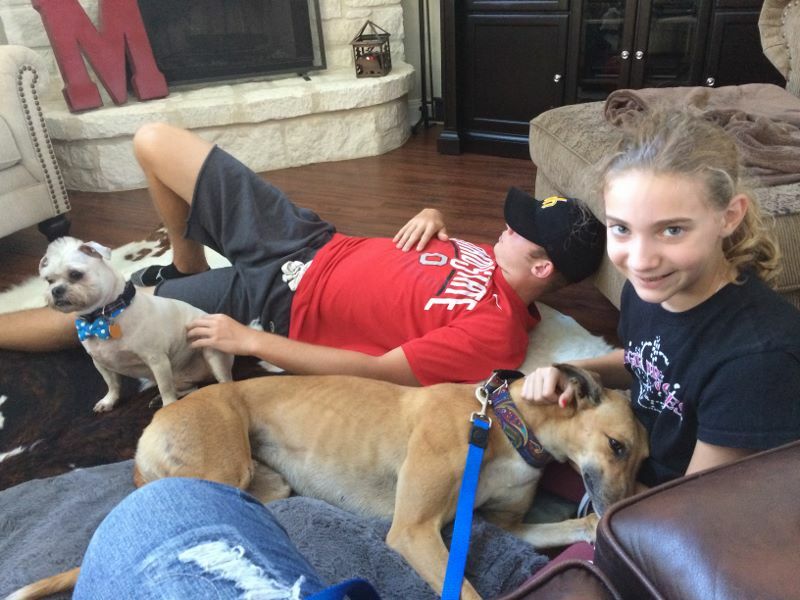 They have been so good with our foster daughter! Alfredo is really super patient with her; probably because she also feeds him her leftover food! 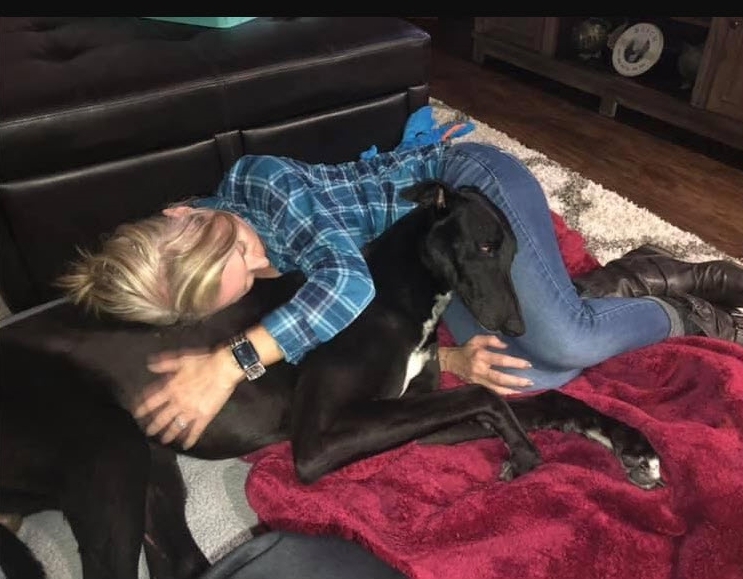 We have been calling Midnight Momma because she will often go and check in on her when we put her down for the night. 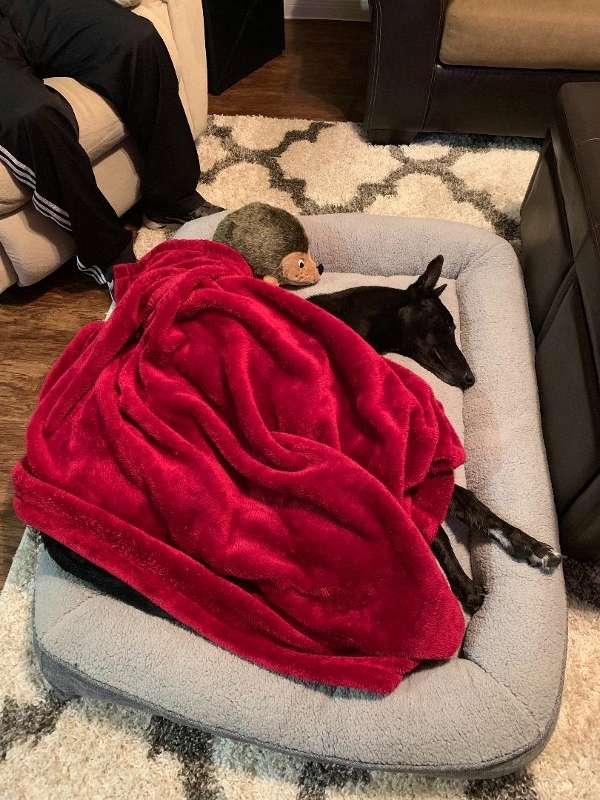 I will hear the door open and check the monitor and there's Momma Midnight making sure everything is good for the night. 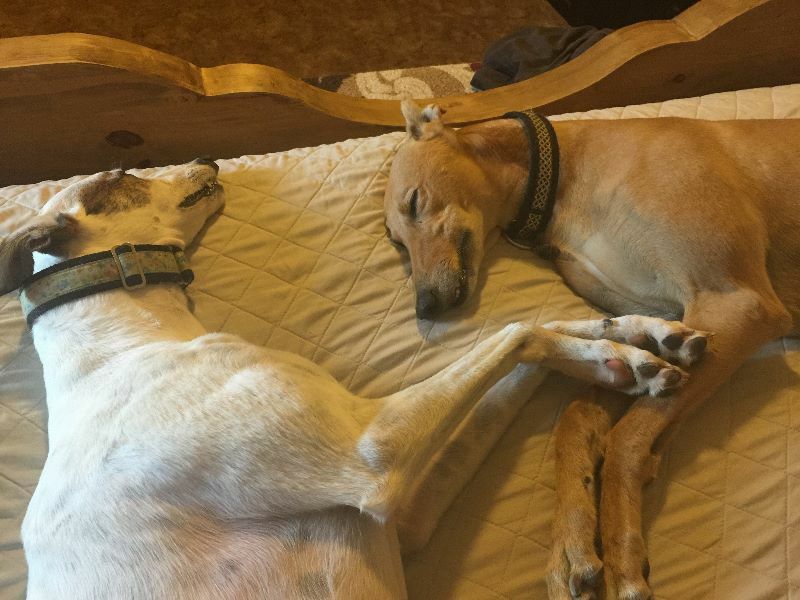 June 17, 2017 Greyhound Logan and his friend MacKallister. 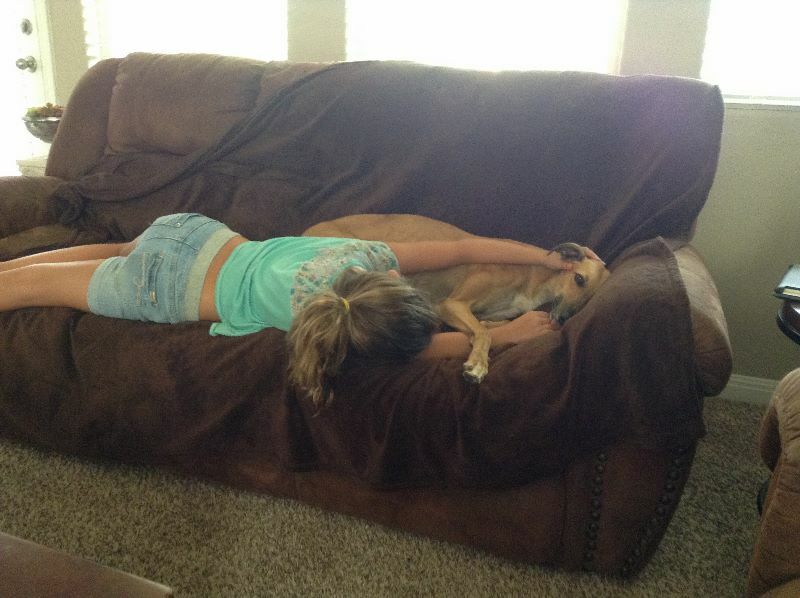 Logan makes a great pillow! 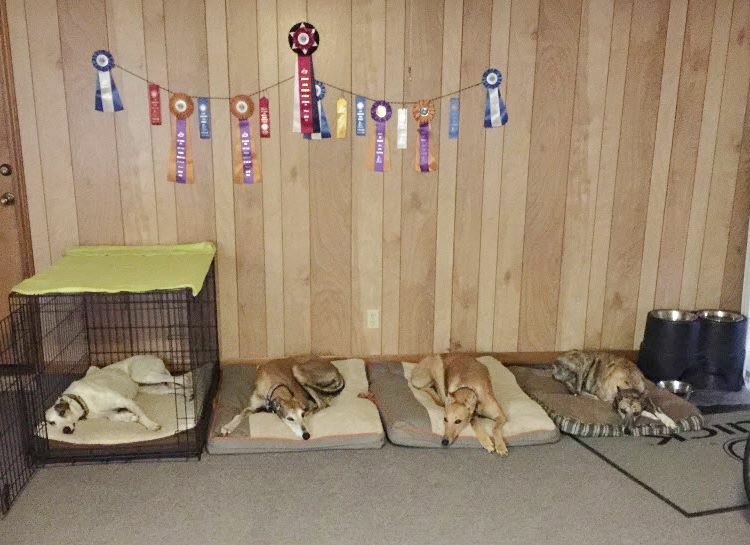 Avalanche, Handsome, Cookie King below. 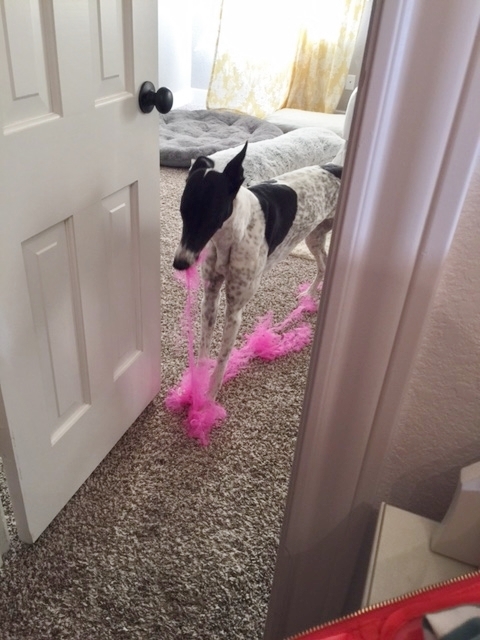 This is where Amanda learned that if you don't want Cookie to play with your loofa, don't leave the bathroom door open. 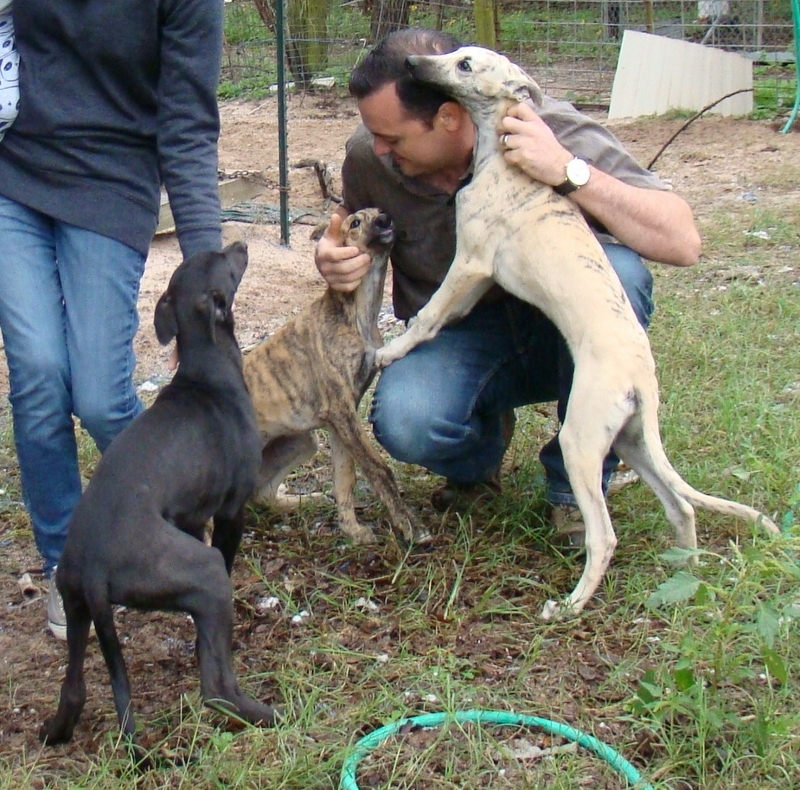 Pele is the only Whippet we have rescued and rehomed at Bexata. 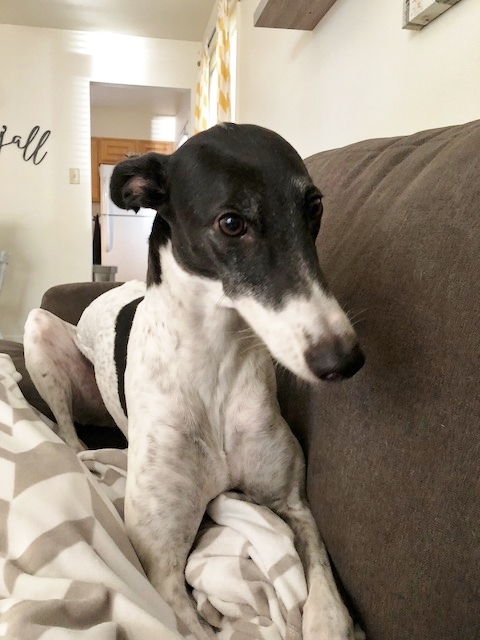 He was taken in as a very sick little baby, nursed back to health with the help of Team Petey, and adopted out to the Charter family who already have a Bexata rescue Greyhound, Hilo. 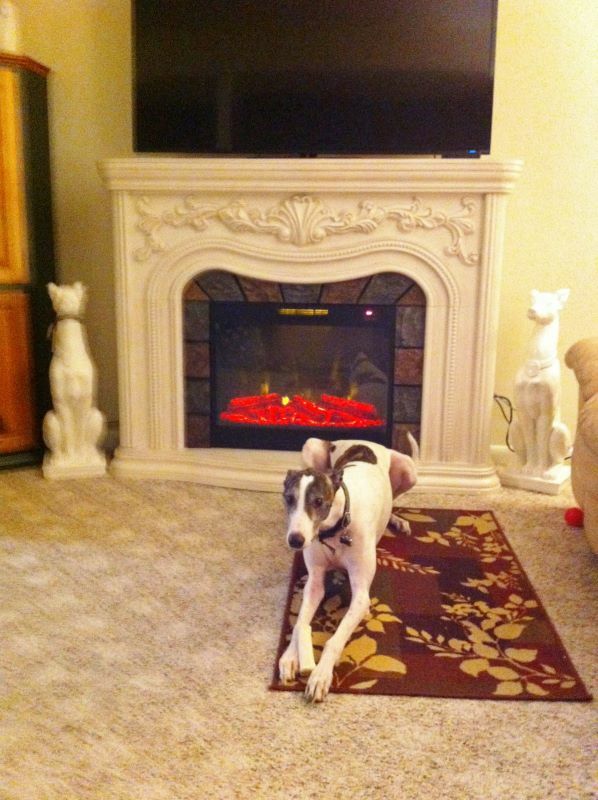 Lola at home in Arizona. 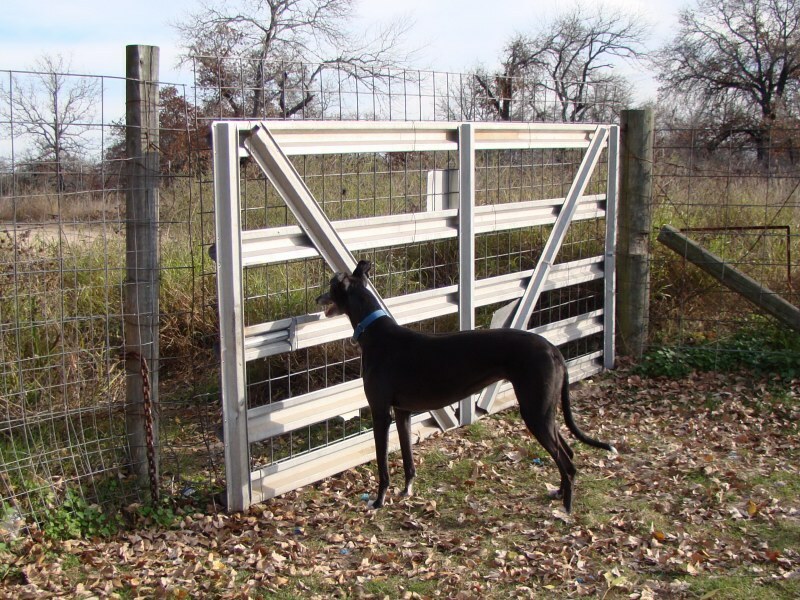 Perfect place for a retired Greyhound. 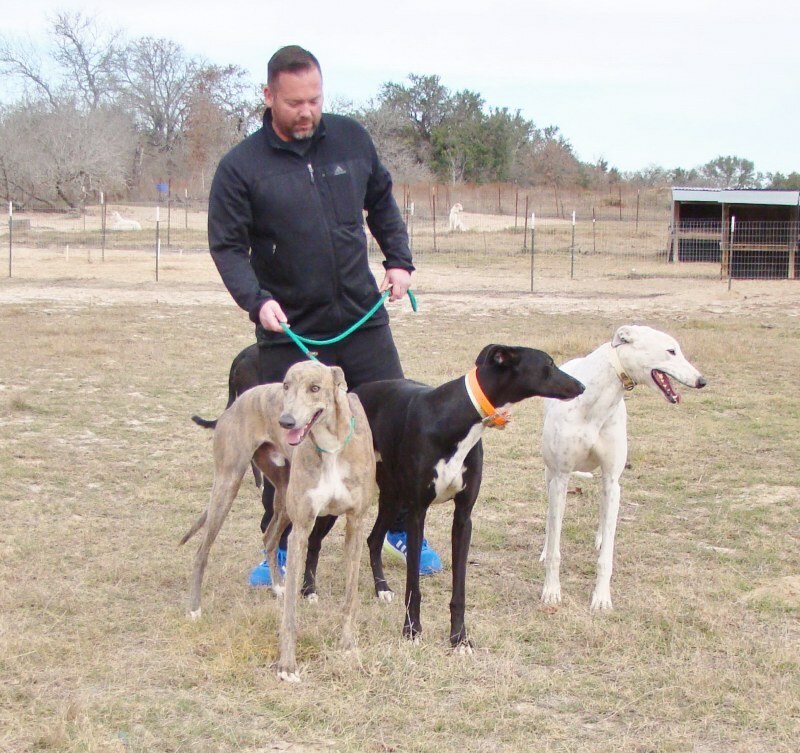 January 22, 2017 Alex walks with the two girls, Blacky Girl and Shadow, and took Shadow home. 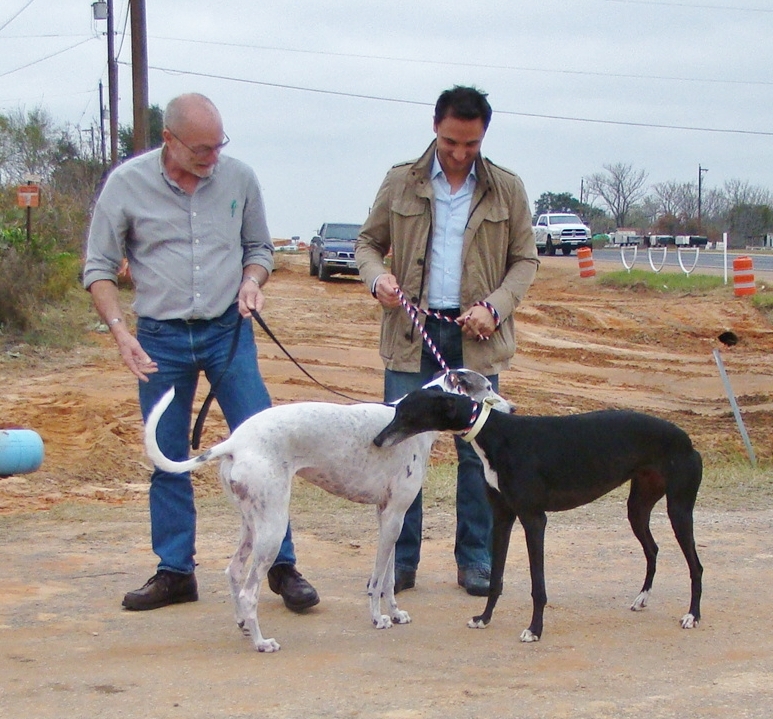 You can see how the meeting with the Greyhounds and the adoption went on the Available Greyhounds page. 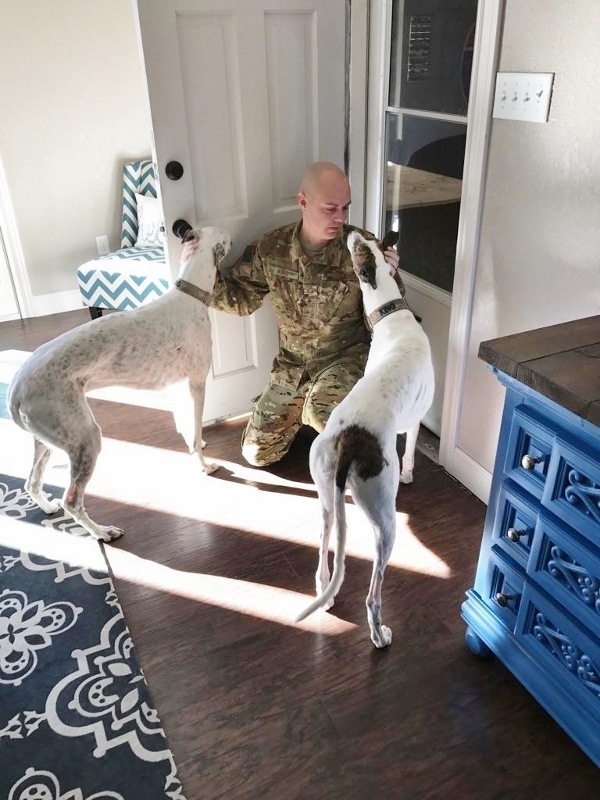 Justin says goodbye to his boys Avalanche and Handsome, as he is deployed. Praying for Justin's safe return. 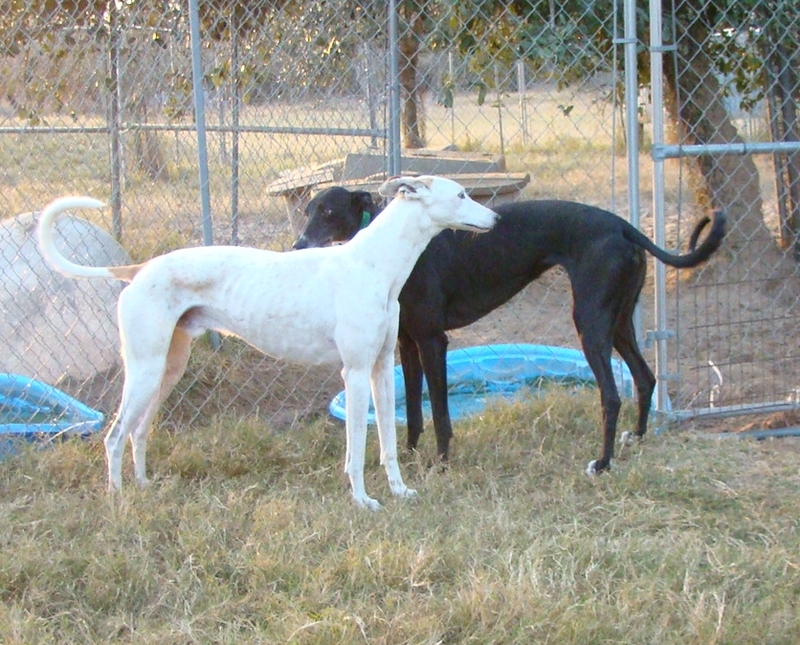 Black Beauty on the left. Pepsi on the right. 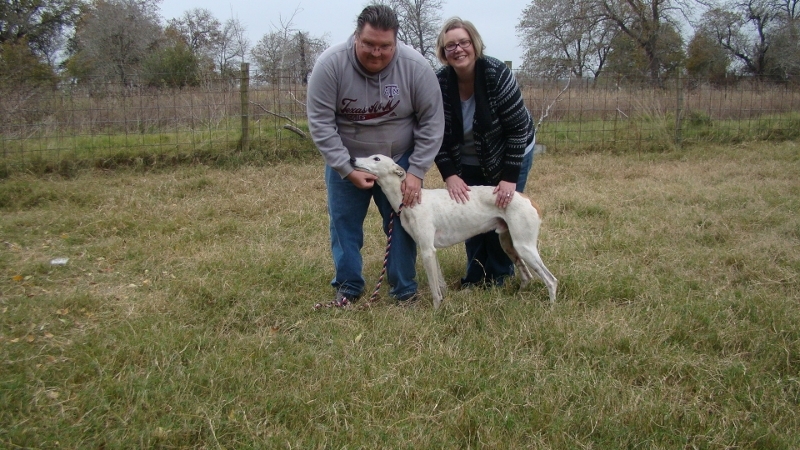 January 2, 2017 first adoption of 2017. 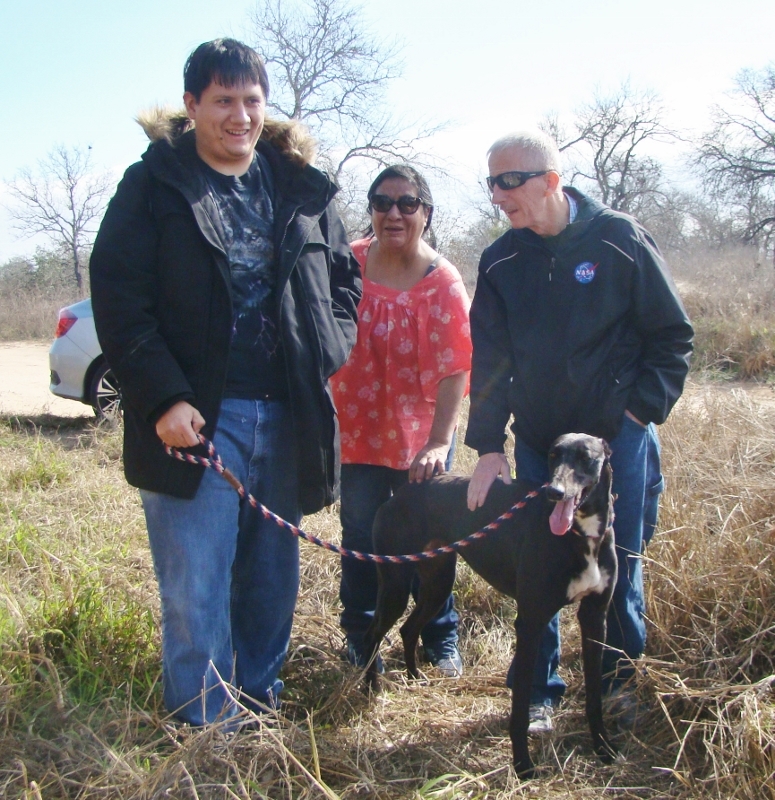 Brian came out with his friend Faye and his formerly adopted Greyhound, Pepsi, to meet Louella Mae (red fawn) and Black Beauty. 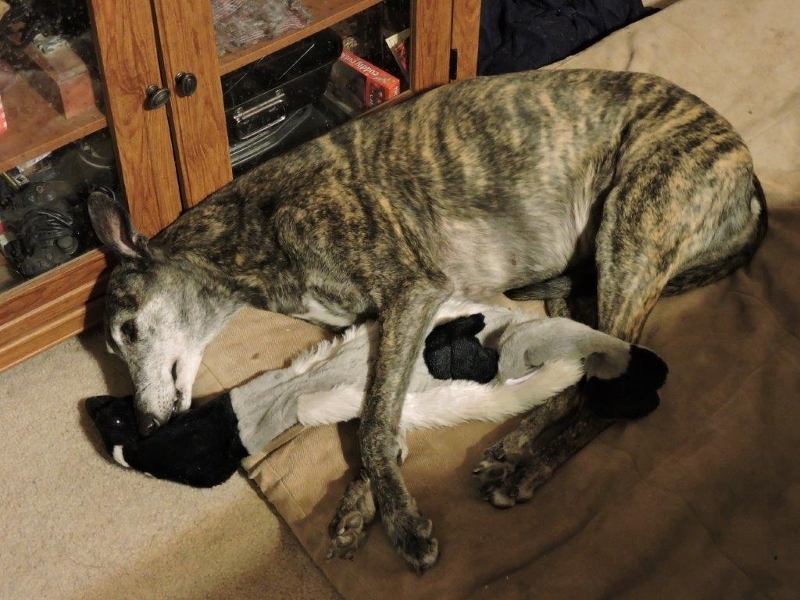 Pepsi's best Greyhound buddy, Trace, passed away at fourteen and Pepsi was mourning. 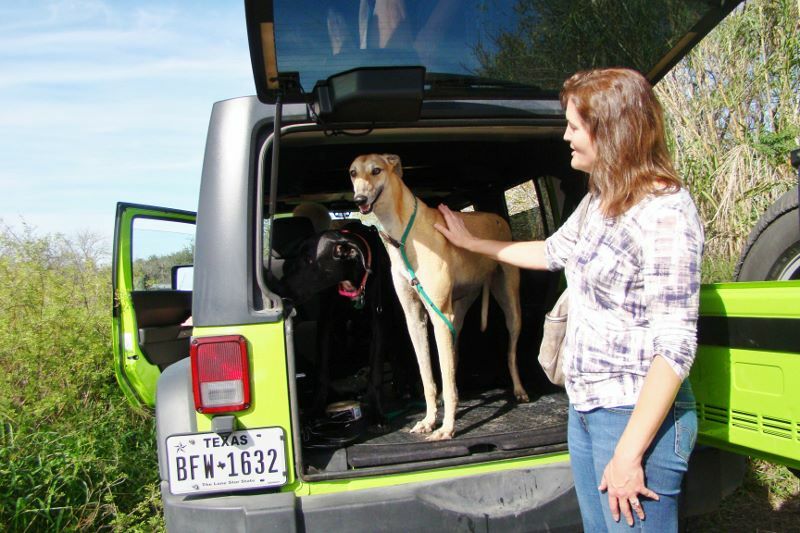 Brian felt she needed a friend, so they brought her out and they took Black Beauty home. 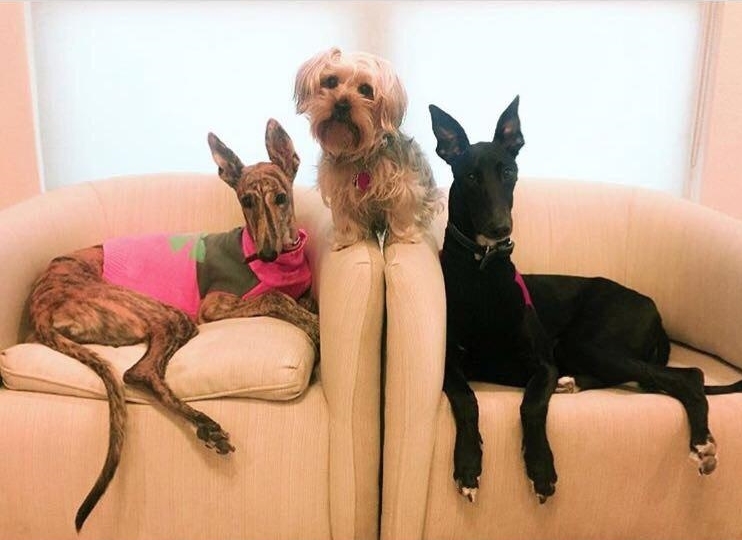 They aren't, but they sure do look like sisters. 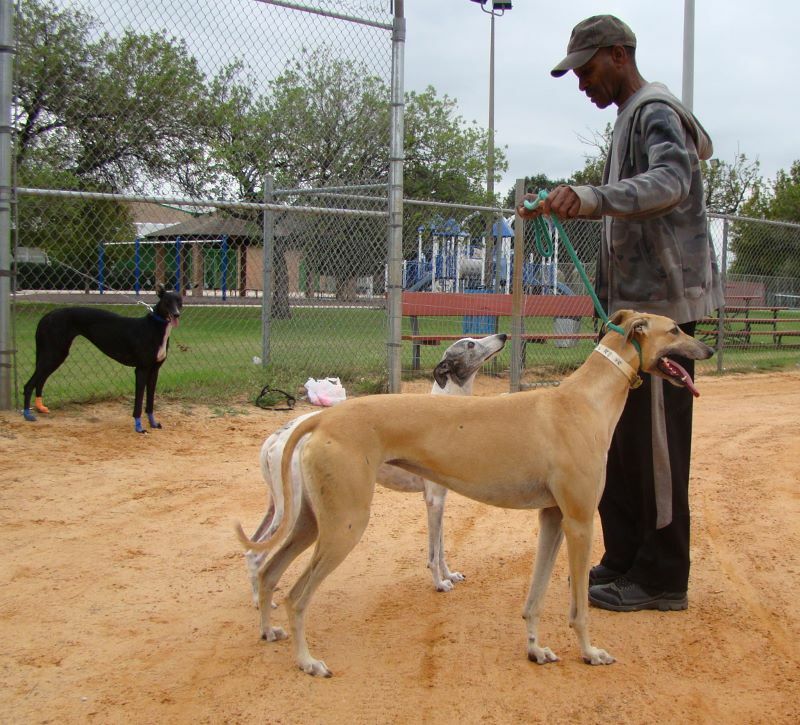 Black Beauty is a retired stellar lure courser having multiple Bests in Field, including at the AKC National Lure Coursing Championship. 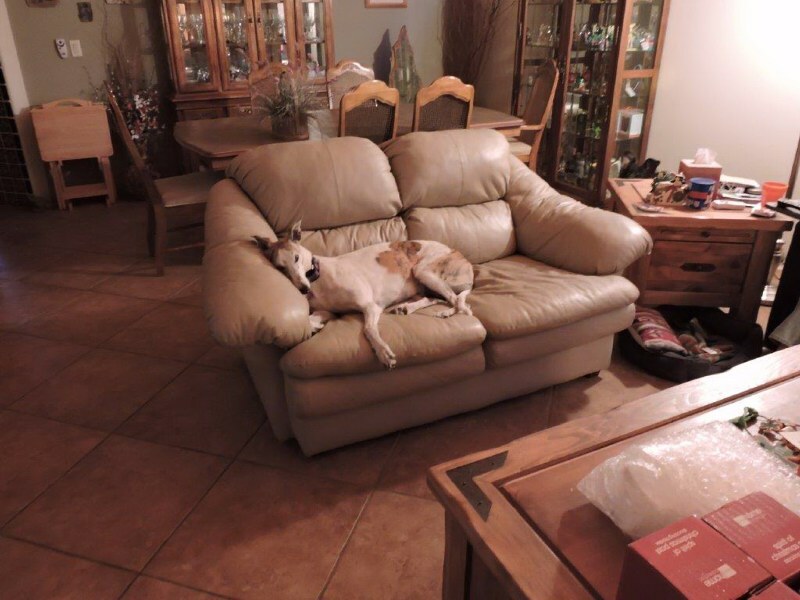 She is now retired and will grace a couch, bed and doggy beds and just live the life with her new friend, Pepsi, the Greyhound, and her new dad, Brian. 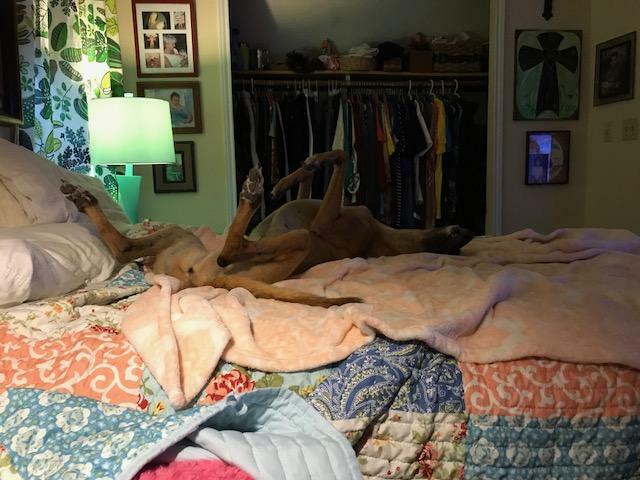 So Lexi just takes a nap on the bed. 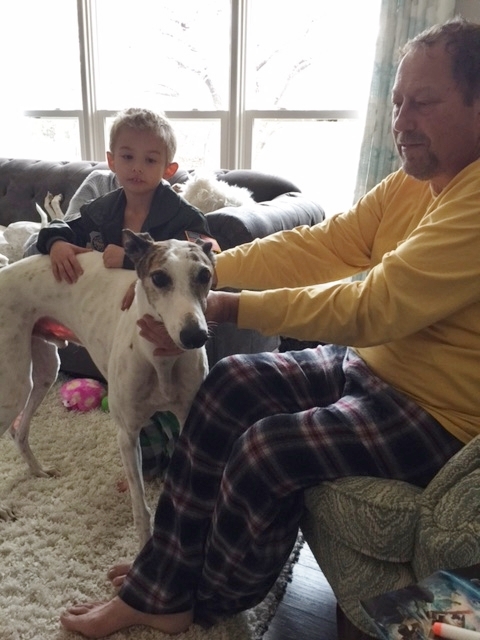 Alfredo is back to visit while Amy and Preson visit family out of town for Christmas. 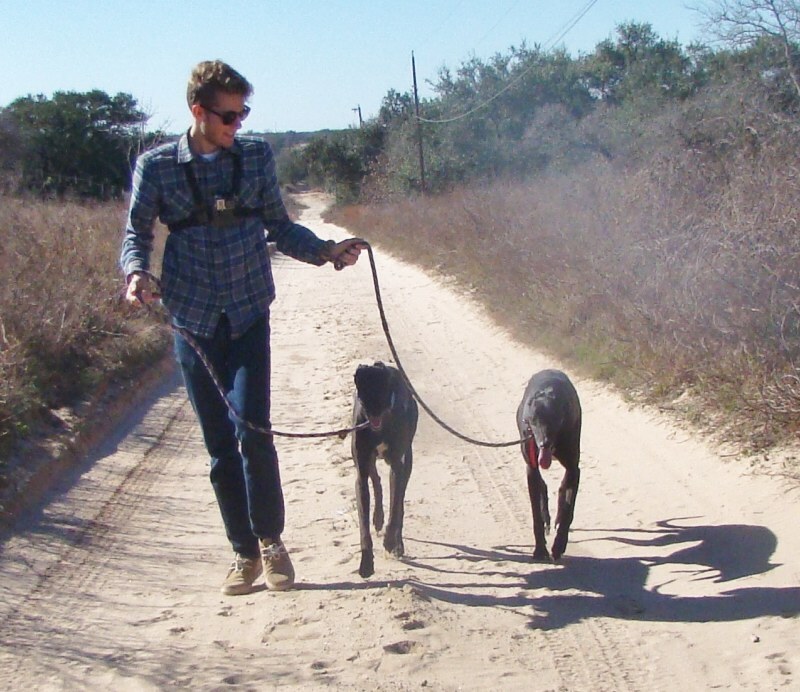 Here he is reunited with his buddy, Midnight, who will go home with him when their family returns from holiday. 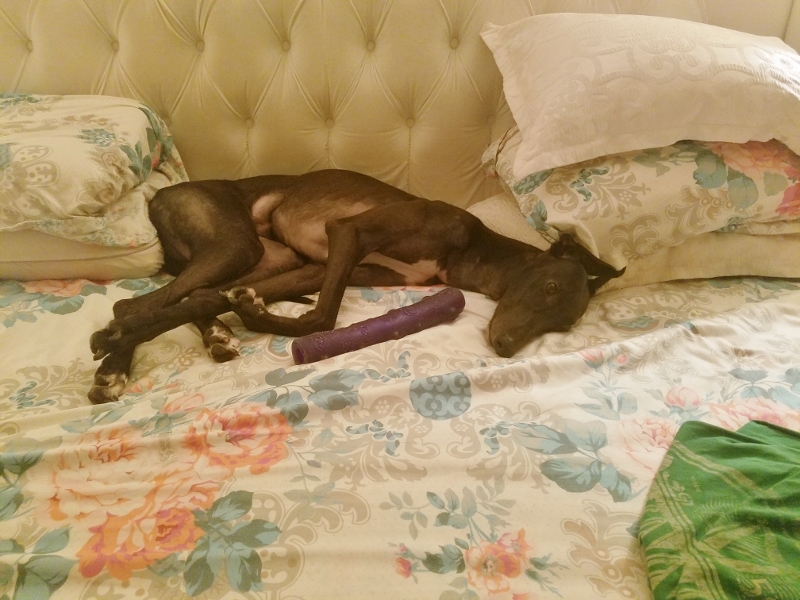 Alfredo (formerly Mariano) is enjoying the high life at his new home! 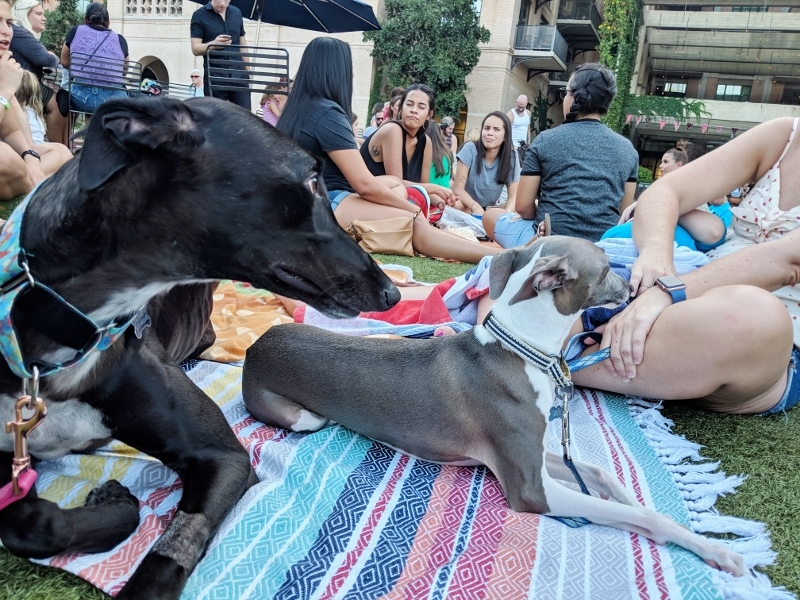 He's Amy and Preston's boy now. 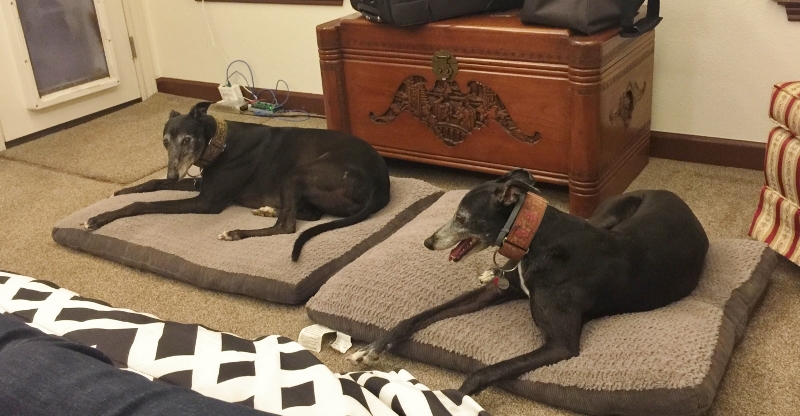 Retired show champion Velvet, at Bexata, meets retired racer, Maggie, and they went home together. 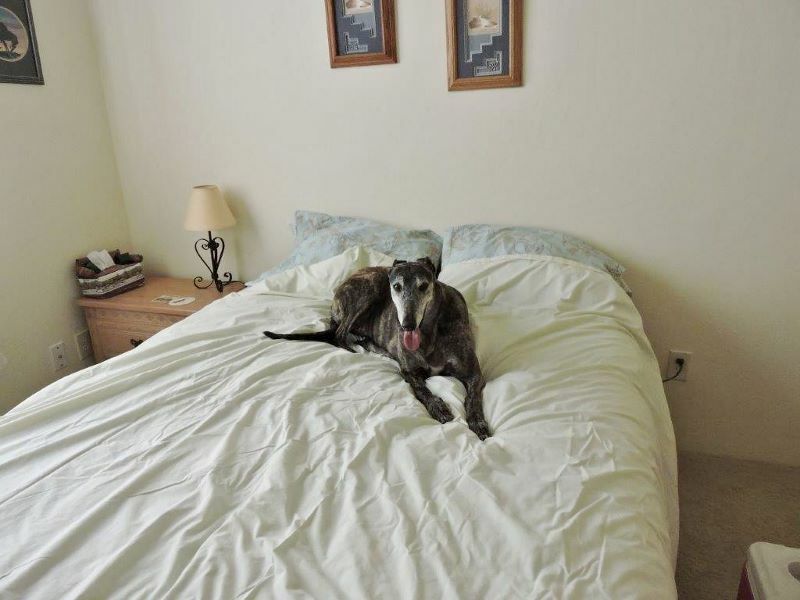 Maggie is an eleven year old girl looking for a pal. 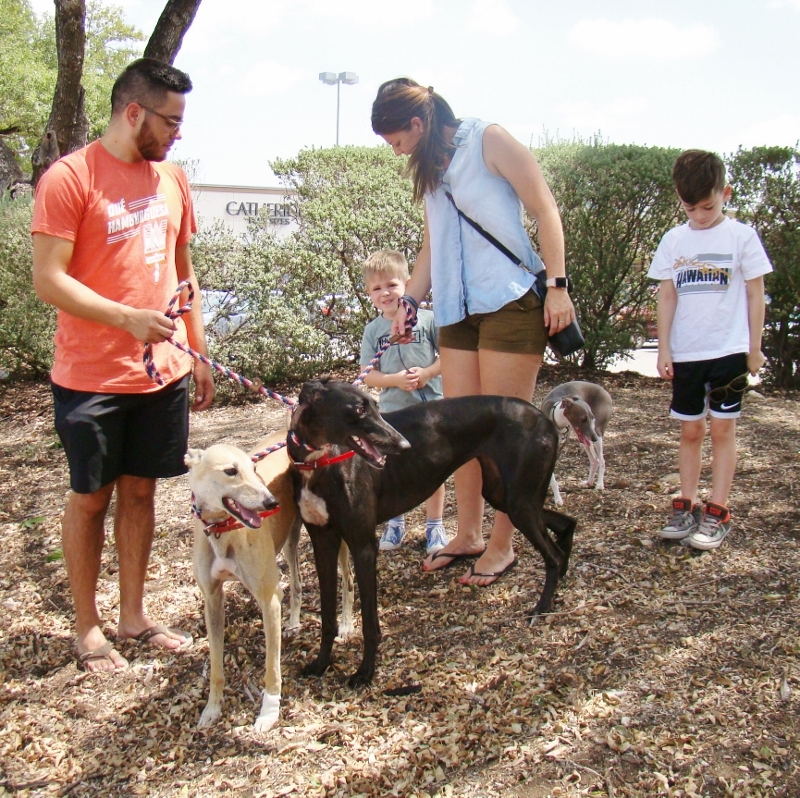 John came up from McAllen with Maggie to meet Velvet and, as they say, the rest is history. 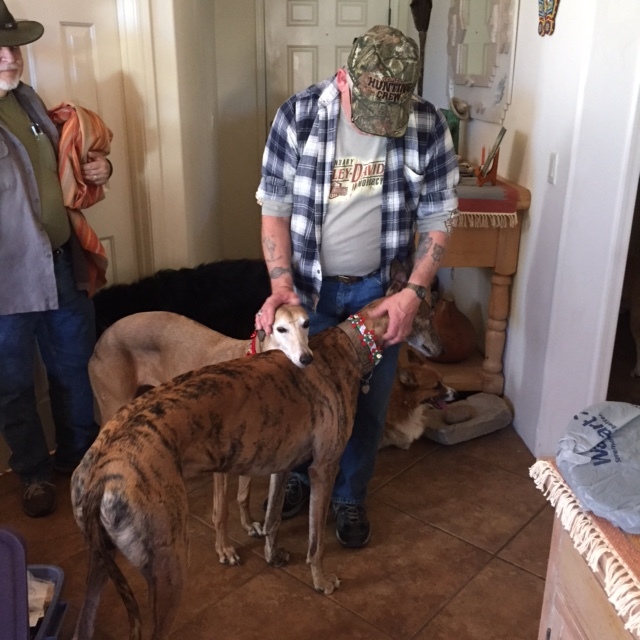 December 11, 2016 Lola, who lives in Arizona, had a visit from Duane's boy, Tiger, adopted and living in El Paso. 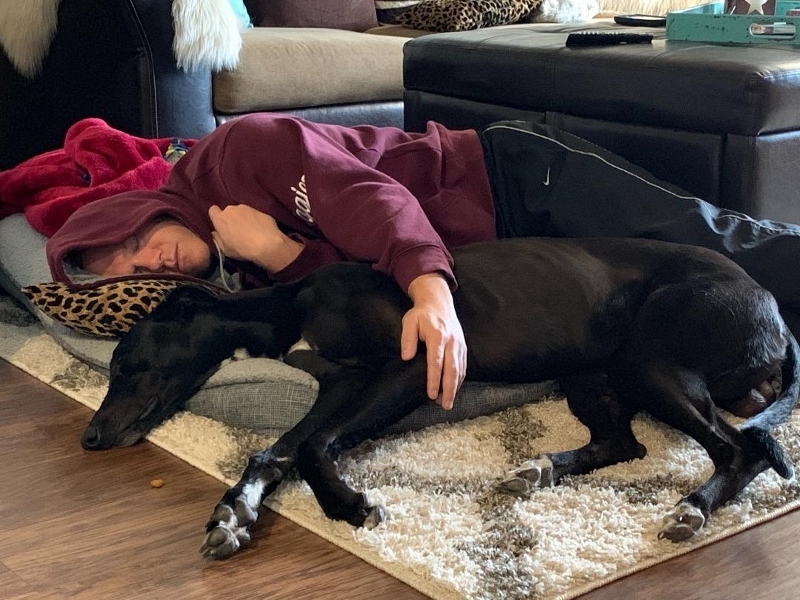 This is Christmas with Greyhounds at the Parrigin households father and son! 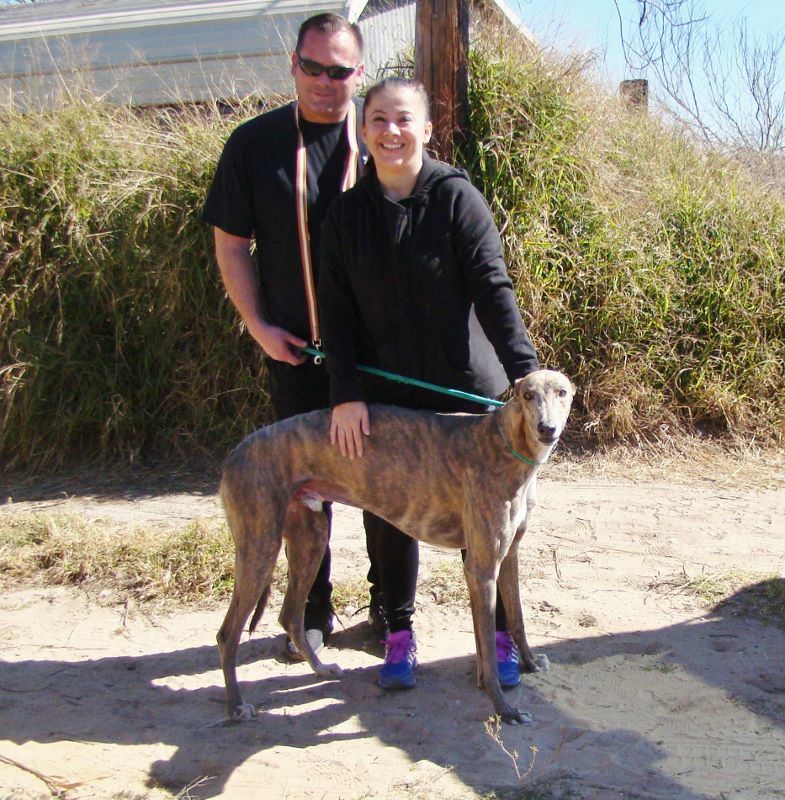 December 10, 2016, Mariano (now Alfredo) went home with Preson and Amy. 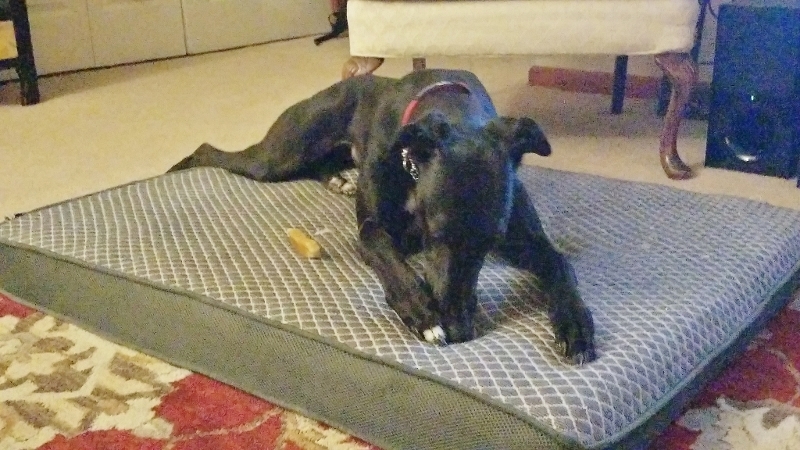 November 17, 2016 Daisy McKay loves her new bed. 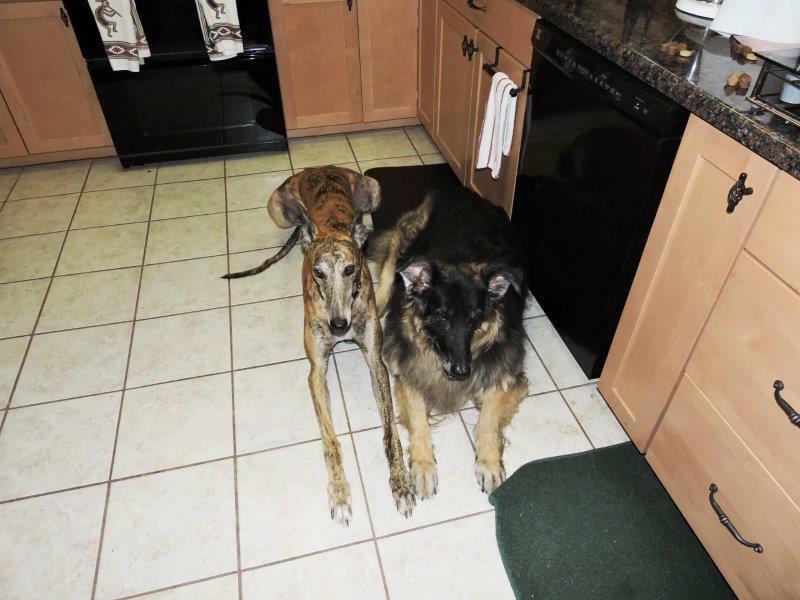 November 11, 2012 Rebel and his best GH friend, Gage, home from the groomer to their freshly washed futons. 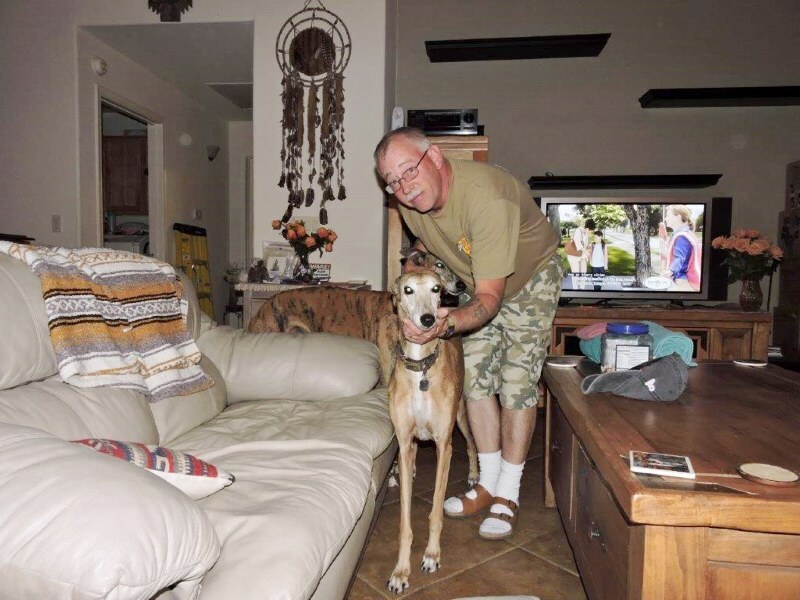 Thank you Darrell for giving Rebel such a wonderful home. 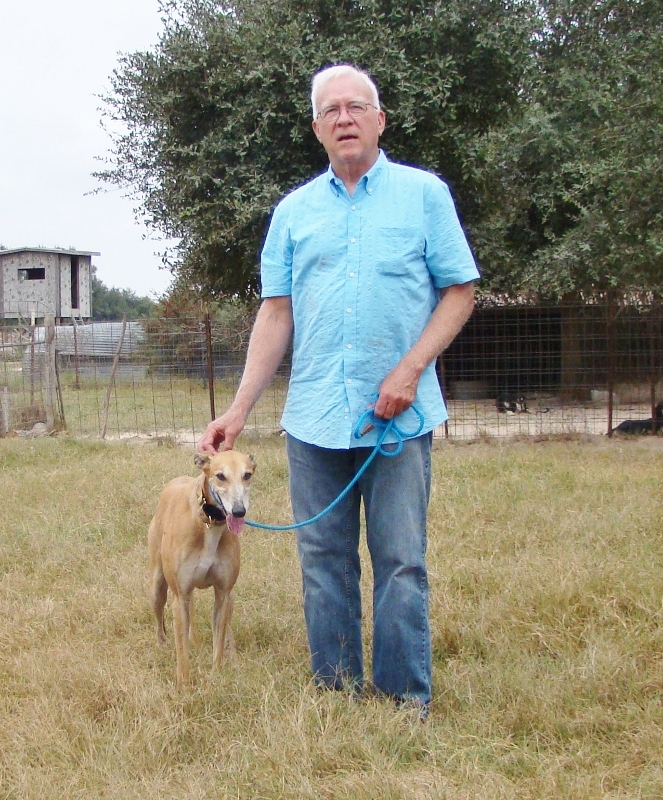 I am proud of the work done at Bexata to have Rebel go from "deer in the headlights" to a wonderful home companion. 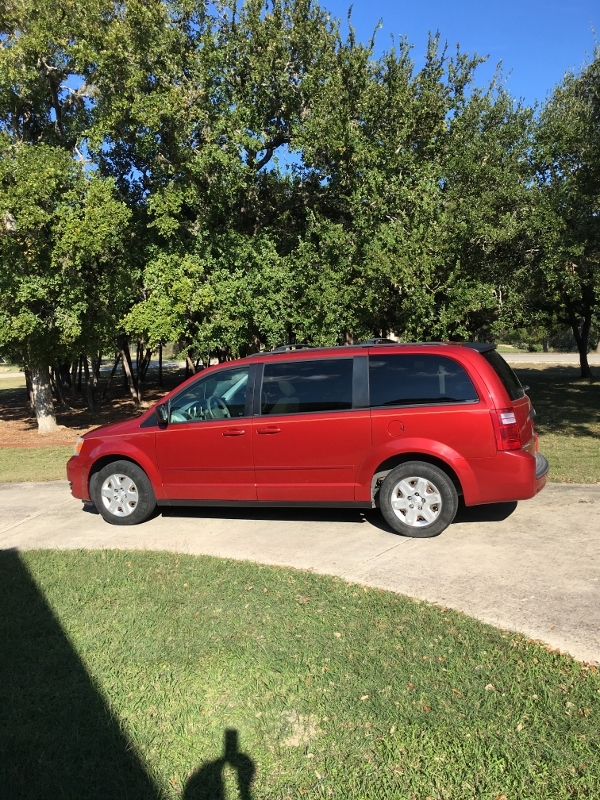 Darrell also got the boys their own "dog" transportation, a Dodge Caravan. What a great GH Dad! 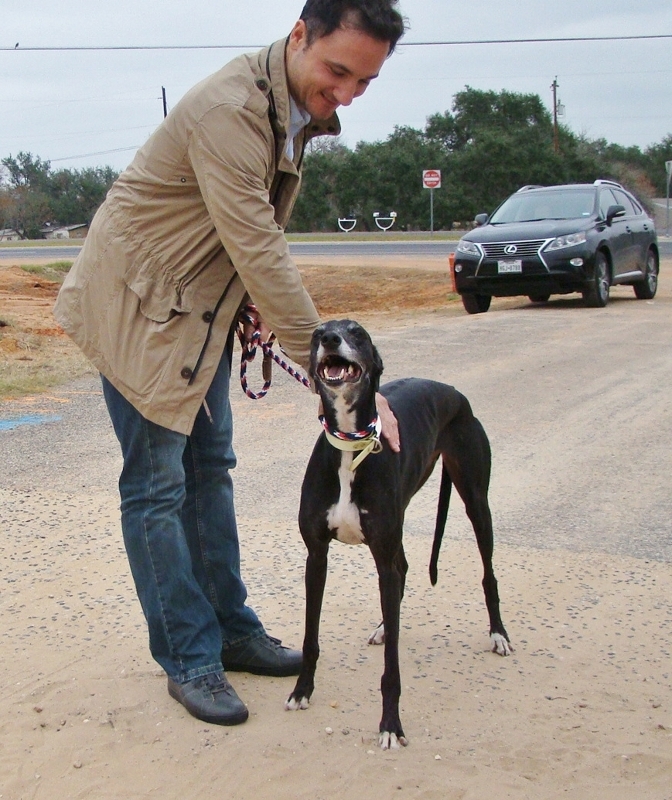 Rebel with his new Dad, Darryl, is on his way home to meet his new Greyhound brother, Gage. 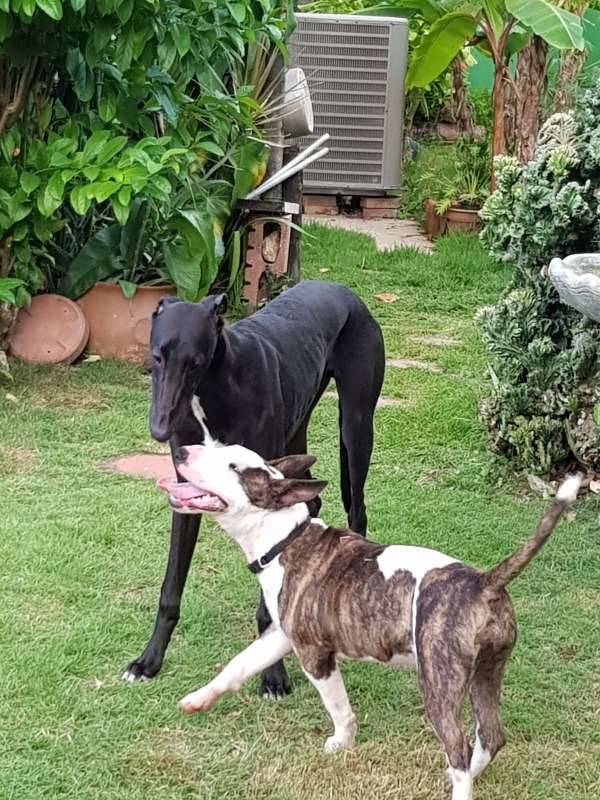 Rebel and Darryl - buddies smiling - Rebel is a rock solid, museular Greyhound who will enjoy Darryl's acrea backyard with his new Greyhound brother, Gage. 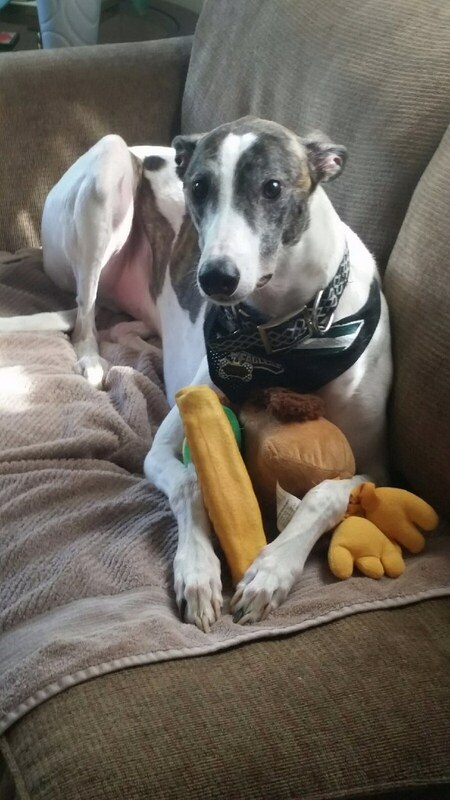 Pillows, pillows and more pillows, Come on Dad! 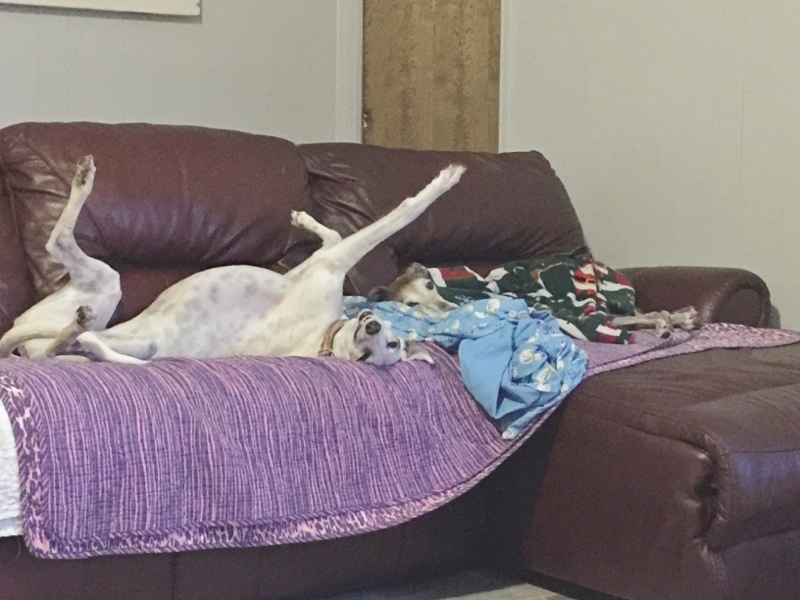 Luna and Foxie doing what they do best! 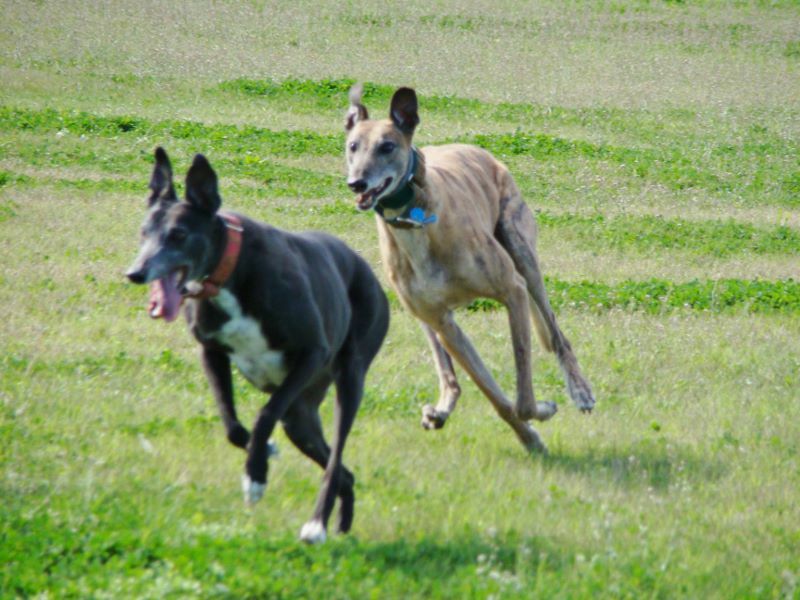 Rescue Greyhound Hilo and his rescue Whippet buddy Pele. 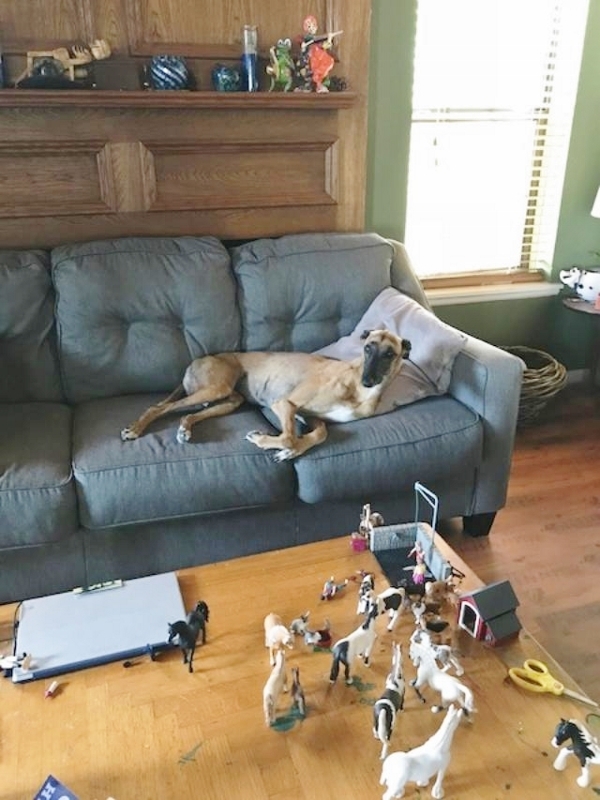 October 3, 2016, Daisy at home with her family. 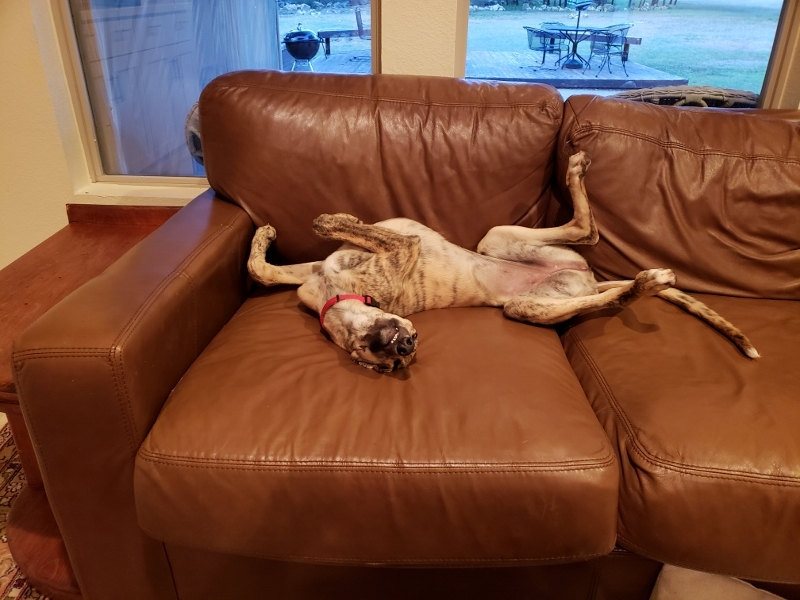 What a life! 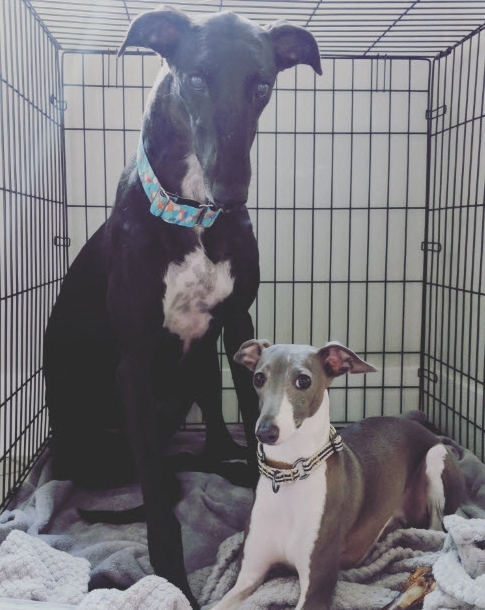 Winston on the left, likes his new friend, Daisy. 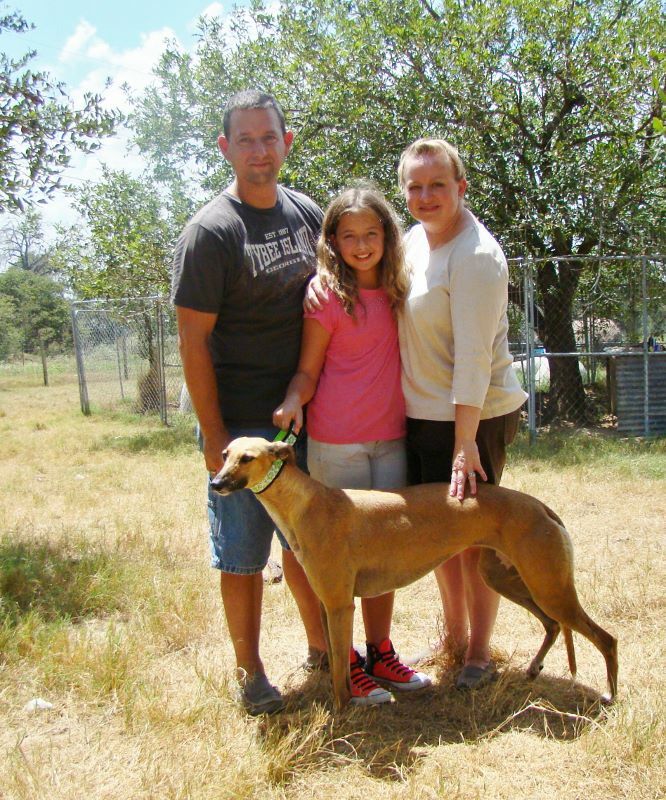 October 2, 2016, Daisy went home with the McKay family. and home she went with the McKay family. THANK YOU AMANDA FOR TAKING THE BOYS AND SHARING THEIR ADVENTURES! 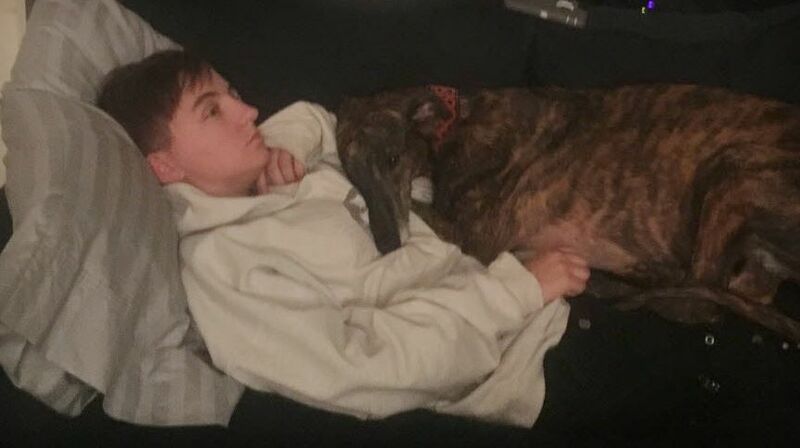 August 18, 2016, Gear and his mom Savannah watching tv. 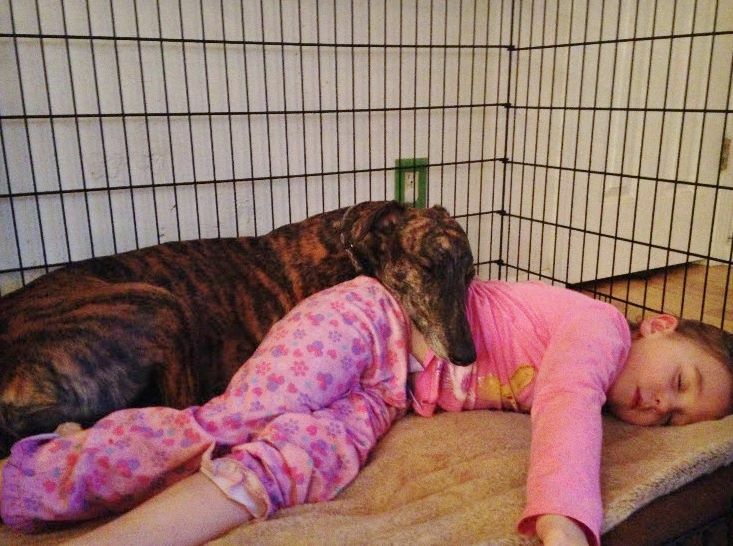 He's her 93 pound lap dog. July 29, 2016 at home in Florida with the Goodman family. 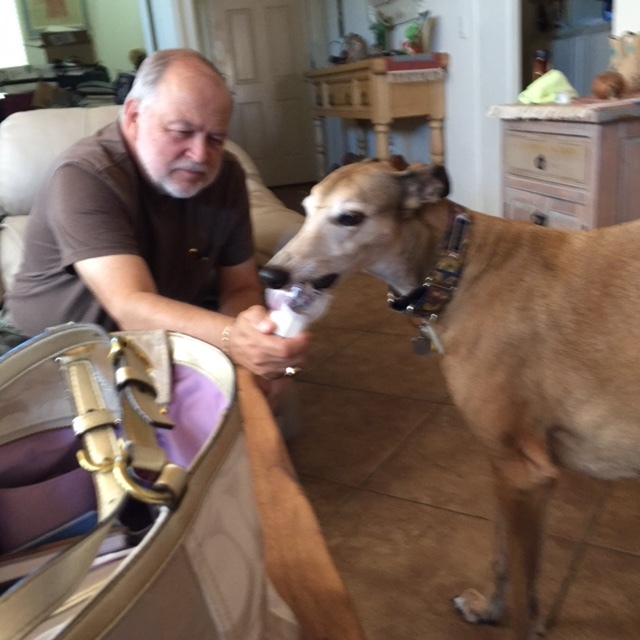 at her home in Arizona with her dad having her birthday ice cream. 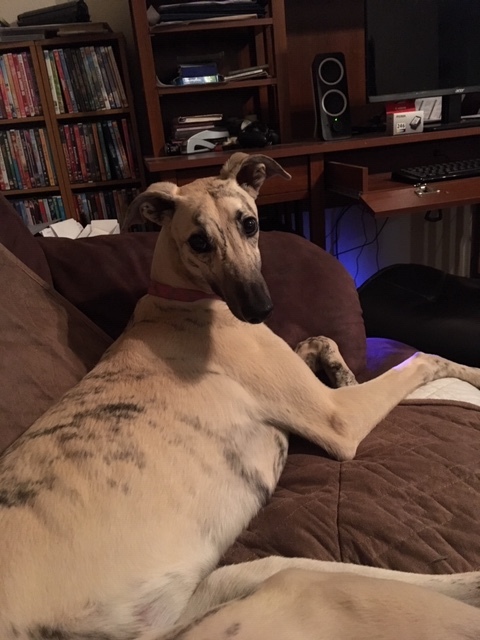 Carrie on the love seat. 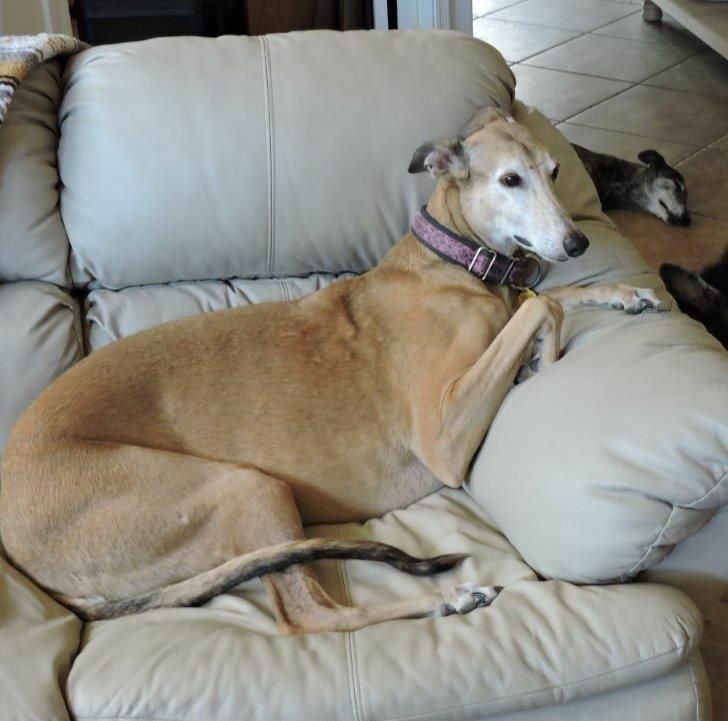 Lexi on the love seat. 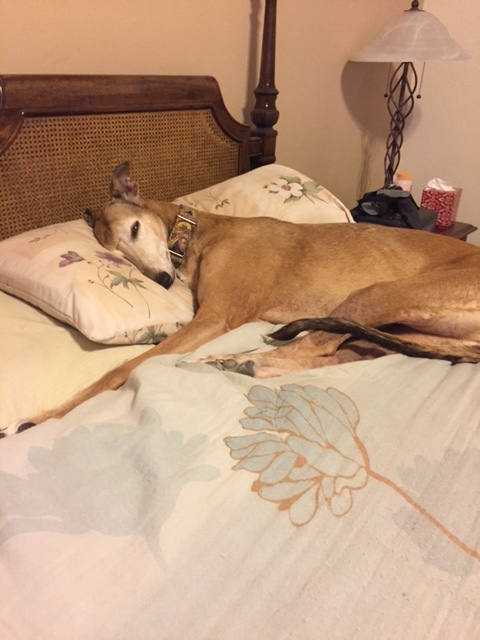 Carrie enjoying Duane's bed at his mom's house. Lola lives with mom. 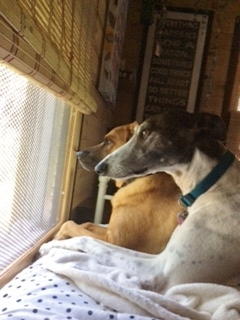 May 9, 2016 Hilo Bexata Greyhound and Pele Bexata Whippet (our only Whippet rescue so far) at mom Stephanie's. 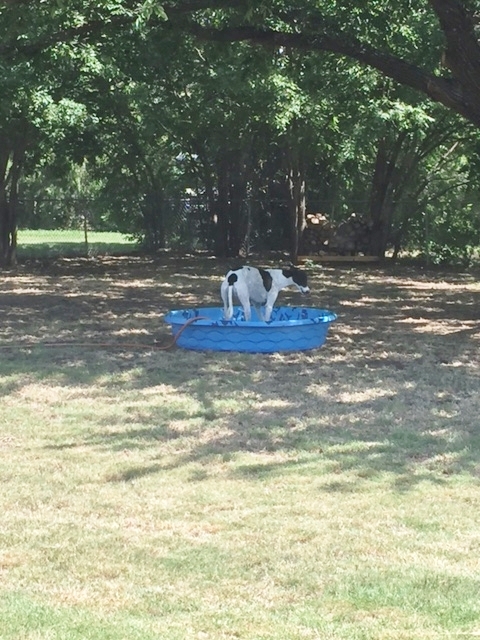 May 8, 2016, Carrie (in pool) and Lexi in the yard after a morning walk with Duane. Handsome's first camping trip to Amanda's family in Arkansas. Didn't take him long to settle in.. 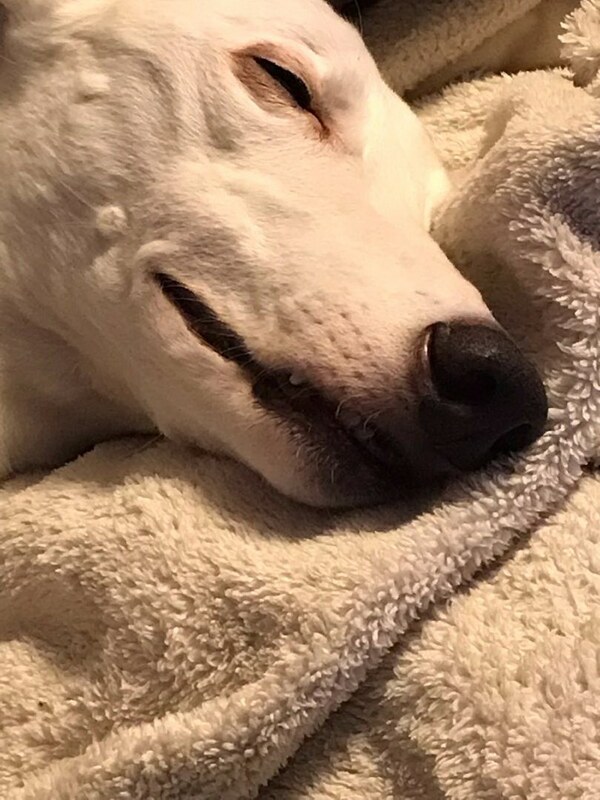 Happy Handsome King in bed! 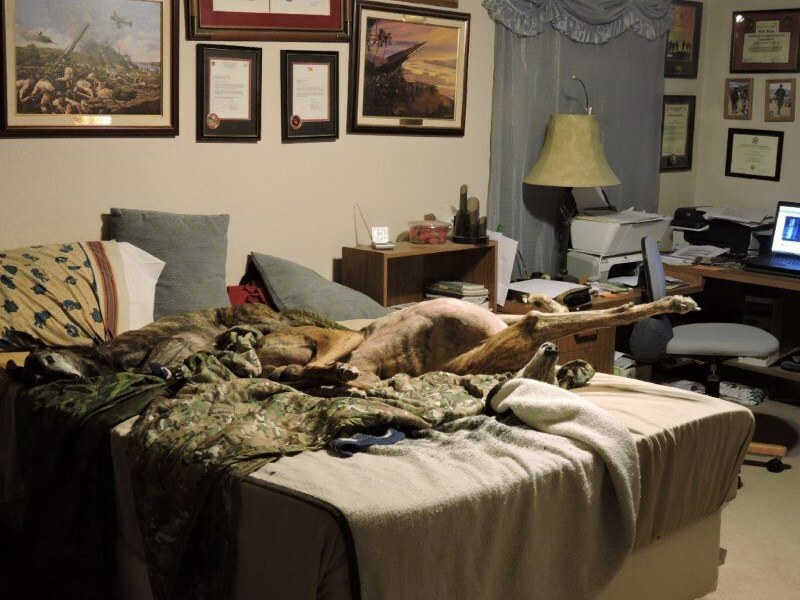 He is a lure coursing Field Champion and he loves his bed time. 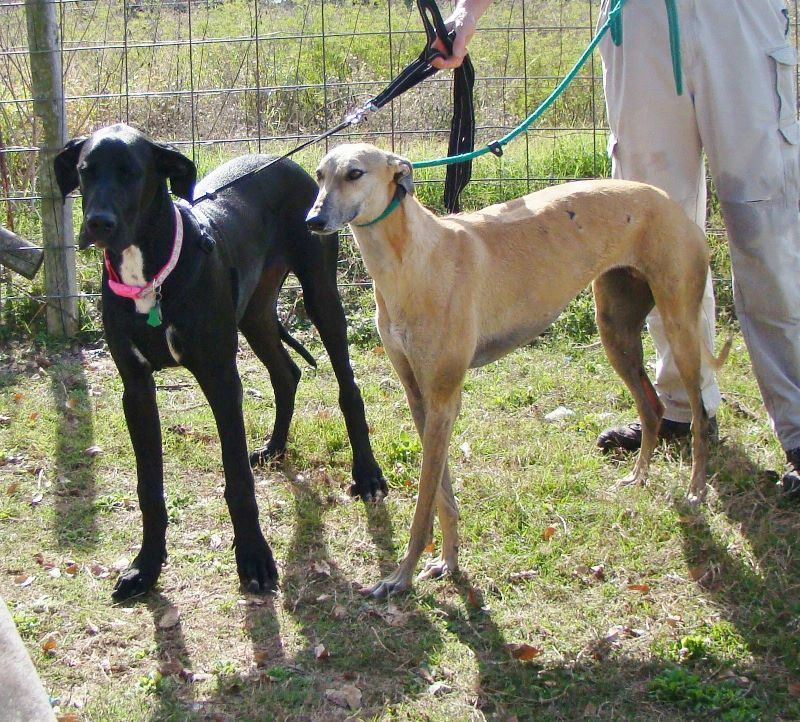 April 24, 2016, Daisy Bond and her Visla girlfriend- doing great! 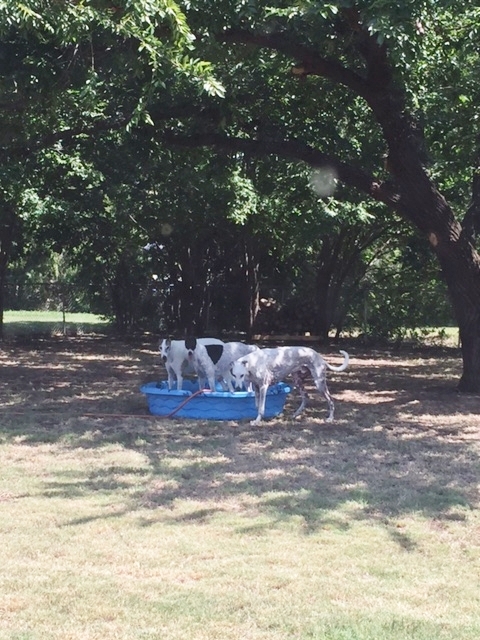 April 4, 2015, Baby Blue and Leon enjoying their new baby pool after dad Brian took them for a long walk. 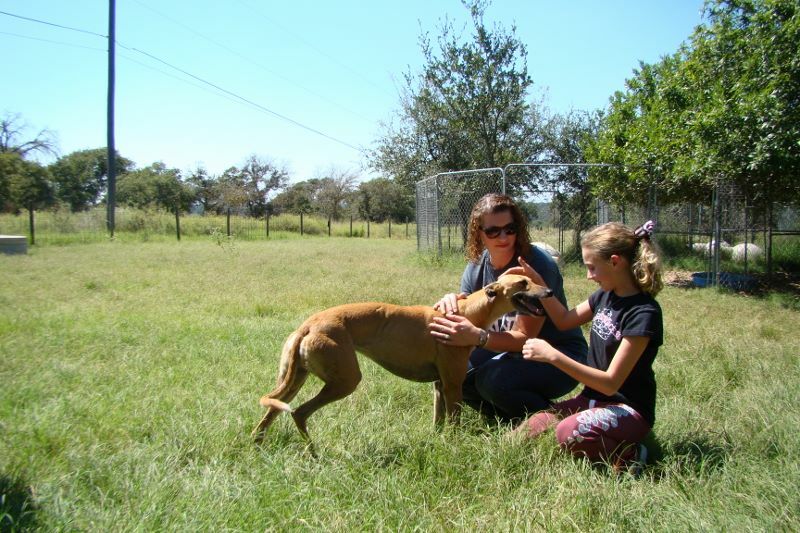 Laurie took Foxie to school and the children just LOVED her. Foxie couldn't get enough hugs and kisses. 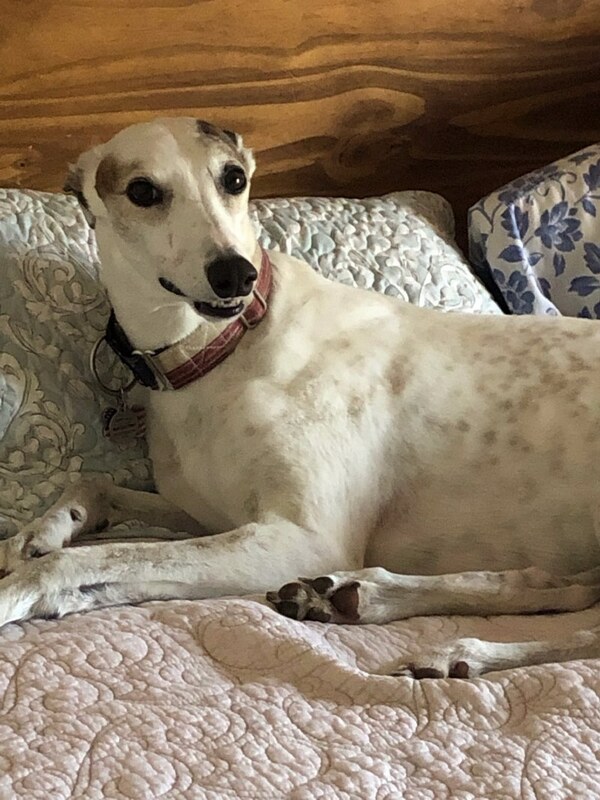 She's not only a wonderful lure coursing Greyhound and companion, but she has the patience of a saint and might make a good therapy dog. 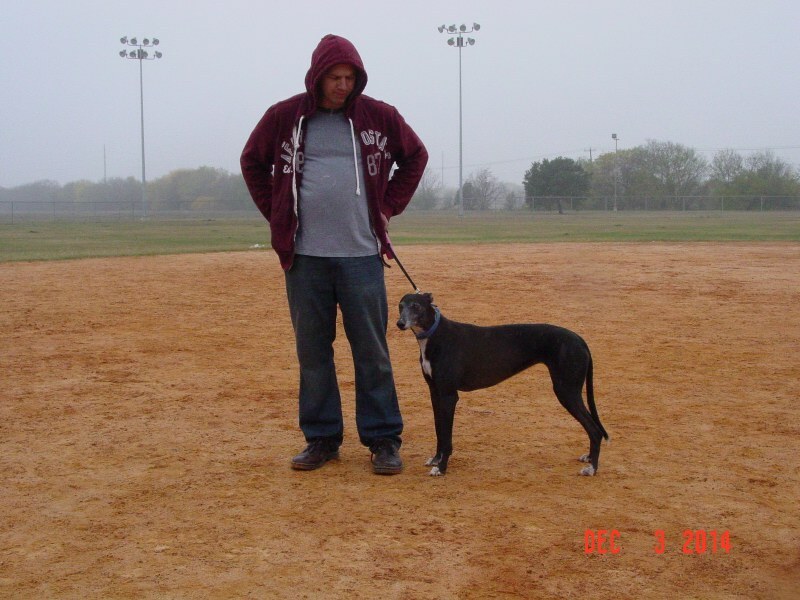 March 12, 2016, Amanda took Handsome to the park. 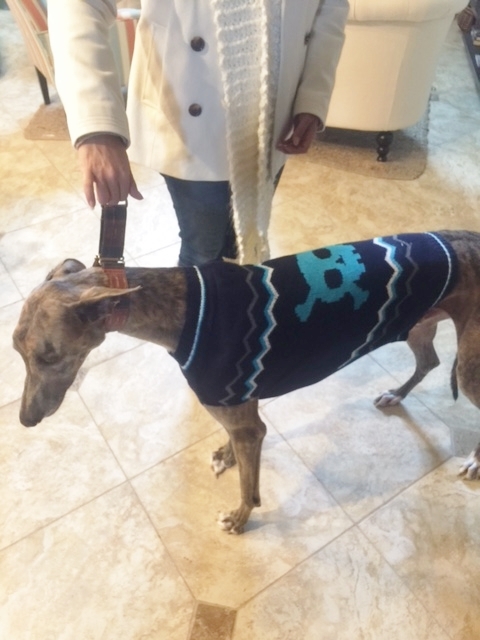 March 7, 2016 - Handsome has been adopted and is living with the Kings and their other Greyhound Avalanche. 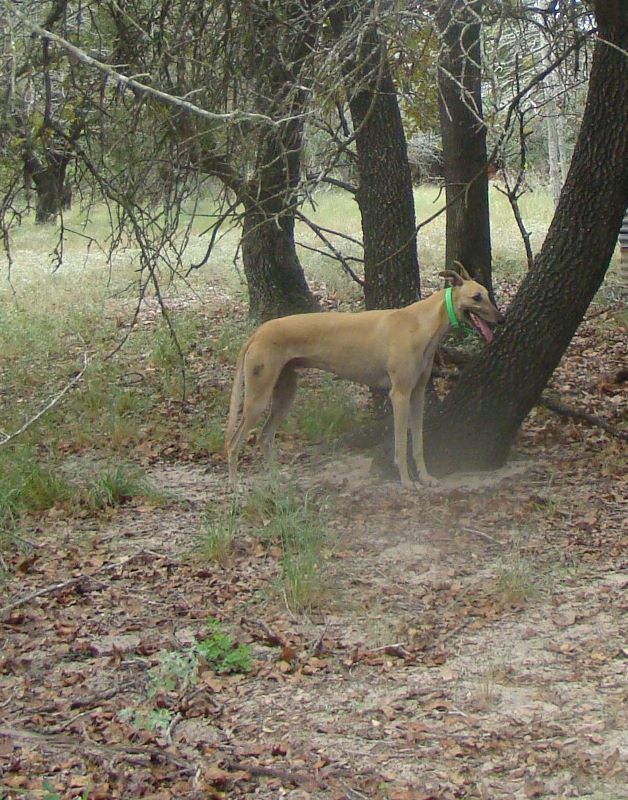 Handsome is an avid lure courser and has his field championship. 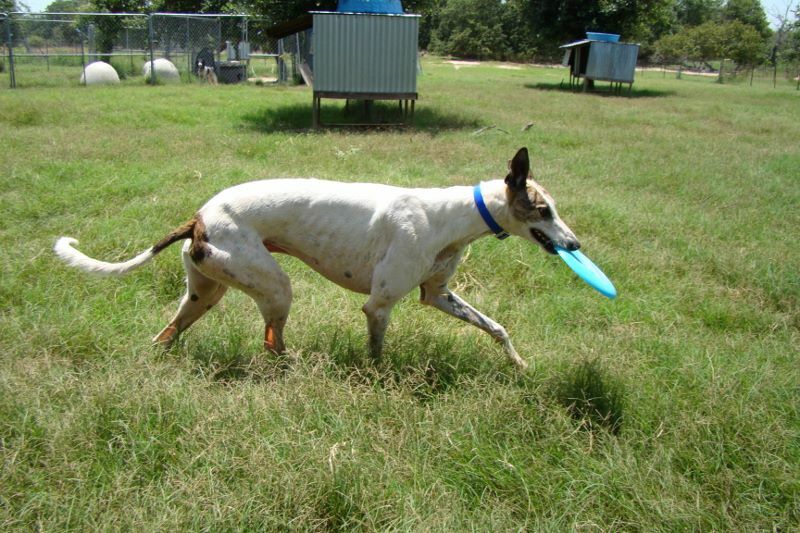 Avalanche is working on his. 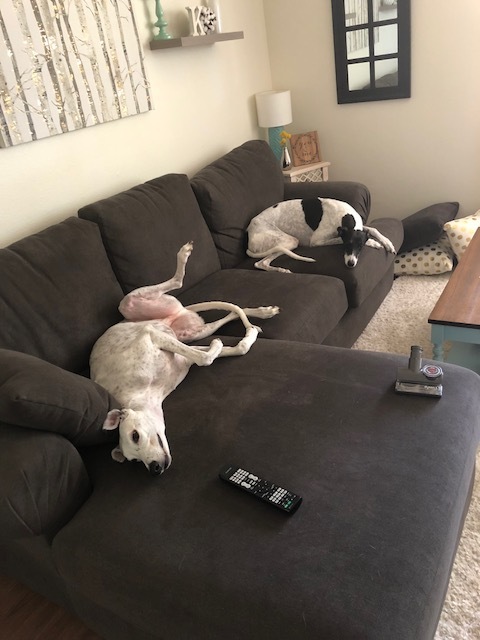 They run hard and sleep hard. Handsome when he was at Bexata. He loves to steal dad and mom's shoes. 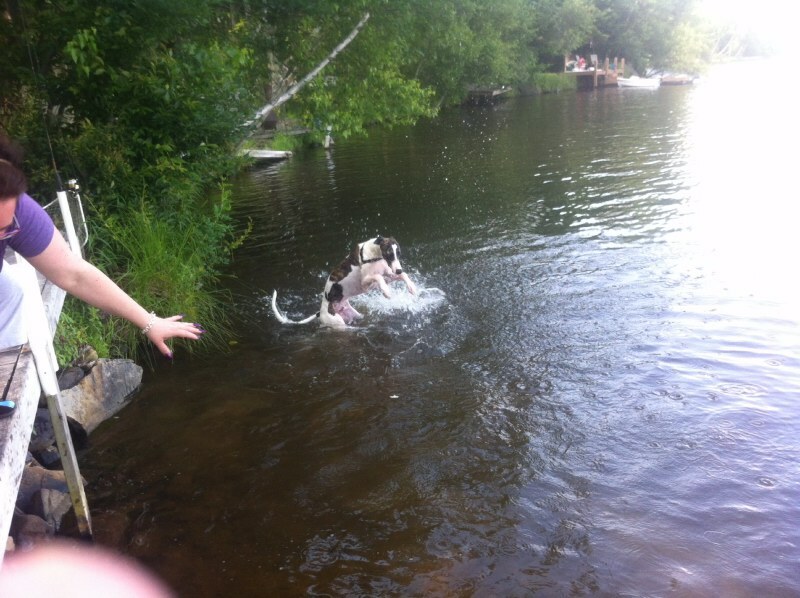 He also loves his swimming hole! 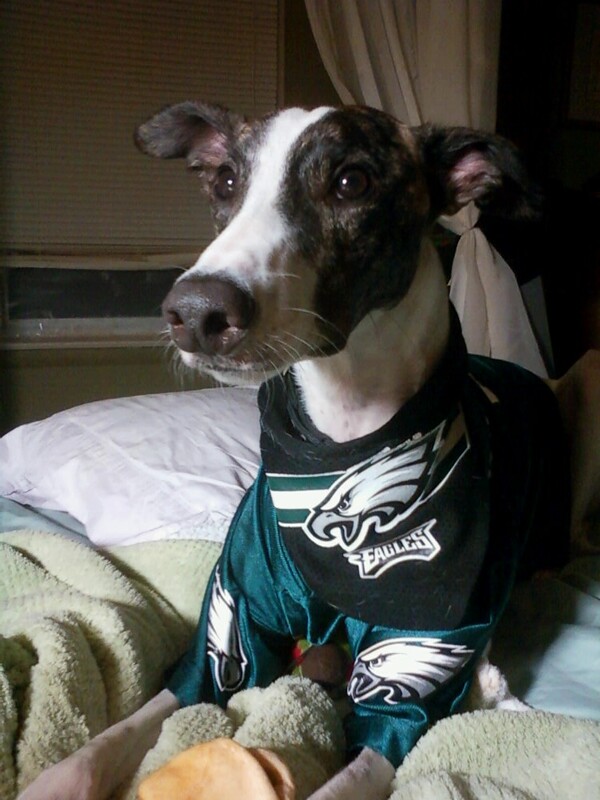 He's an Eagles fan . That's a king size bed! 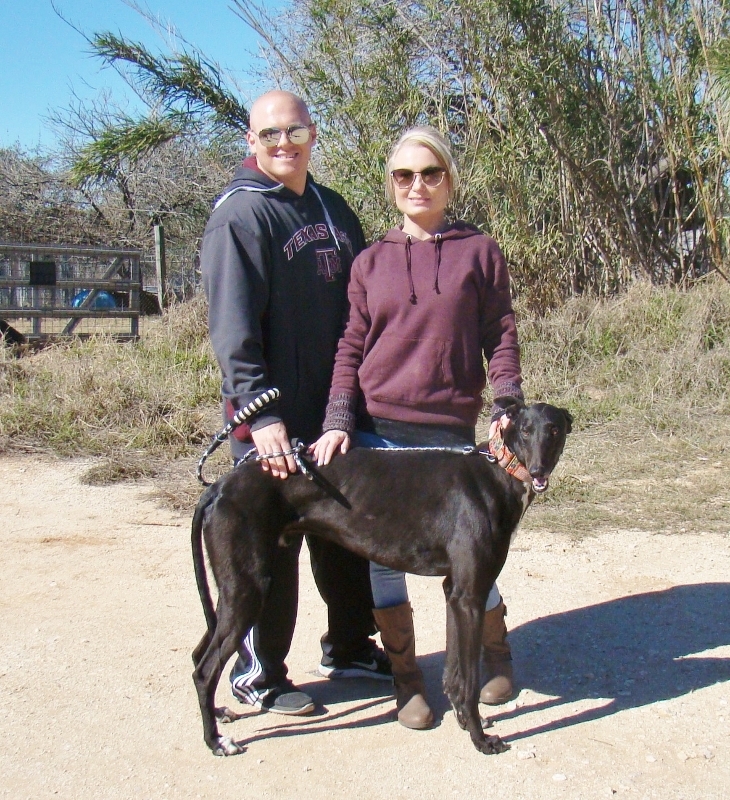 January 27, 2016 Brian and family recently adopted Leon. 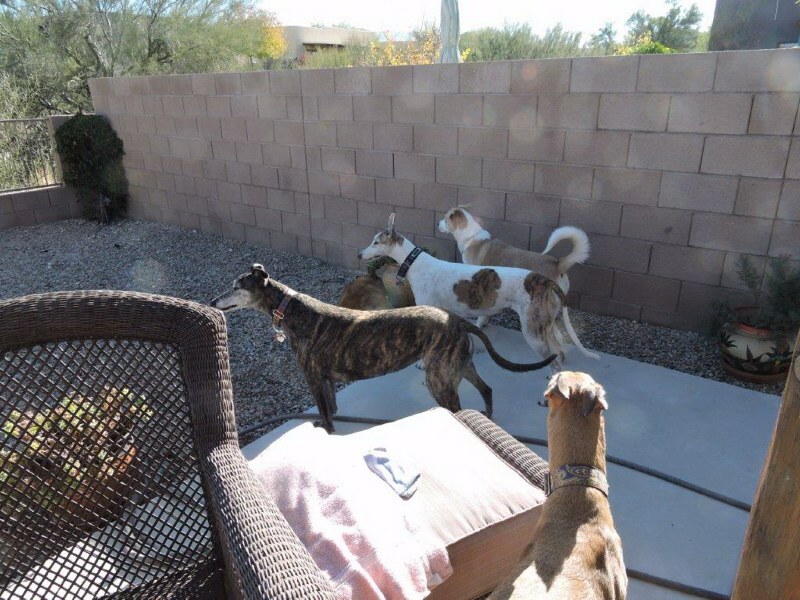 Bexata Greyhound Lexi and hairy friend, Saffir, chase the laser light at the Parrigin home in El Paso. 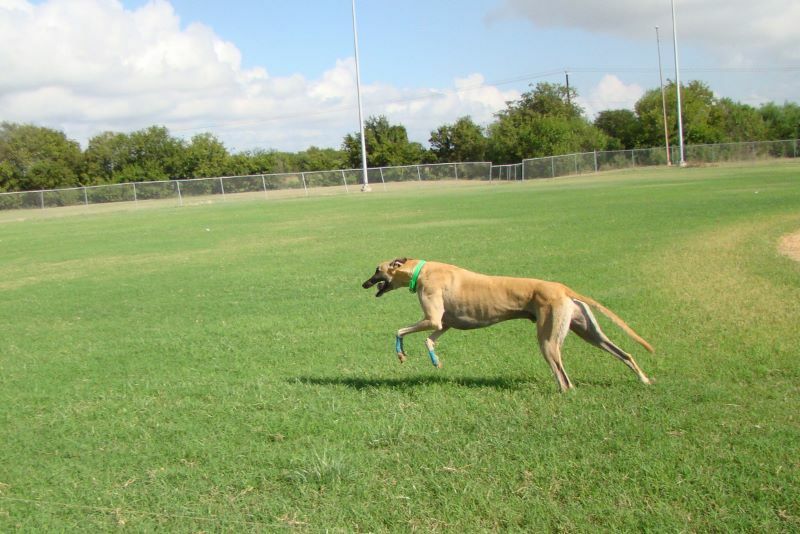 Bexata Greyhound Carrie just kind of watches them from the bottom left of the picture. 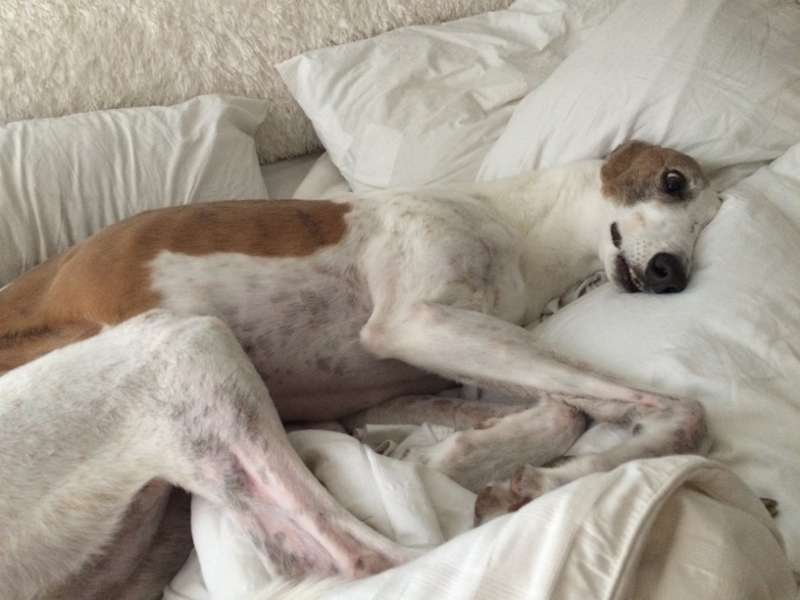 January 21, 2016 - Happy days for Leon! 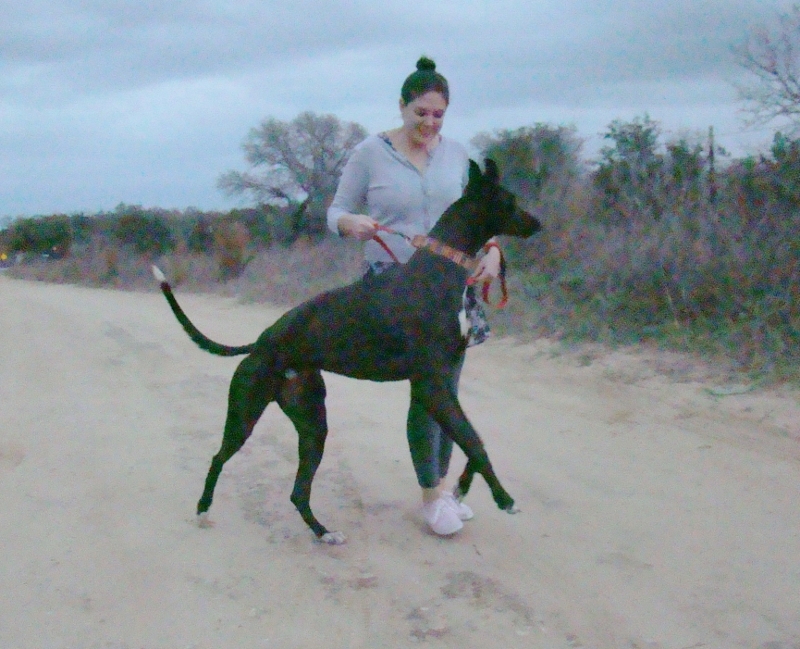 Just wanted to update you on Leon, he is doing awesome eating, drinking and really enjoying his walks. Today's walk ended with a short jog with me. 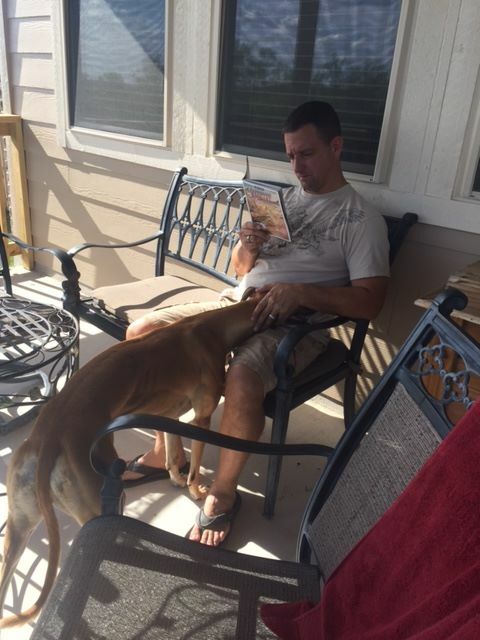 After his morning walks Lila takes him in the back yard so he can drink, go potty and just hang out a little while she reads. First couple days he would walk close to her as to say pet me please, today he is putting his face in front of her book lol like here I am. So I am sending you a couple update photos also. Sherry: I hope this finds you and all your dogs doing well. 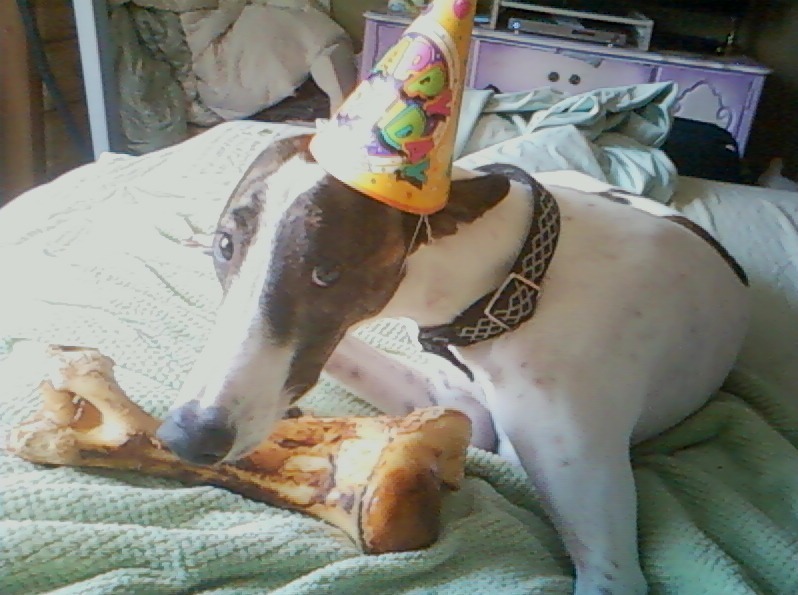 Attached are some pics of Hilo. We moved up to Reno from Las Vegas this summer. Hilo loves the snow as well as the couch. 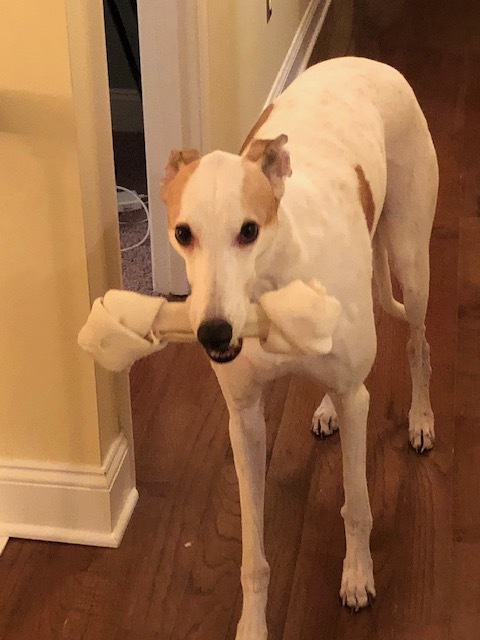 He is such a sweet boy- not a mean bone in his body that's for sure. Hilo's paw prints in the snow. 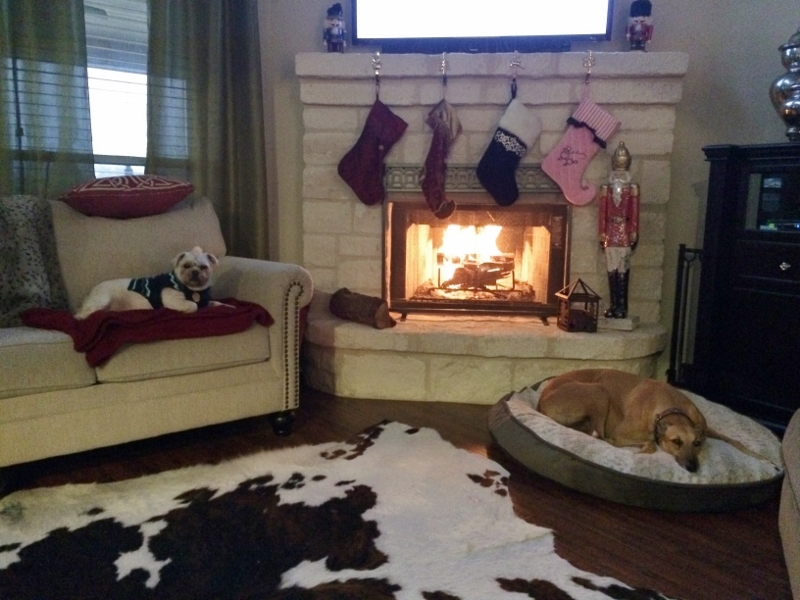 Back in the house getting warm and toasty. 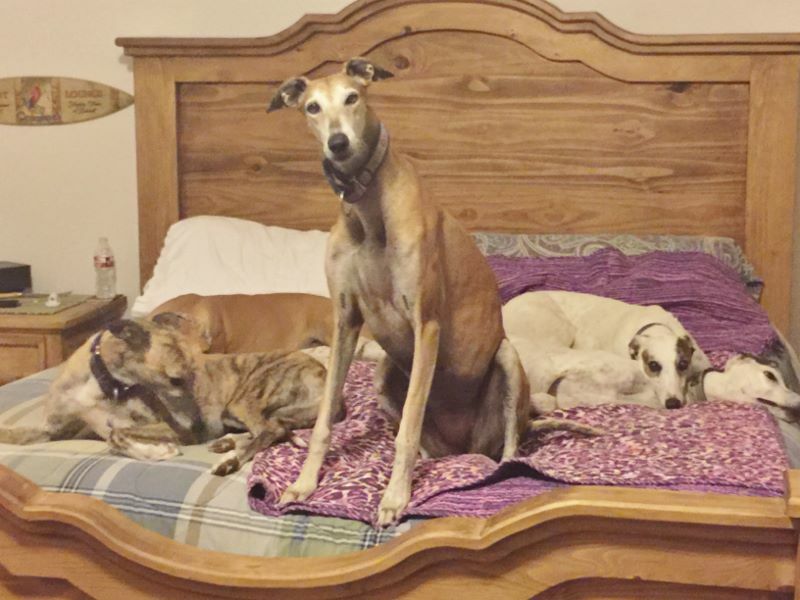 Leon has a family of his own. 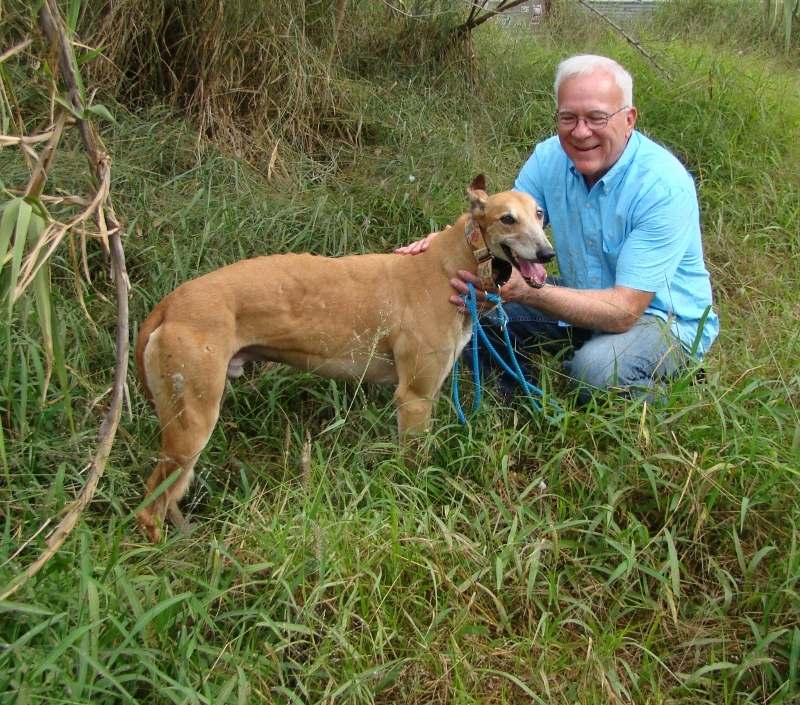 He has been at Bexata a while until he found a family he chose and would call his own. This is the Davis family and friends. This is truly a match made in heaven. 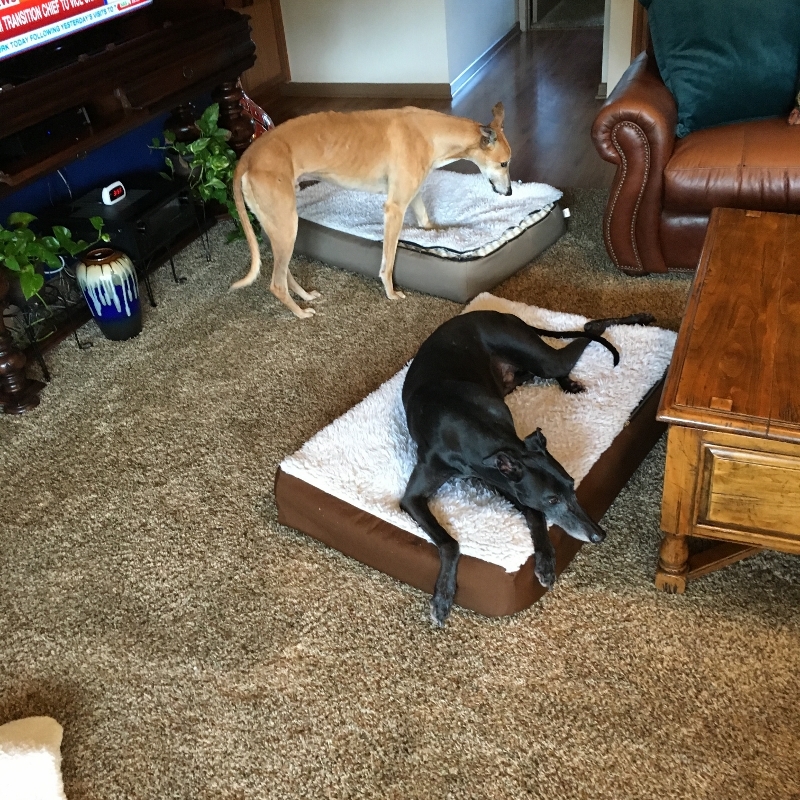 December 31, 2015 formerly Bexata rescue Greyhound girls adopted by the Hanzelka family. 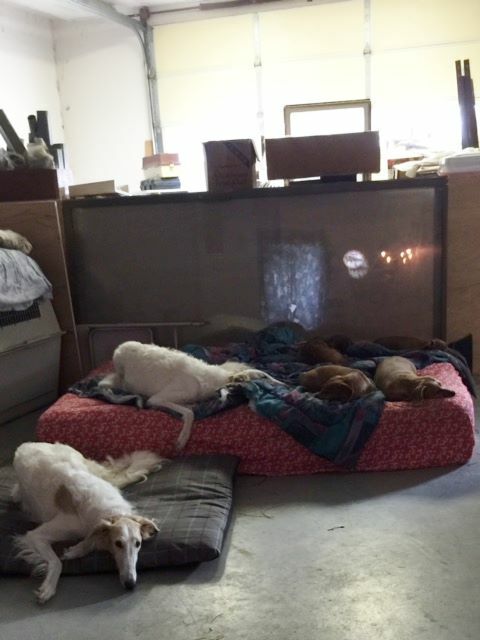 Left to right - Luna, Rosie, Foxie and Willow. We have taken to calling him Frank the Tank. He is soooo sweet! 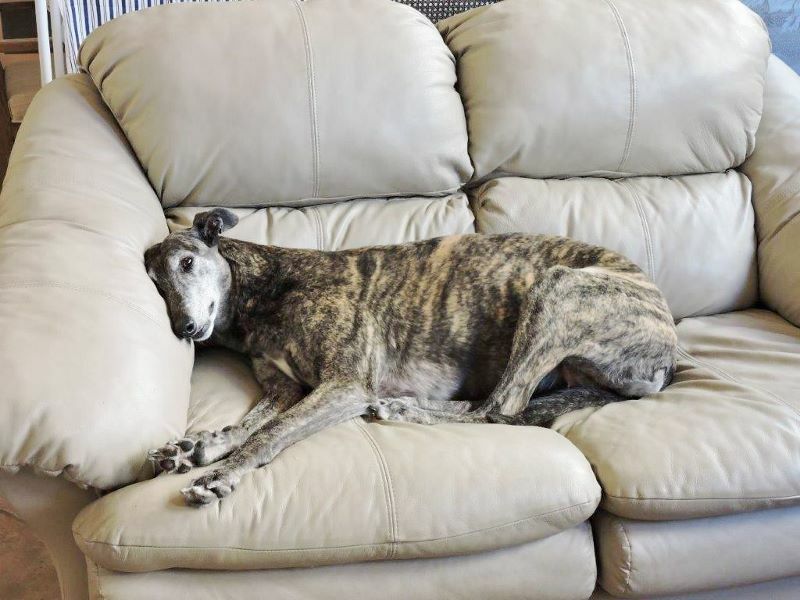 He spent the day yesterday moving between the couches and his bed to try and find his special spot. 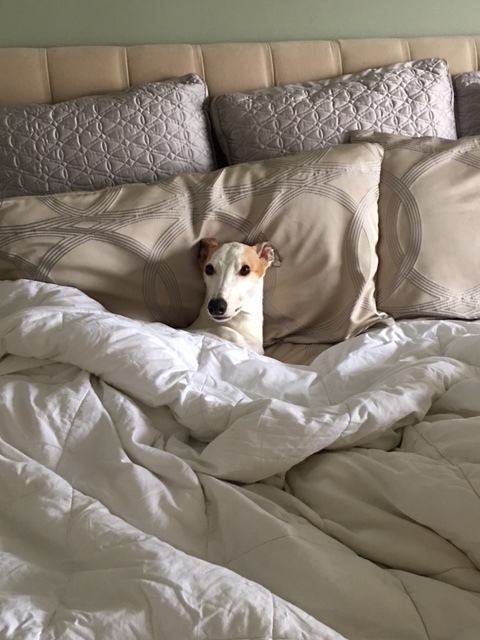 This morning when I got out of the shower I found him on our bed. I think he likes us! 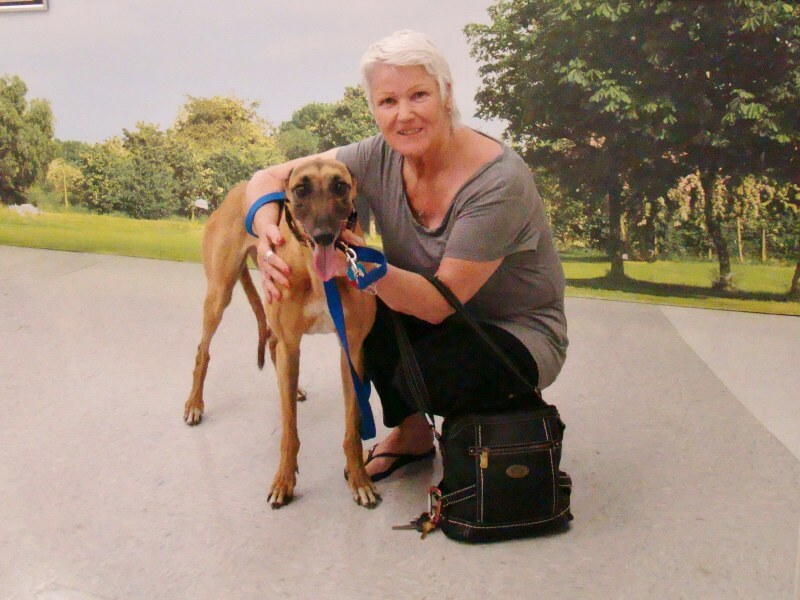 Pictured with his new mom Amy. In the woods at Bexata. 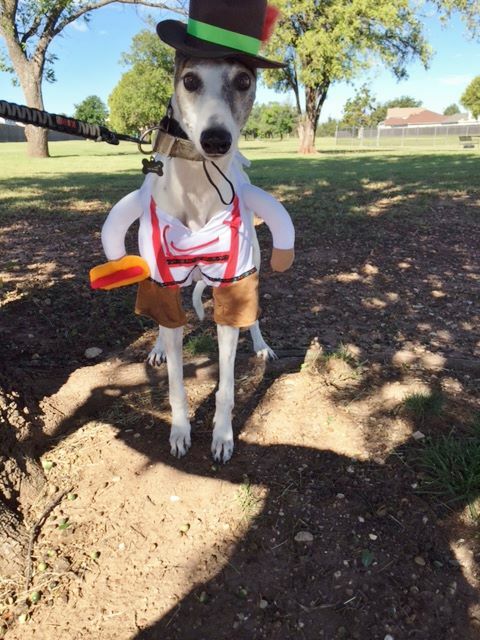 Francis enjoyed himself at the park. 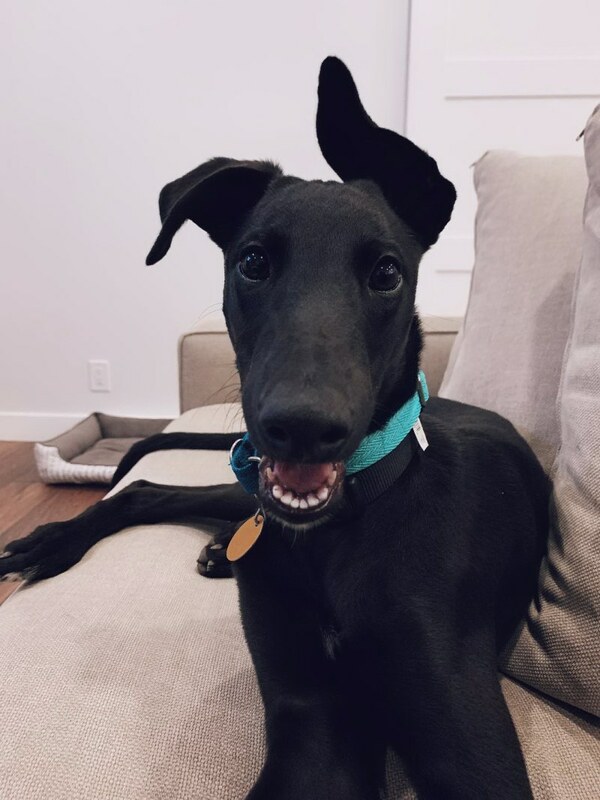 Francis is a big handsome friendly boy. 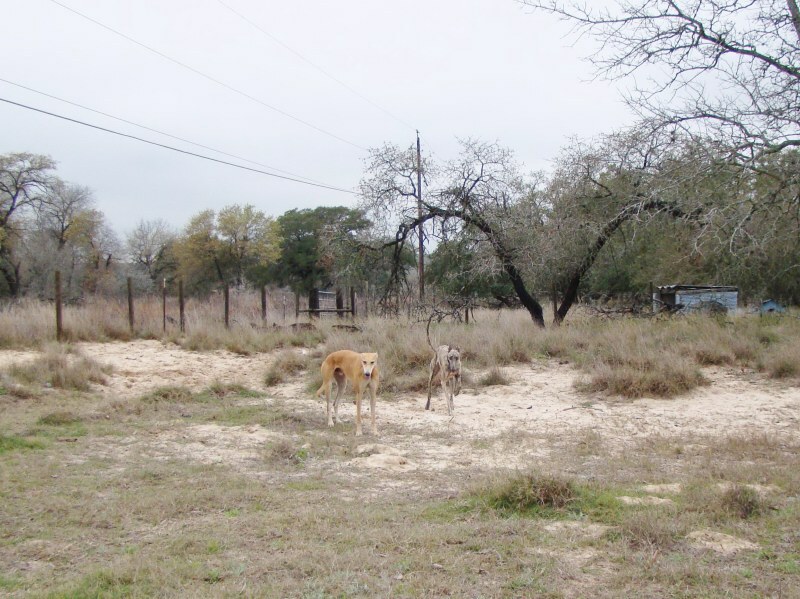 He was living with a family (see picture below), until their fencing was removed and, with an autistic child and school starting, they just didn't have time for him any longer for exercise, etc., so he came back to Bexata. 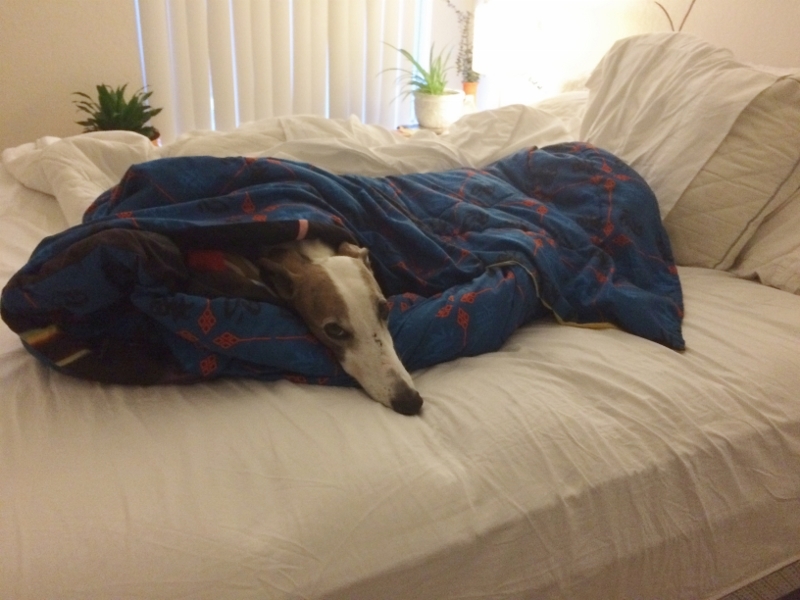 another day - what a good natured boy. 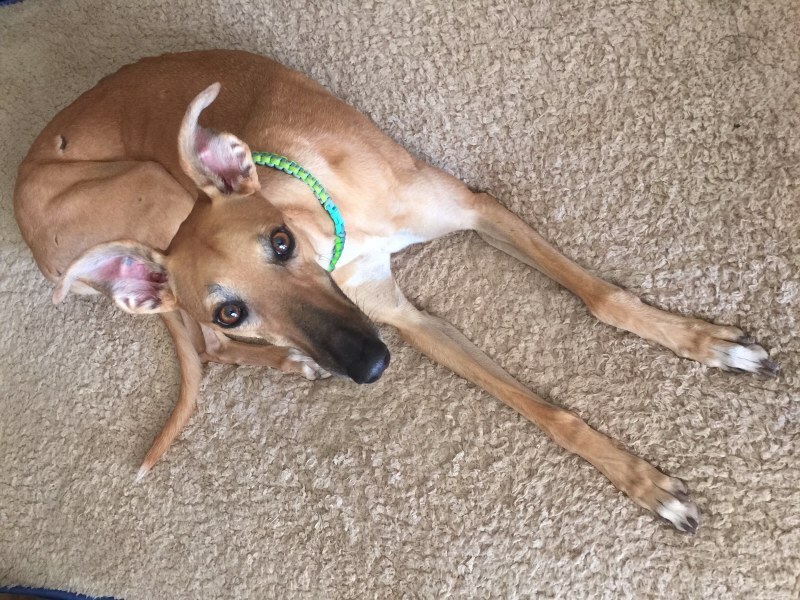 He is a great dog accustomed to living with children and small dogs. He lost his home because things changed in the family's life, through no fault of his own. 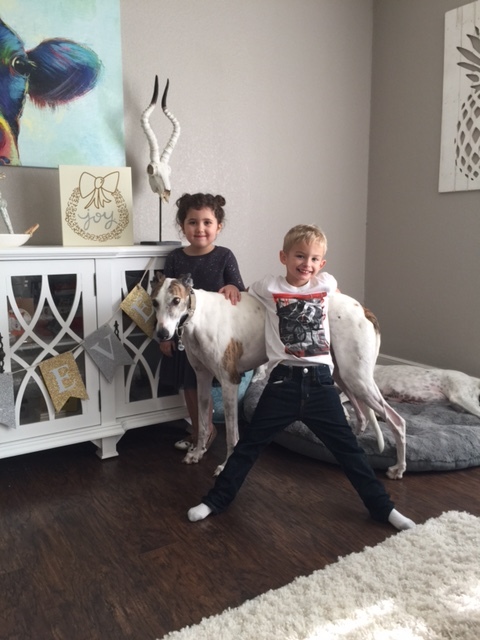 December 26, 2015 Rosie the senior Greyhound was adopted and now living with her new "sisters" Luna, Foxie and Willow. Didn't take her long to learn the dog door and the bed. 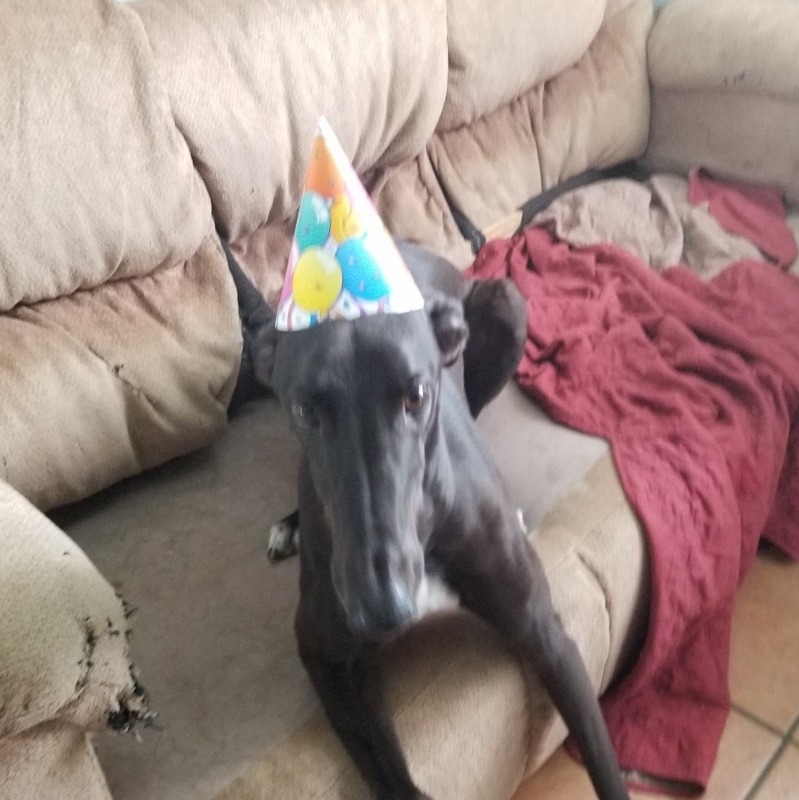 What a great day for Rosie! 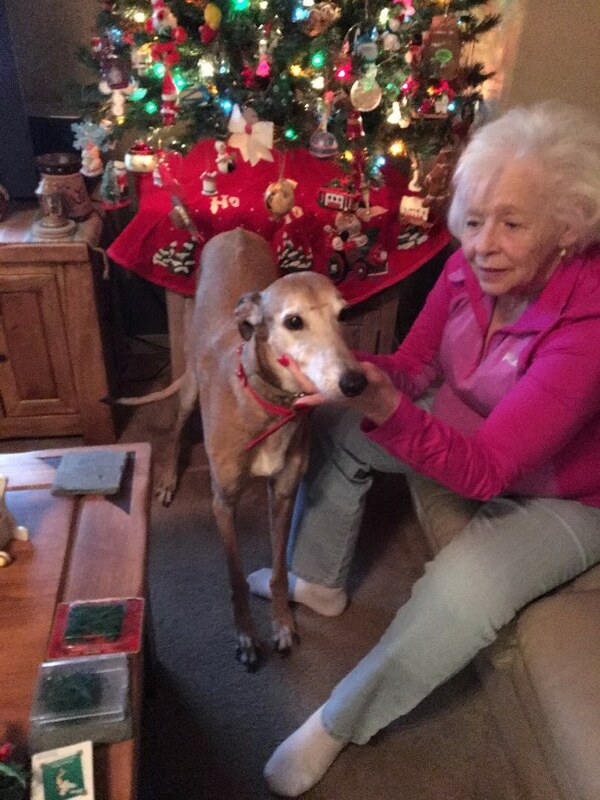 December 25, 2015 - Merry Christmas Lexi and Carrie in their Christmas collars. November 24, 2015 HAPPY BIRTHDAY CARRIE! 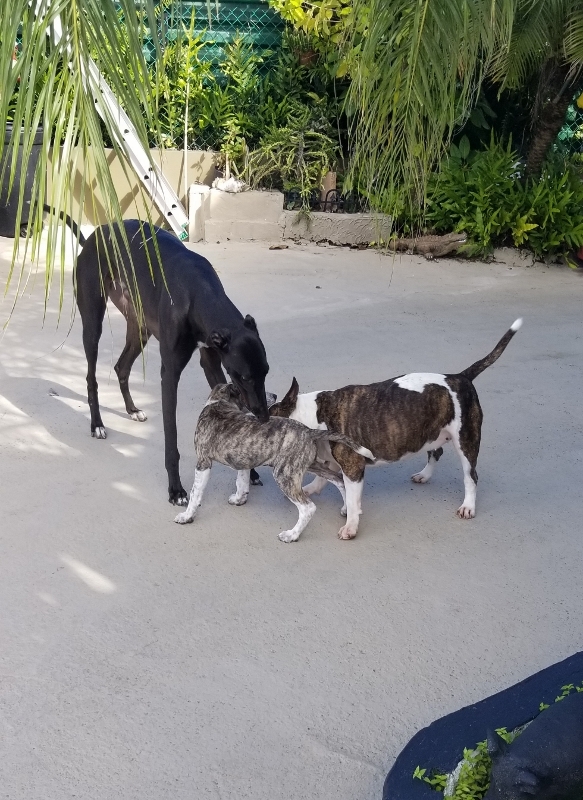 (Brindle in the middle) shared her birthday ice cream with her sisters. 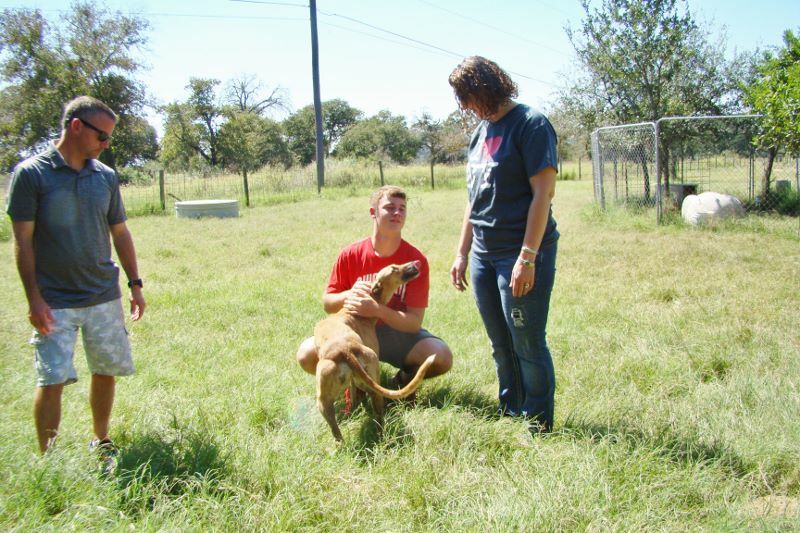 October 21, 2015 Tiger Boy and family. 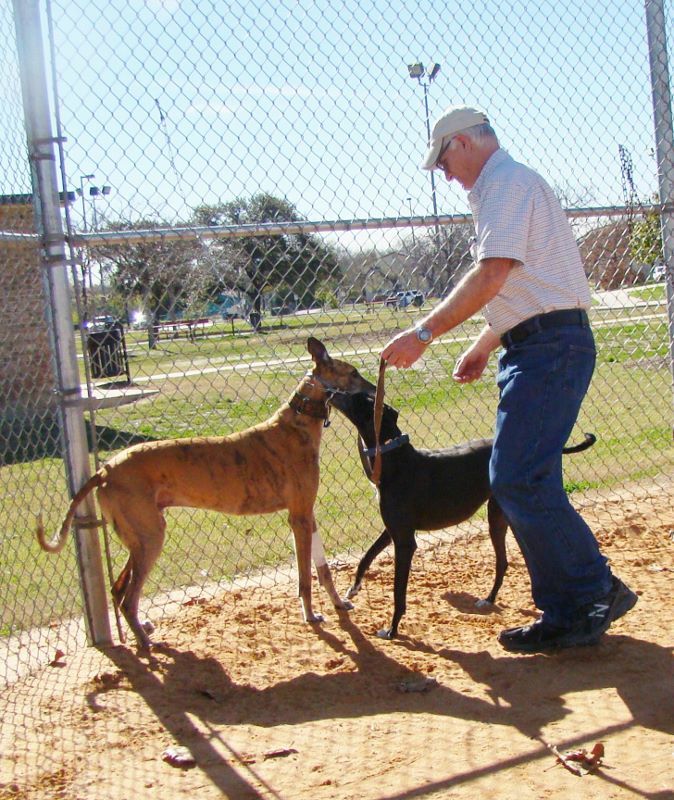 His best dog buddy is a 13-year old blind Boston Terrier. 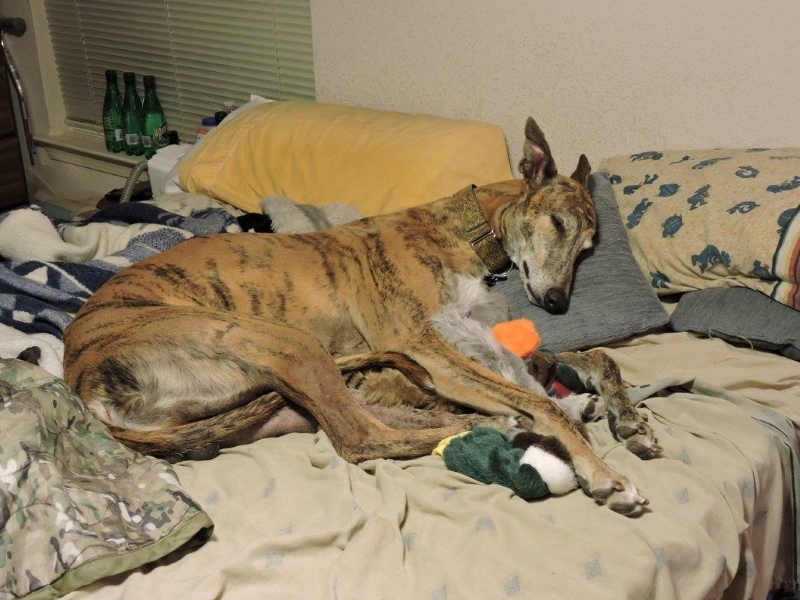 Tiger Boy Lohmeier has made himself completely comfortable in his new home. 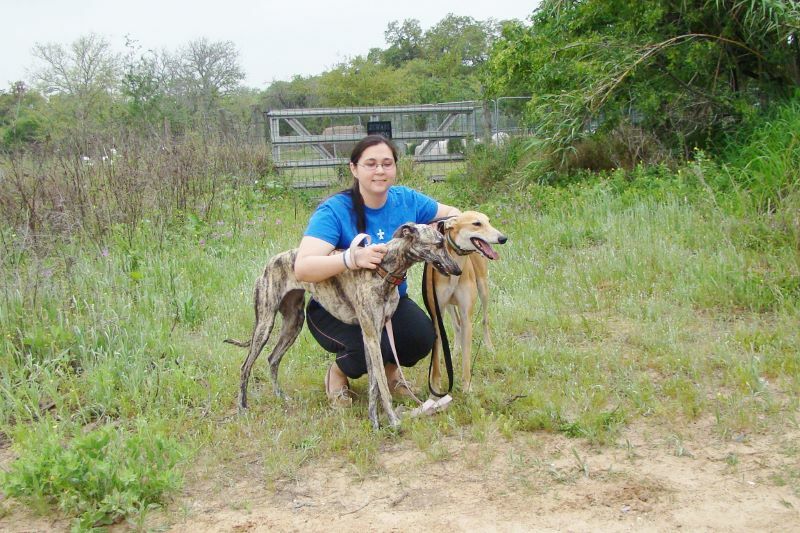 September 9, 2015 - Greyhound Tiger Boy (brindle boy on the left) has been adopted and will leave for his new home at the end of September, after his neuter and recuperation. Lexi Parrigin (left) turned five, so she got the first licks of her ice cream cupcake. Carrie Parrigin (right) got to share. 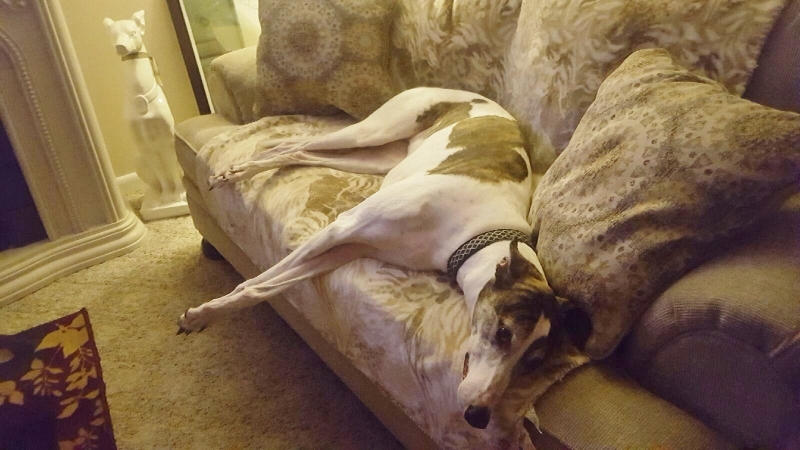 September 1, 2015 Daisy Bond has learned all about the couch! 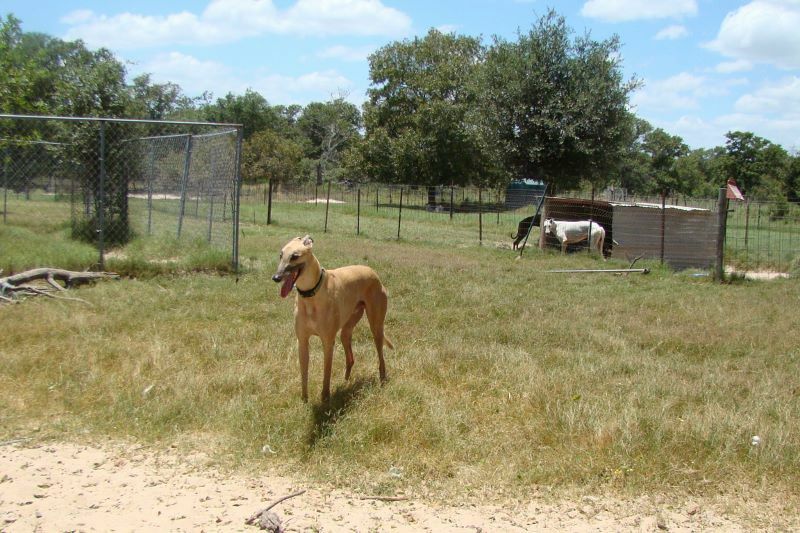 Daisy in her new yard with her new little girl, Nicole. 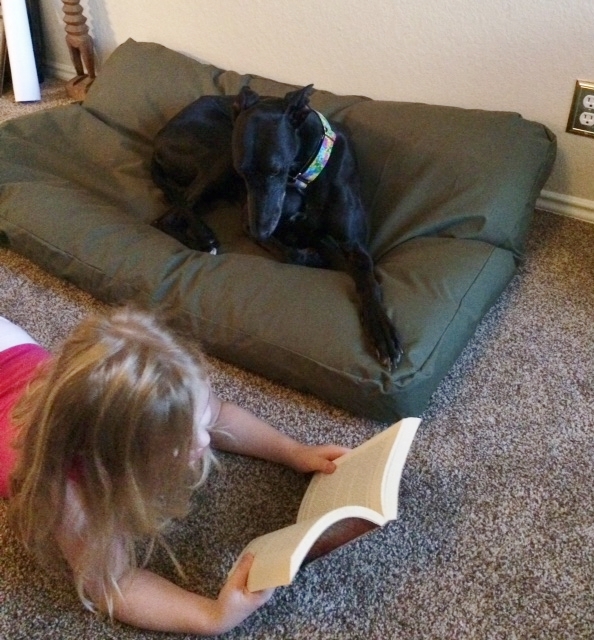 May 21, 2015 Bexata Carrie and Bexata Lexi enjoying the good life visiting grandma Parrigin's house. 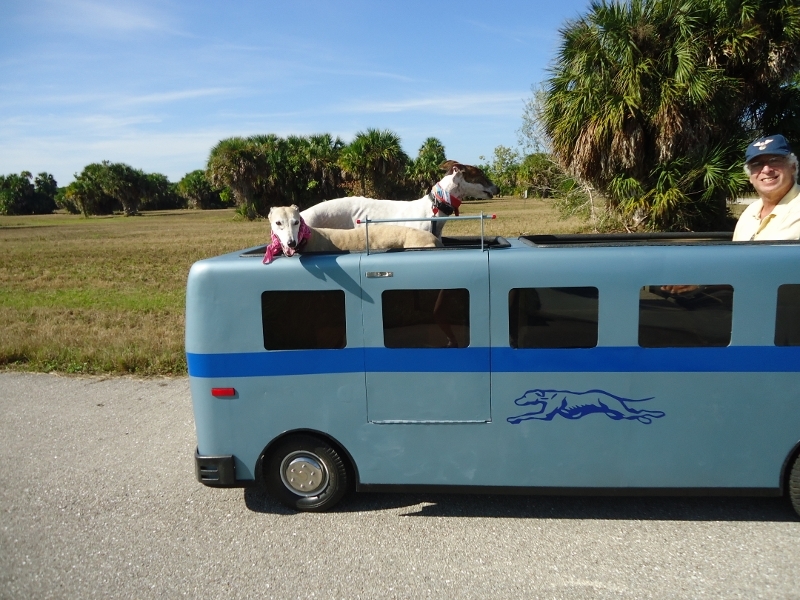 Lola lives there, so she always has the good life! 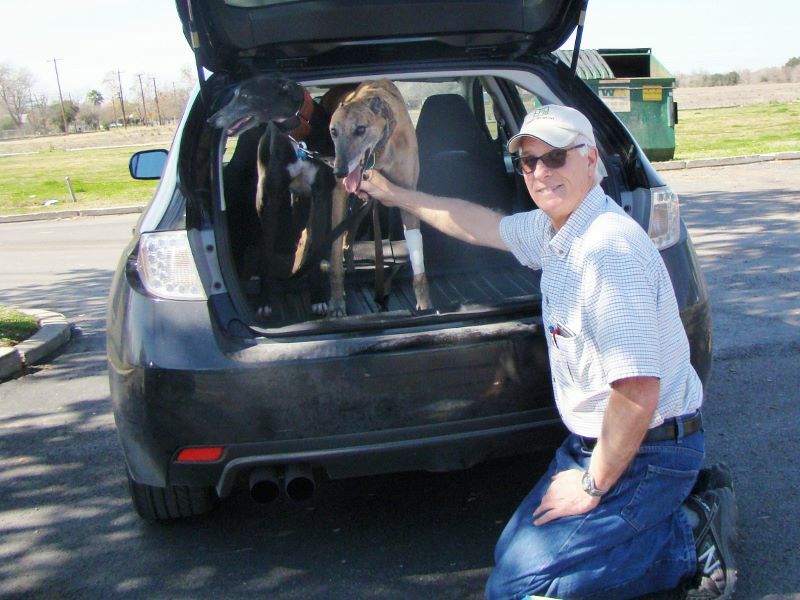 April 3, 2015 Brian came by to pick up his adopted Greyhounds, Pepsi and Trace. Pepsi is from Bexata. 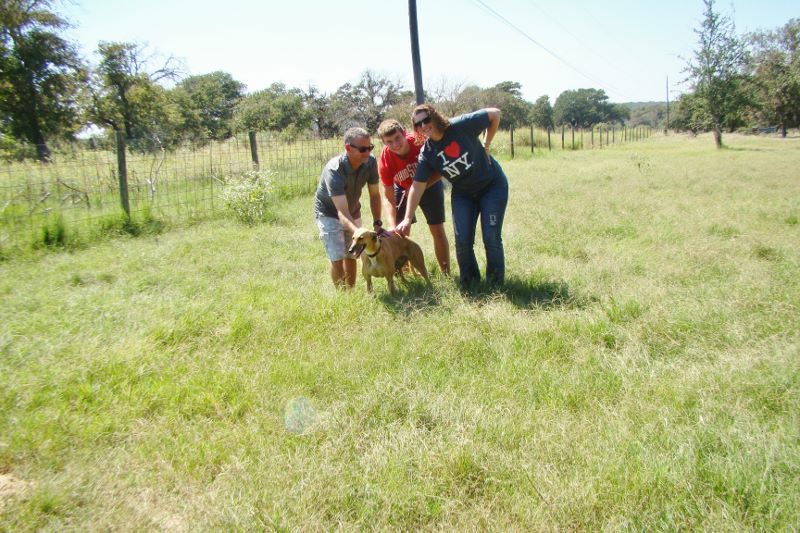 They were visiting while Brian was out of town, which I do for my adopters, and pictured after Pepsi and Trace had a good run in the pasture. 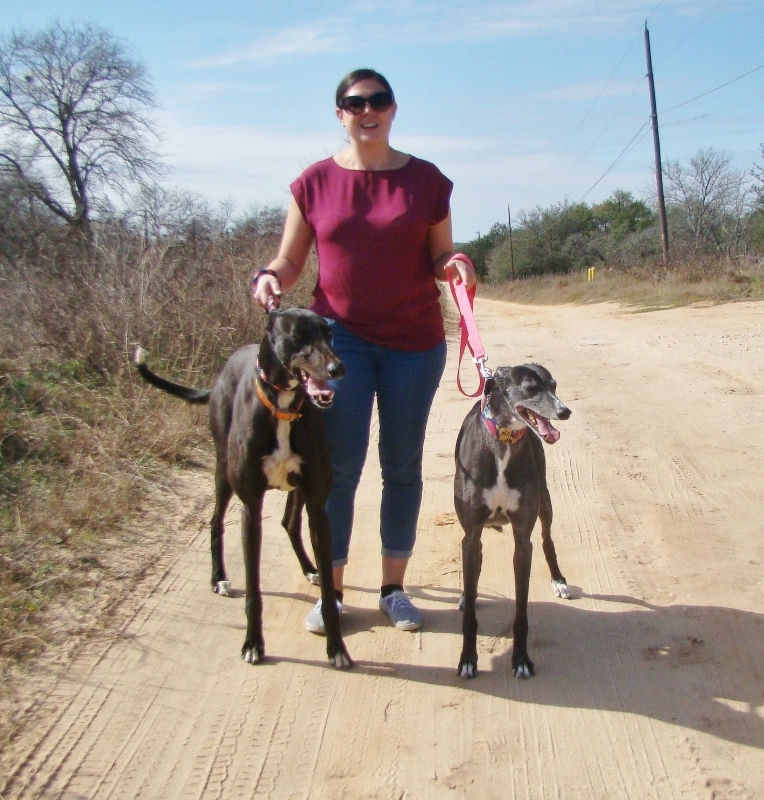 April 2, 2015 - Mom, Lara, with Frannie and JD (Happy). 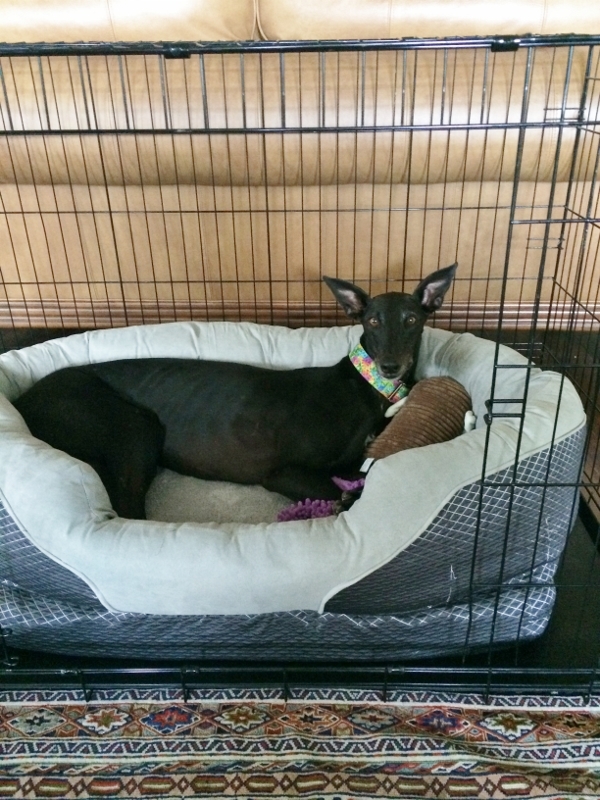 Frannie was spayed and recuperating at Bexata until she could go home today. 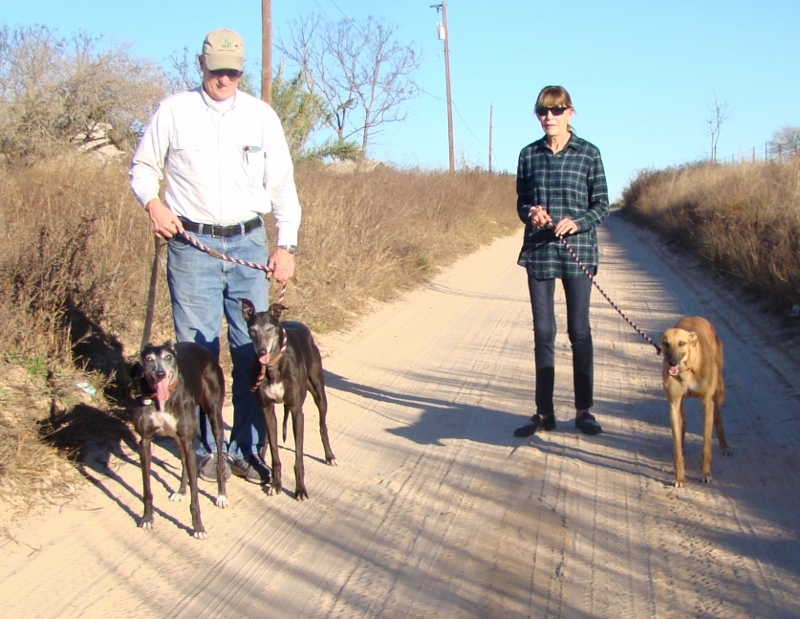 The kids will be going north sometime toward the end of April. 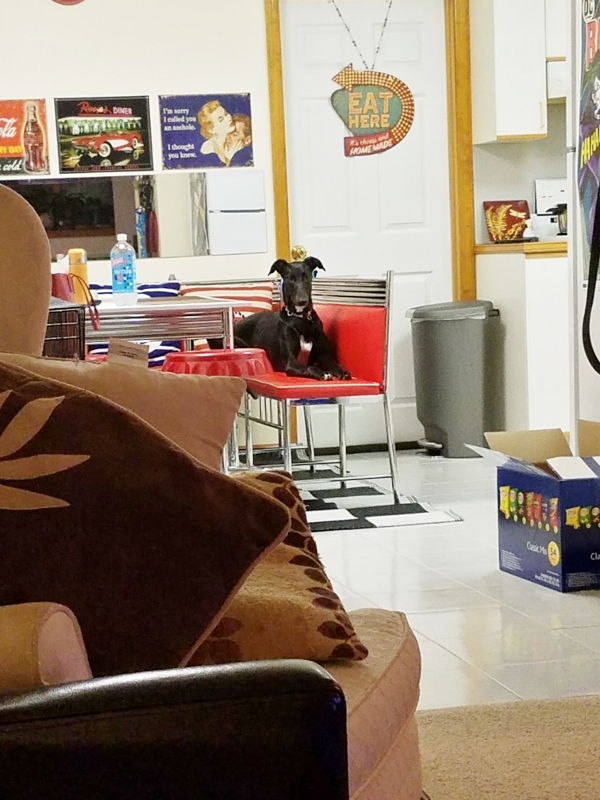 February 26, 2015 Carrie and Lexi hanging out in the garage while Dad fixes a ceiling fan. 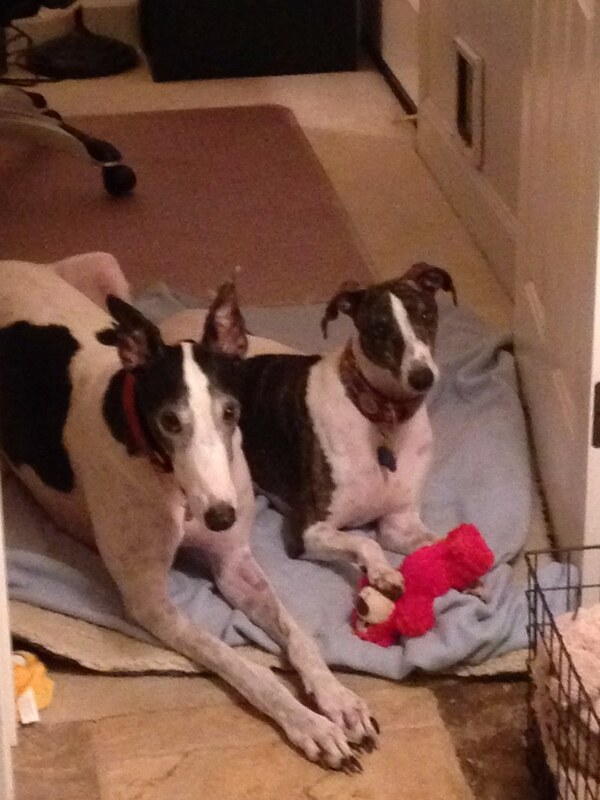 waiting for mom to give them their morning hard boiled eggs. 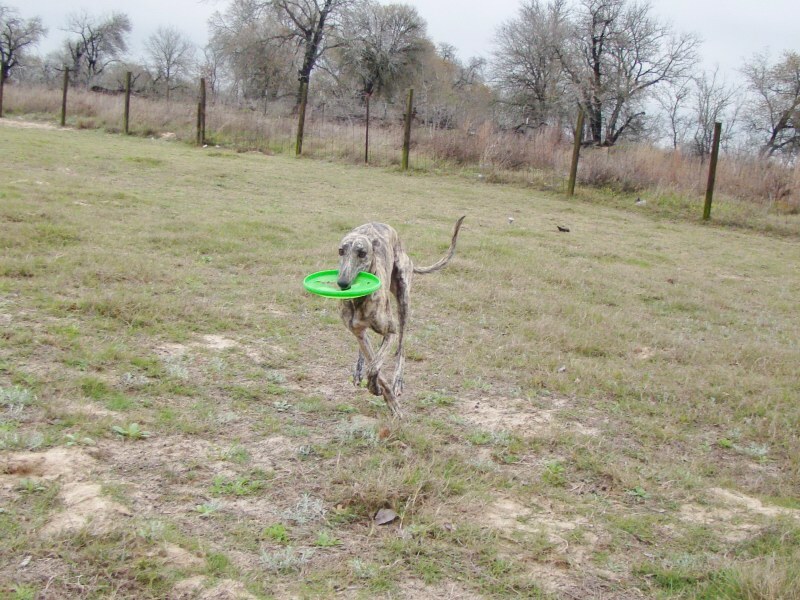 for lure coursing practice. A good time was had by all. 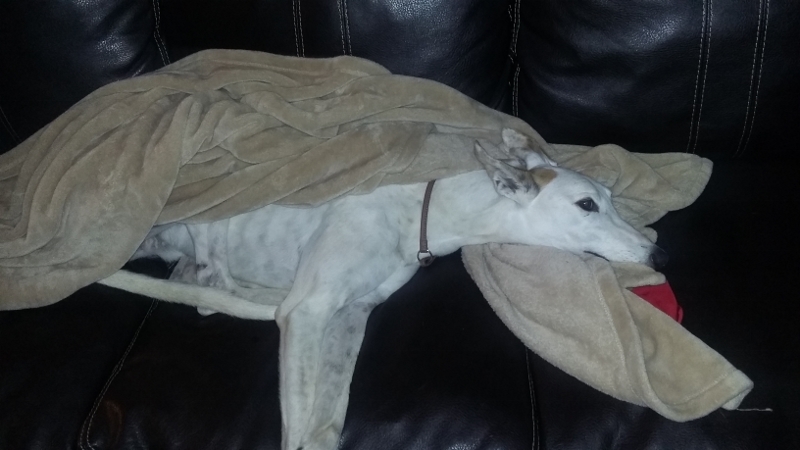 February 12, 2015 Willow relaxing at home. 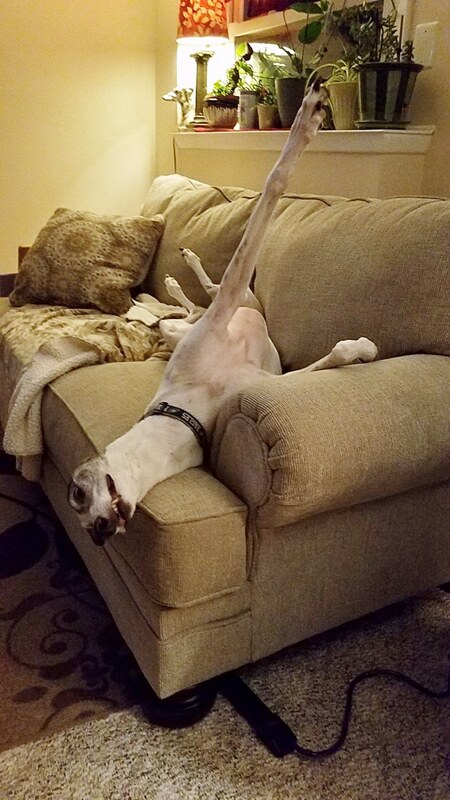 This seems to be a favorite Greyhound pose. February 11, 2015, Pork Chops in Michael's SUV. 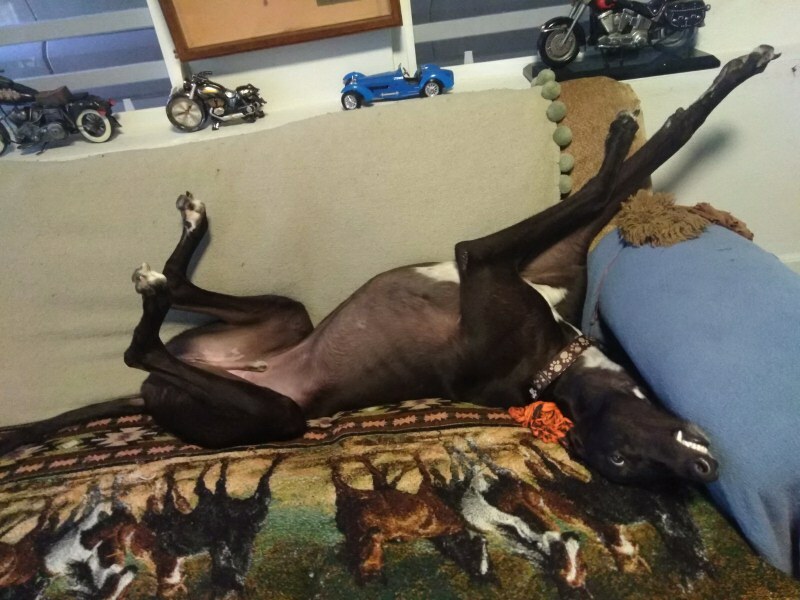 Angel's Bori in Mexico in his favorite sleeping position! 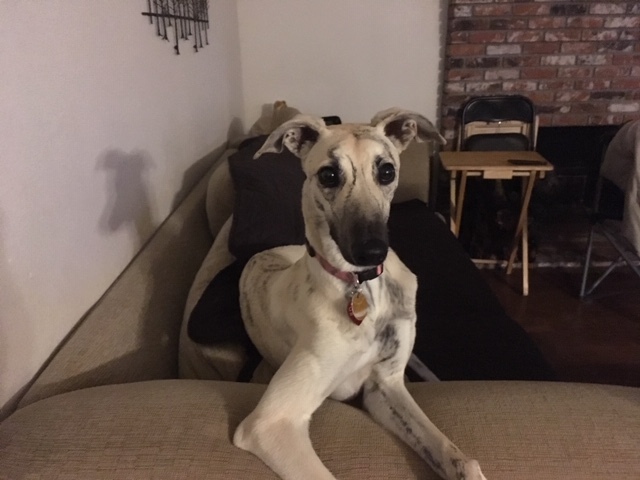 Holly loves the shore in Queens, NY. But when she's home and can't go out, she gets cabin fever. February 9, 2015 - Holly at her best. 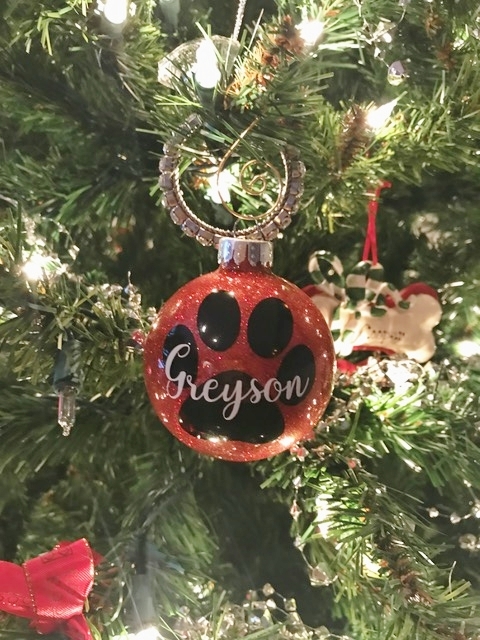 Thanks Mom Terri! 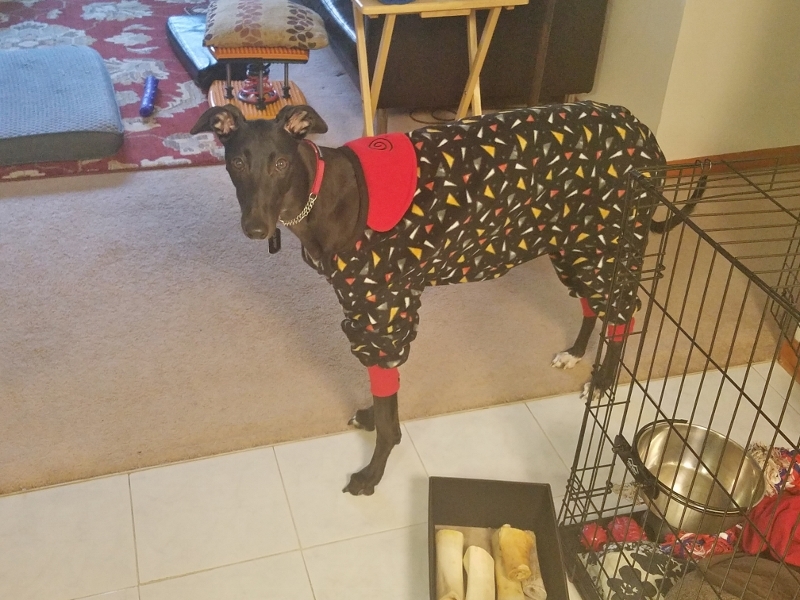 February 4, 2015 Sable in her Christmas jammies at mom Cat's house. 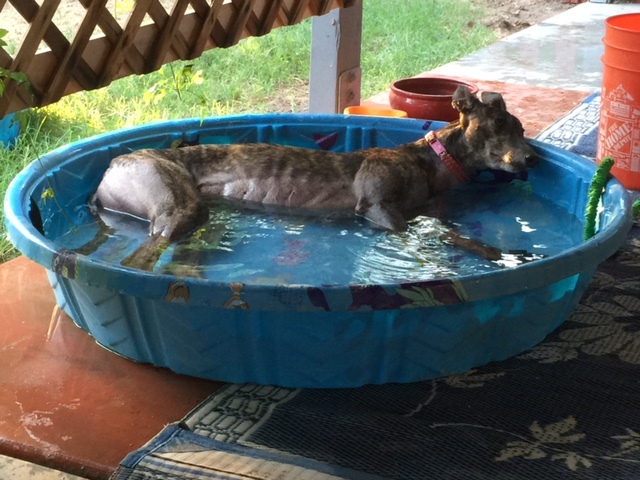 February 2, 2015 Luna is enjoying the good life at Laurie's. 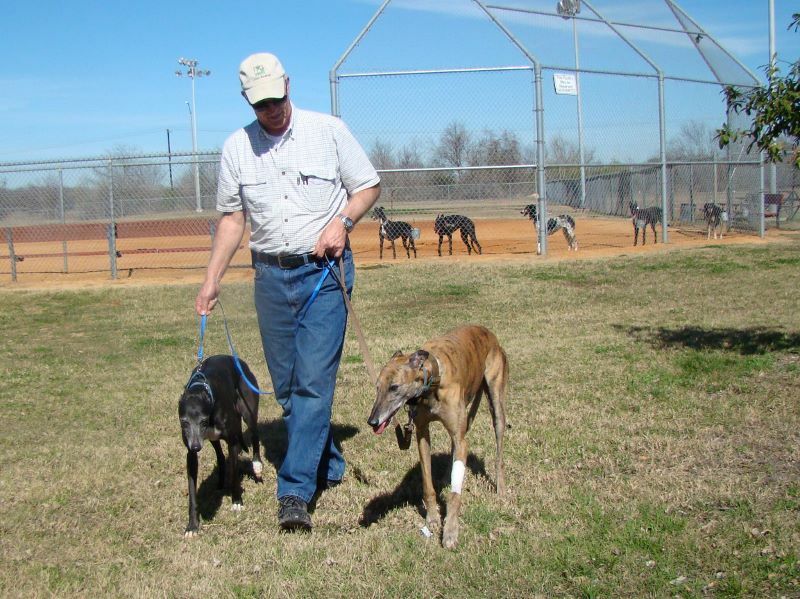 Pepsi met Brian and his wonderful retired racer boy, Trace. It was friendship right away and Pepsi went home with them. 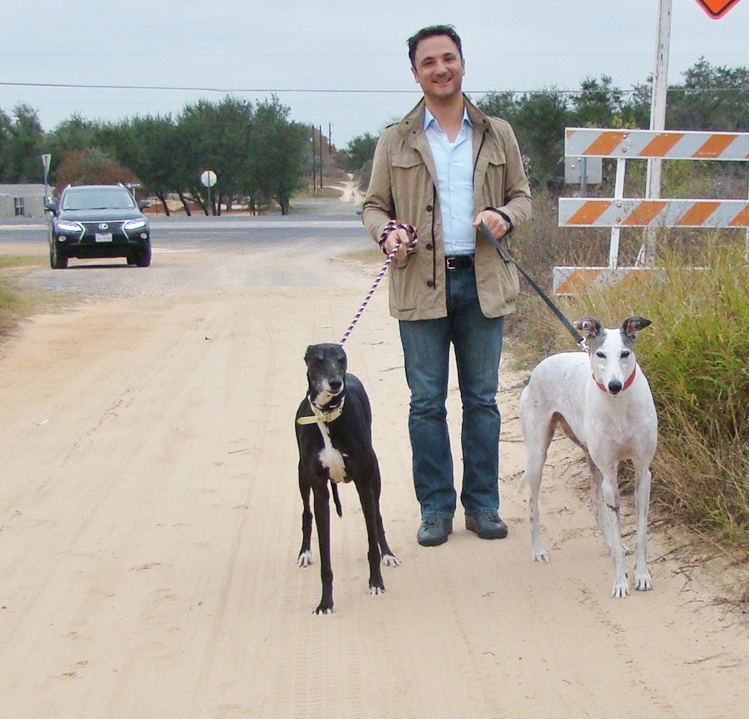 Here she is with her new Dad, Brian, and her new Greyhound friend, Trace. 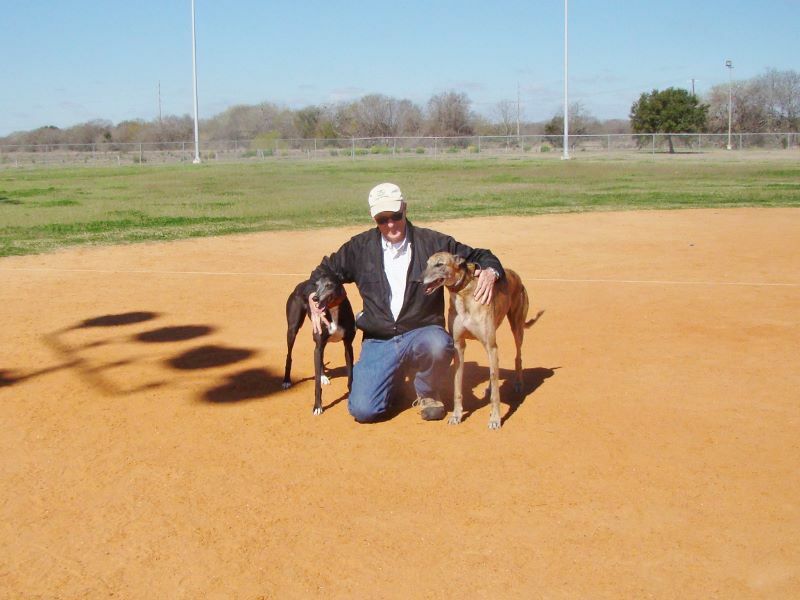 We were all at lure coursing practice where Trace and Pepsi both took a lap around the course. It was great to see the two seniors having fun. 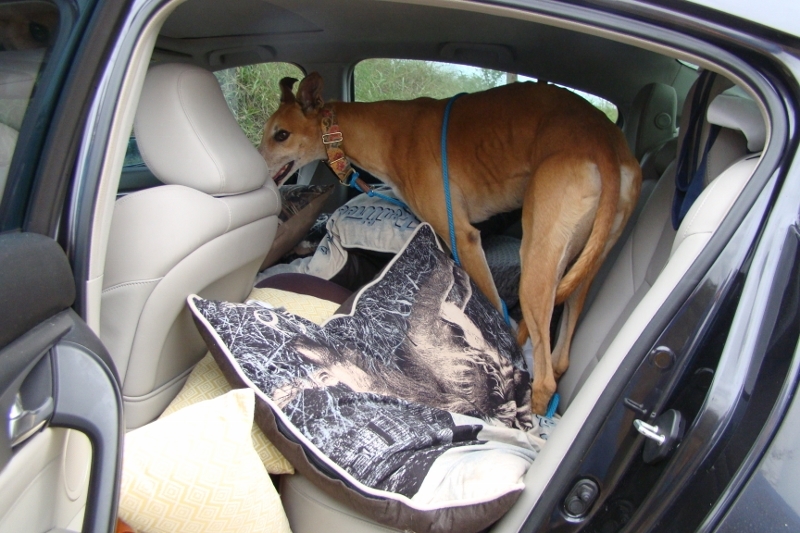 Leaving for her new home with Trace and Brian. 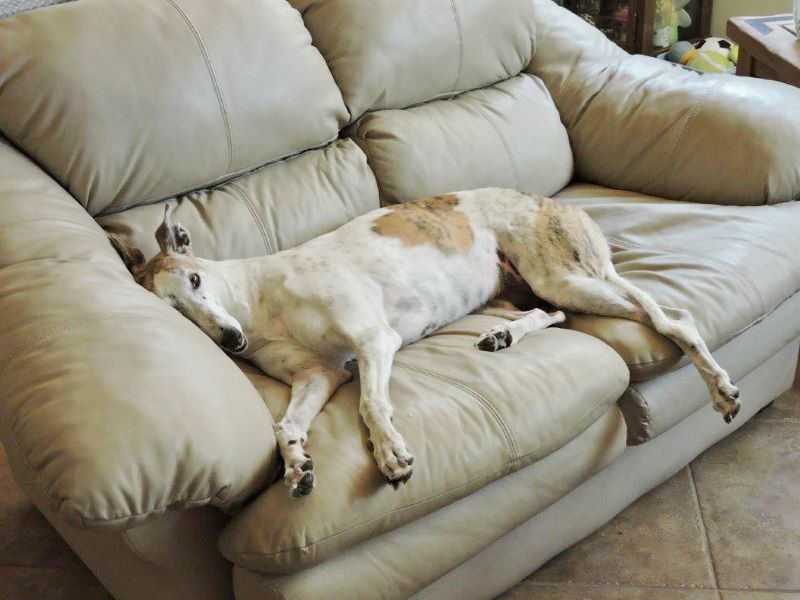 December 3, 2014 Pepsi is a senior Greyhound and was adopted.